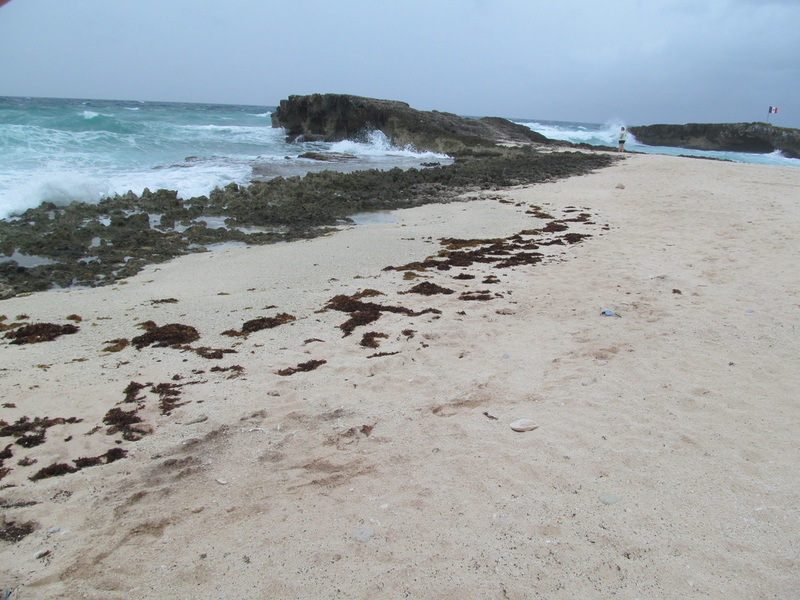 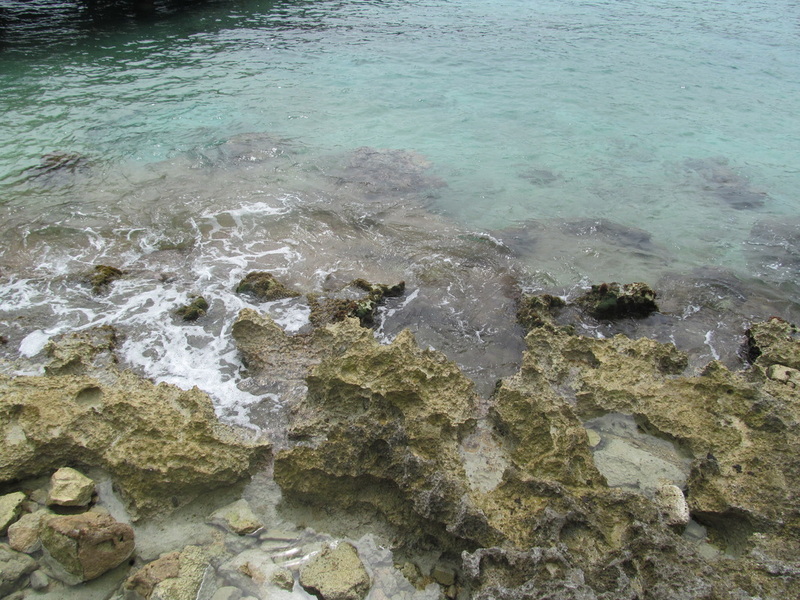 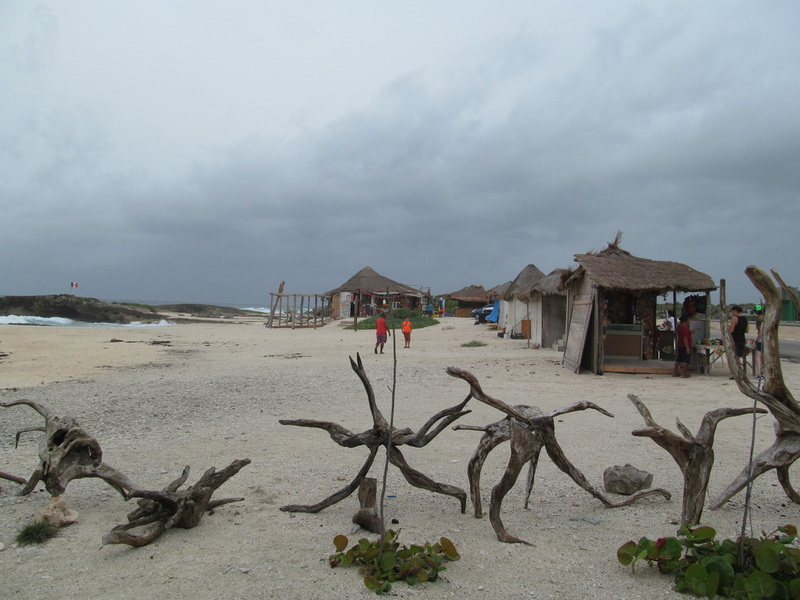 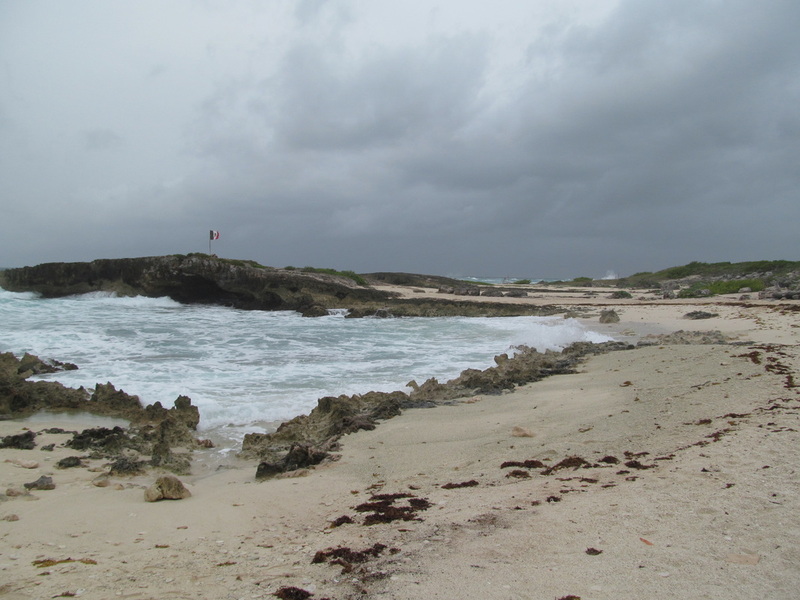 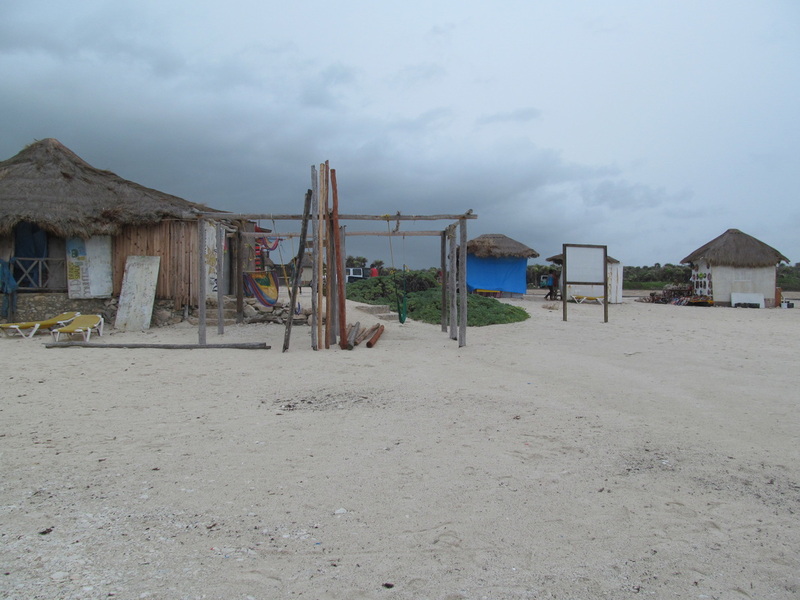 After our shore excursion left San Gervasio, our next stop was a beach. 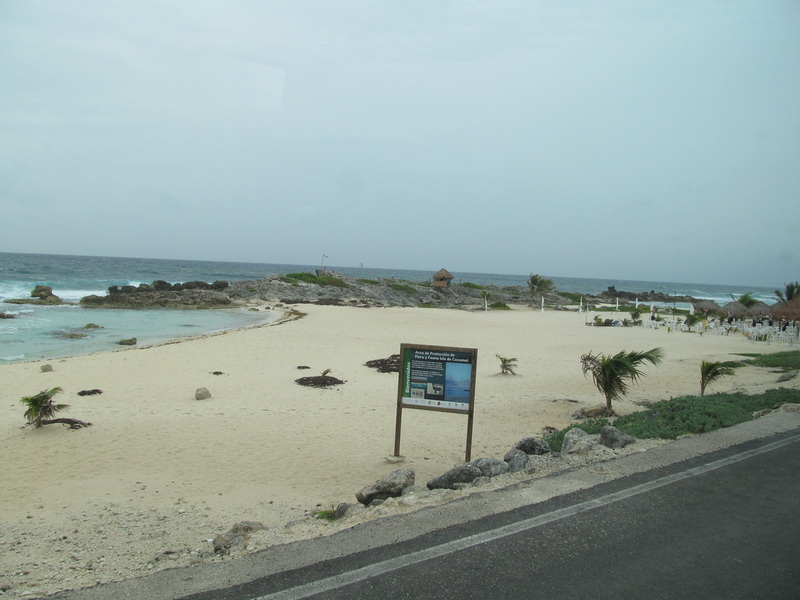 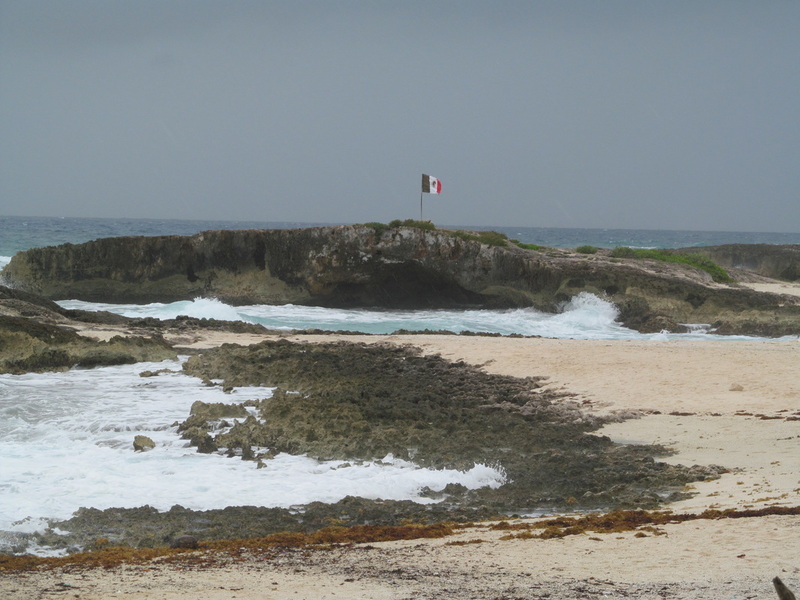 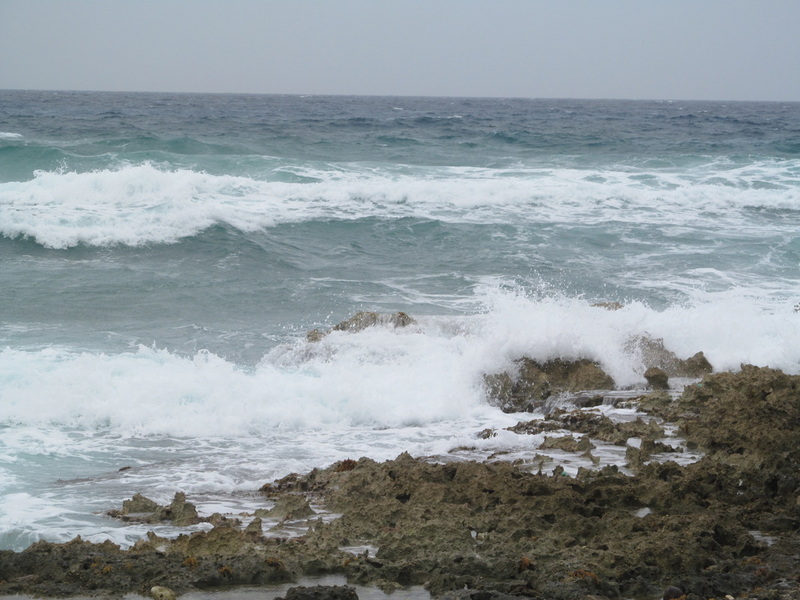 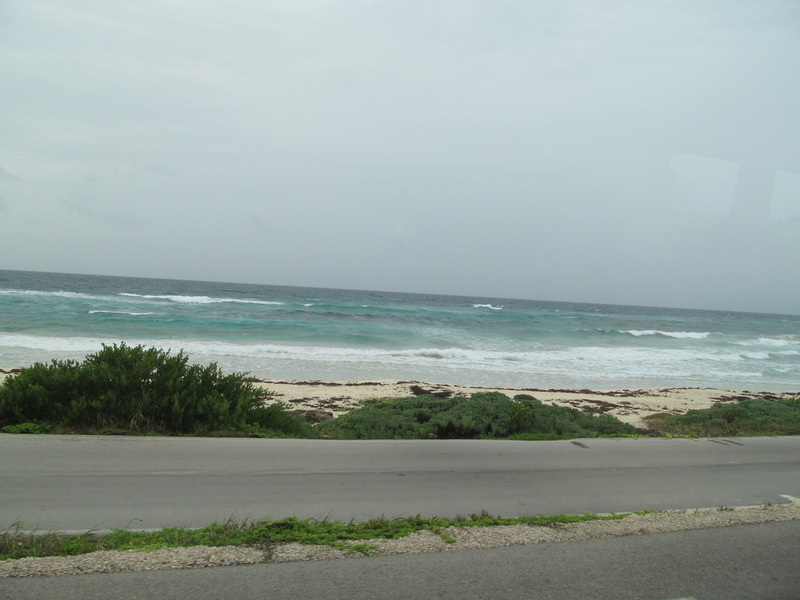 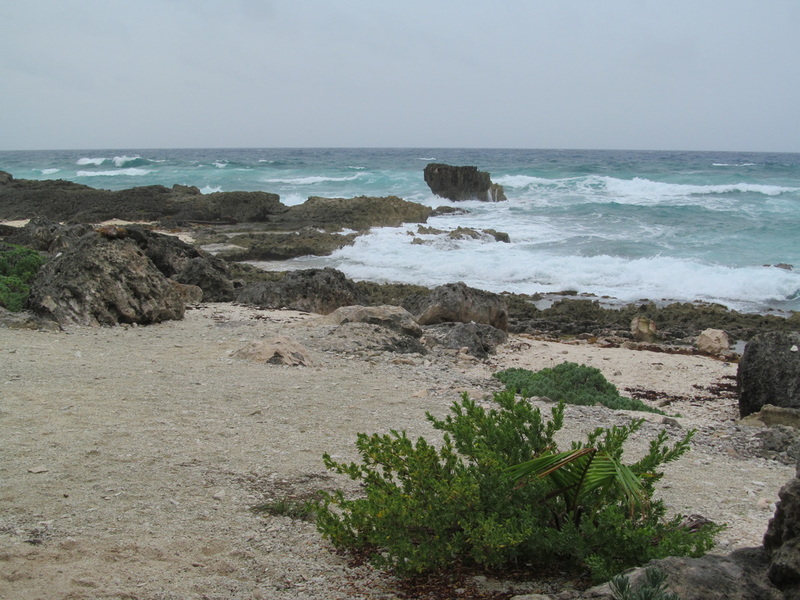 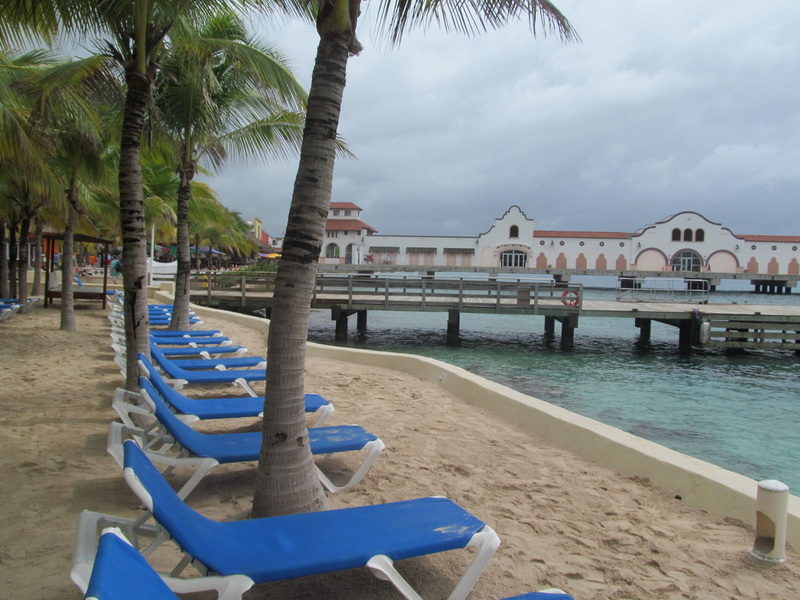 It was nice looking at Cozumel's beaches from the tour bus as we made our way to our beach stop. 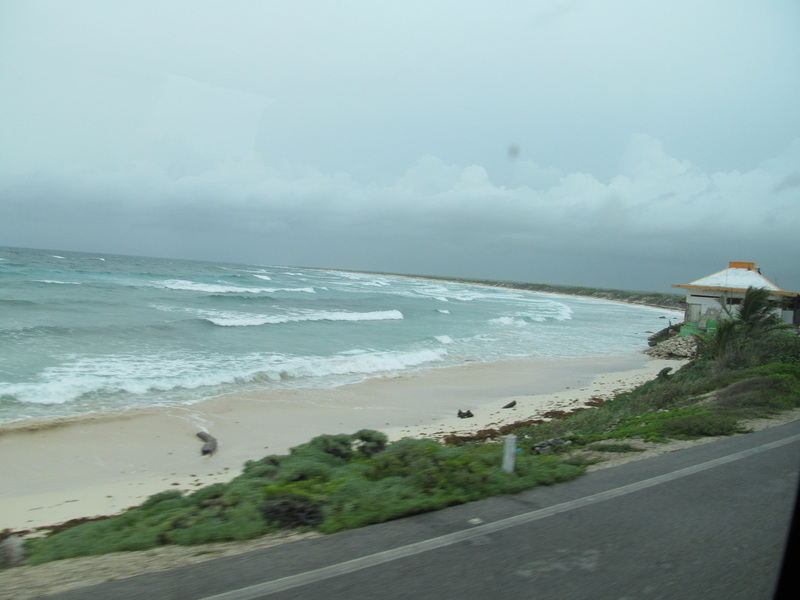 It rained off and on throughout our drive to the beach. 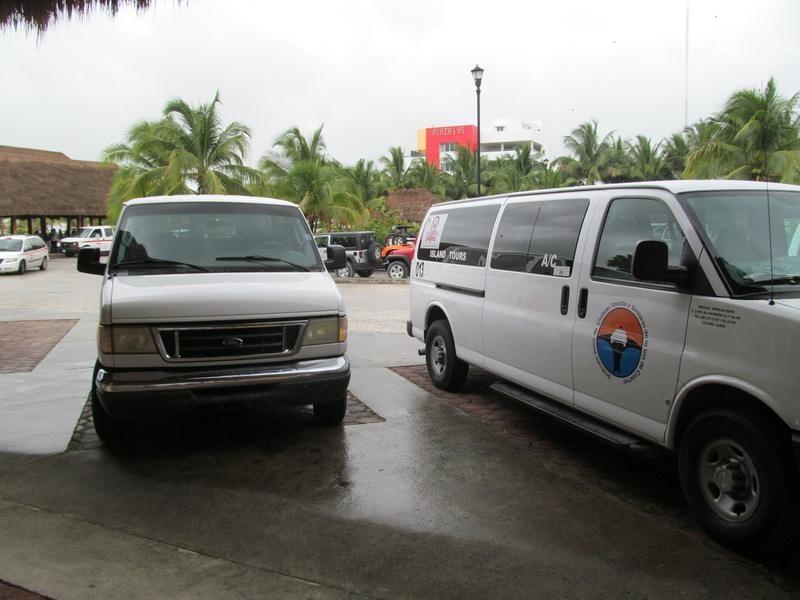 During this drive, our tour guide answered questions about the Mayan people and explained Cozumel's commitment to protecting sea turtles. 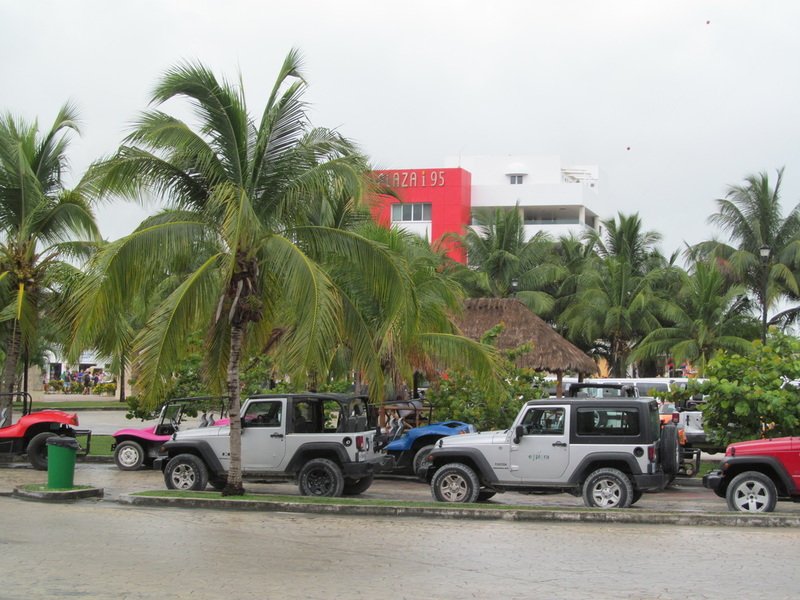 After our beach stop, it was time to head back to Puerta Maya. 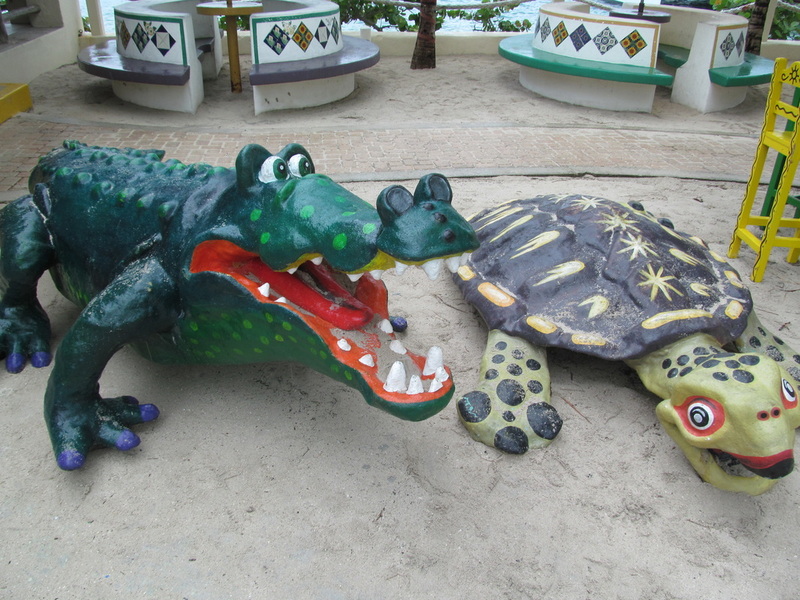 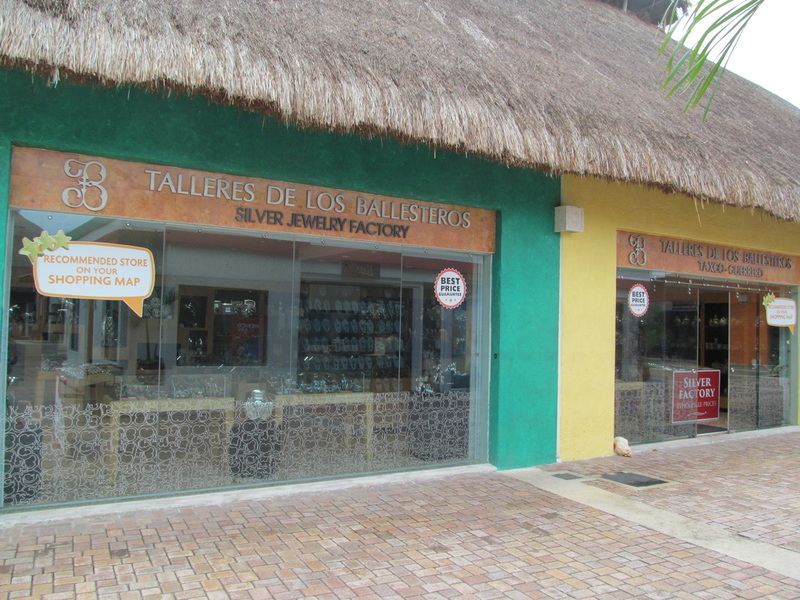 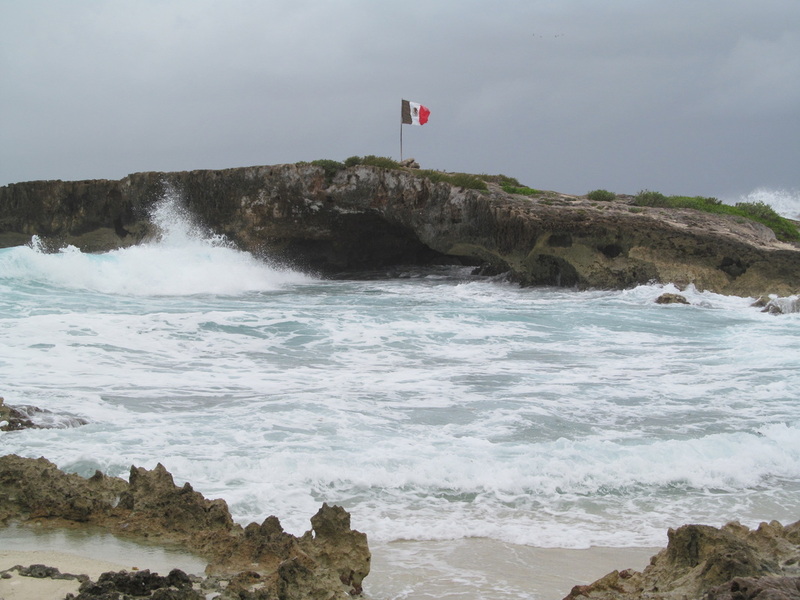 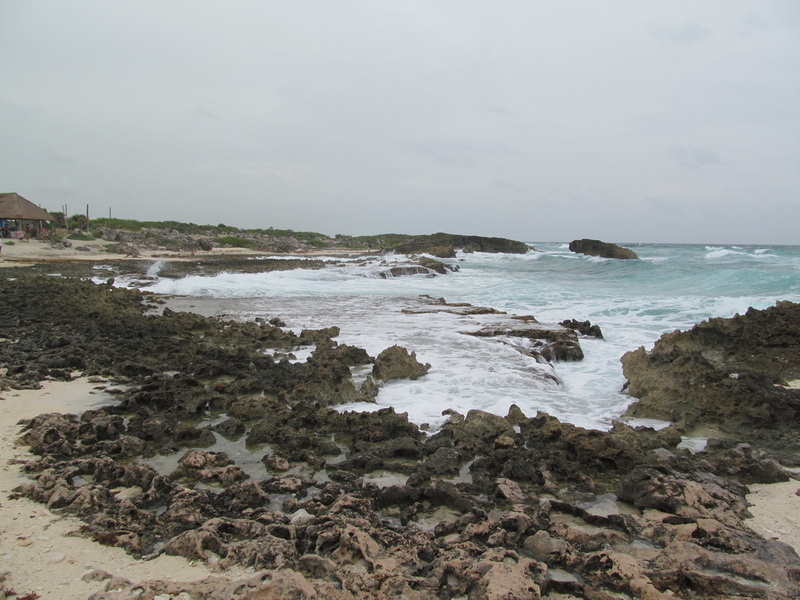 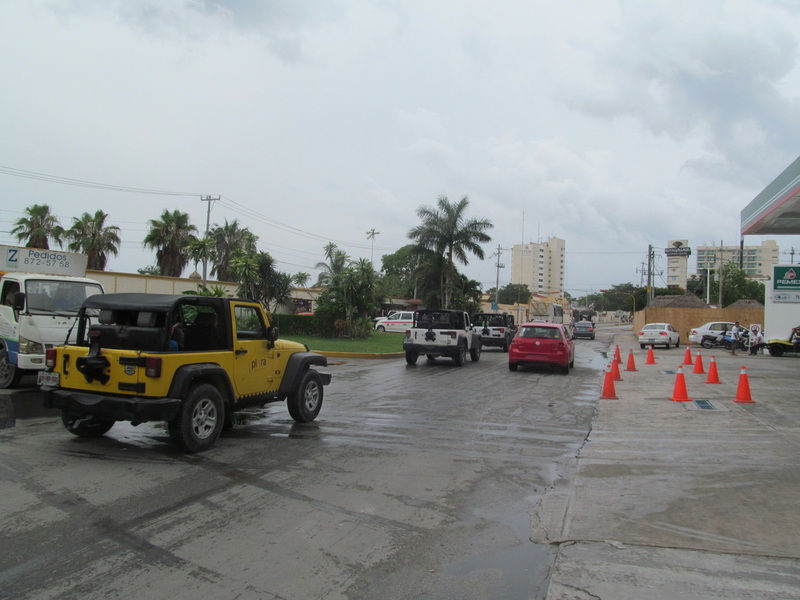 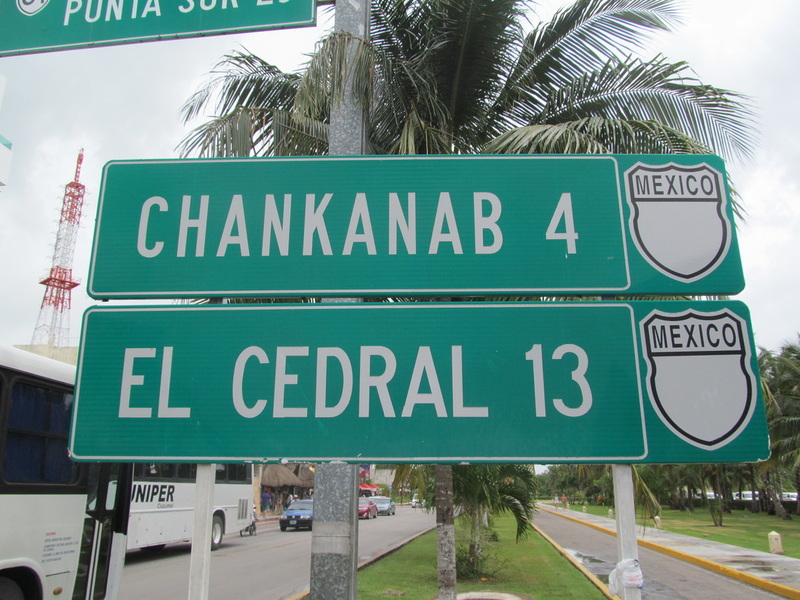 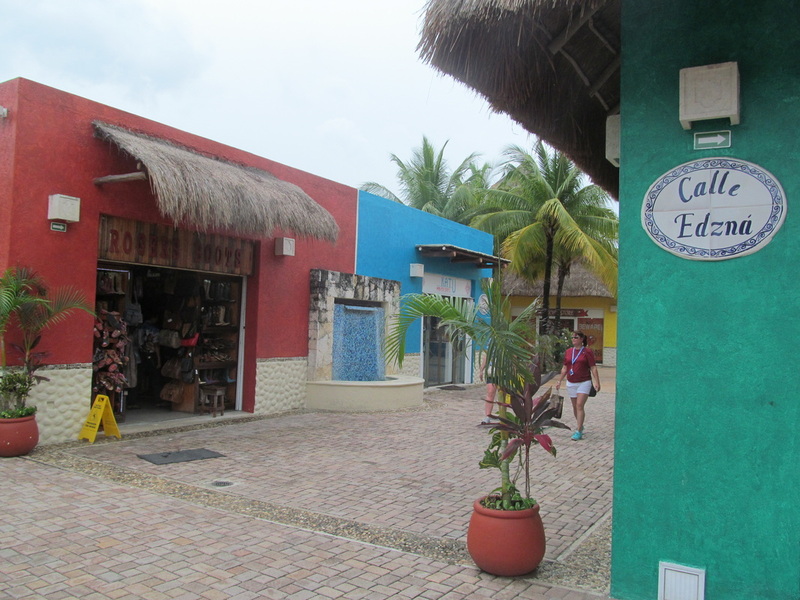 During this drive, our tour guide answered questions and gave more information about Cozumel. 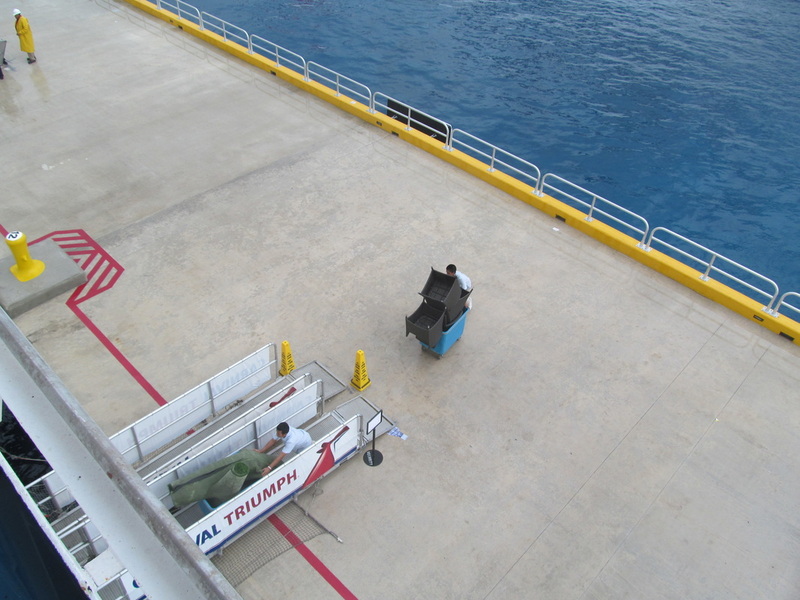 He passed around a sheet that we had to sign. 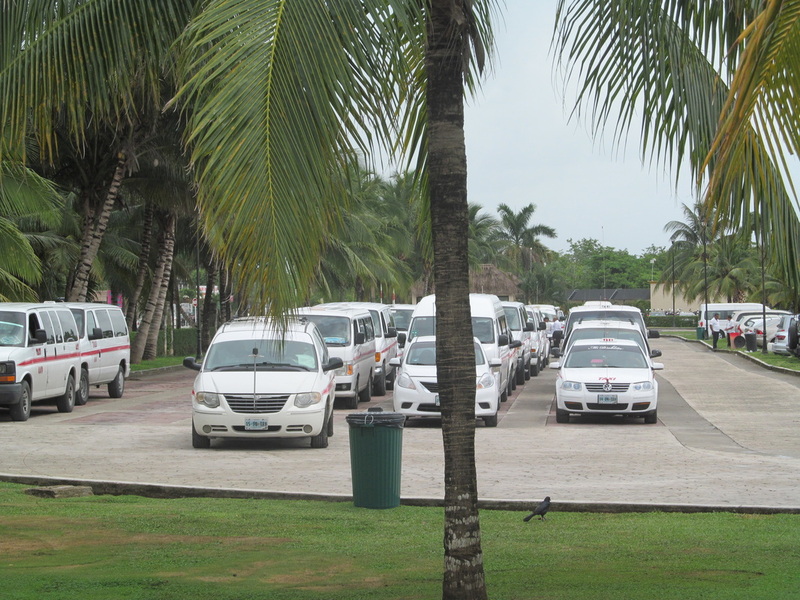 I do not know who this information was for, but it almost like attendance was being taken. 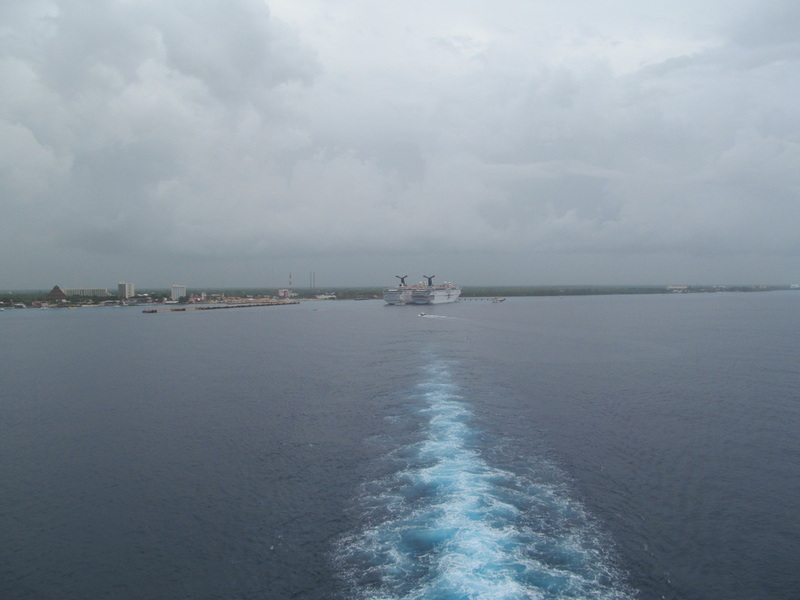 The trip back to the ship from the beach did not take too much time. 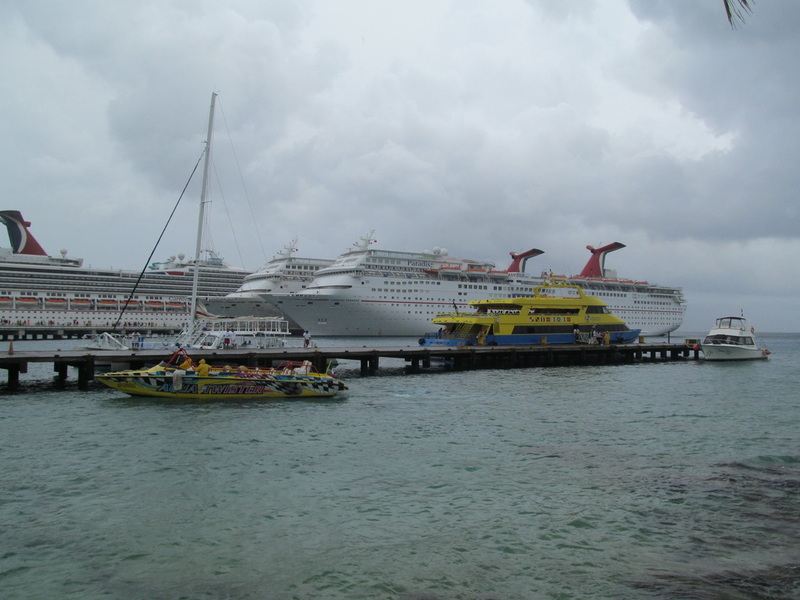 Overall, this shore excursion was interesting and fun. 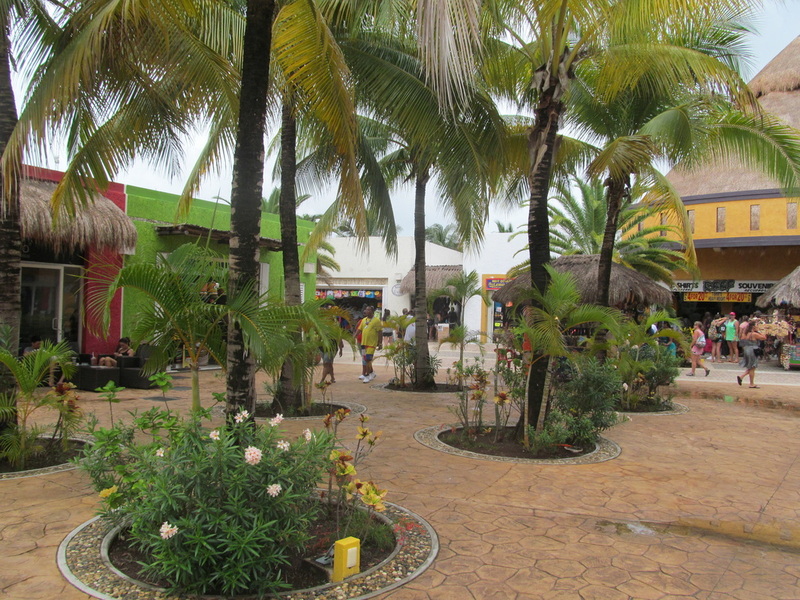 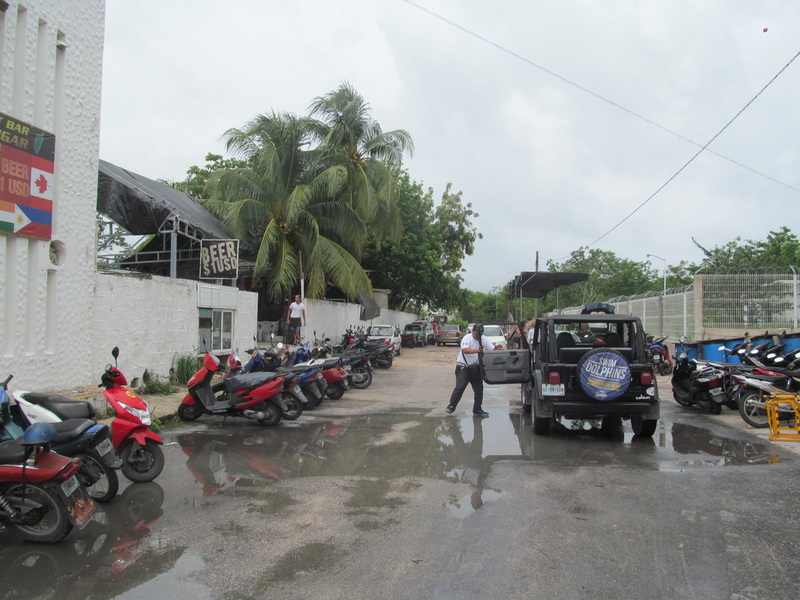 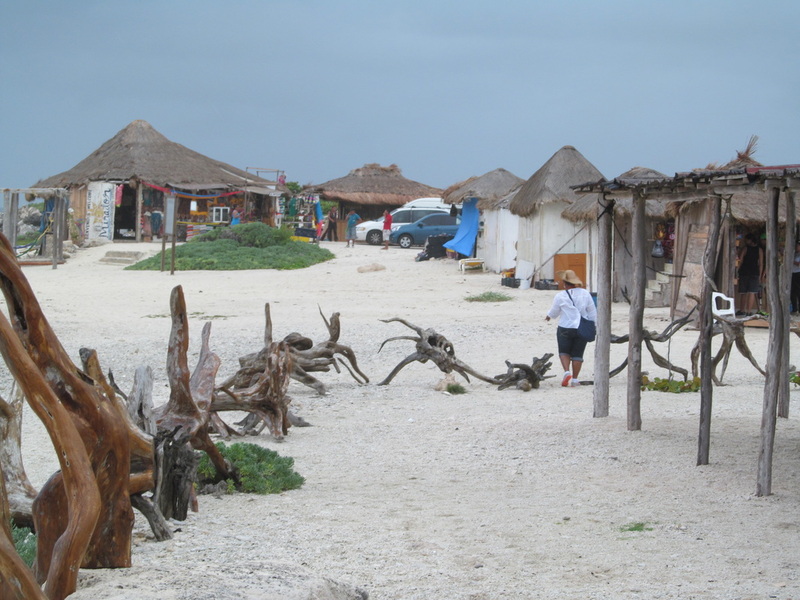 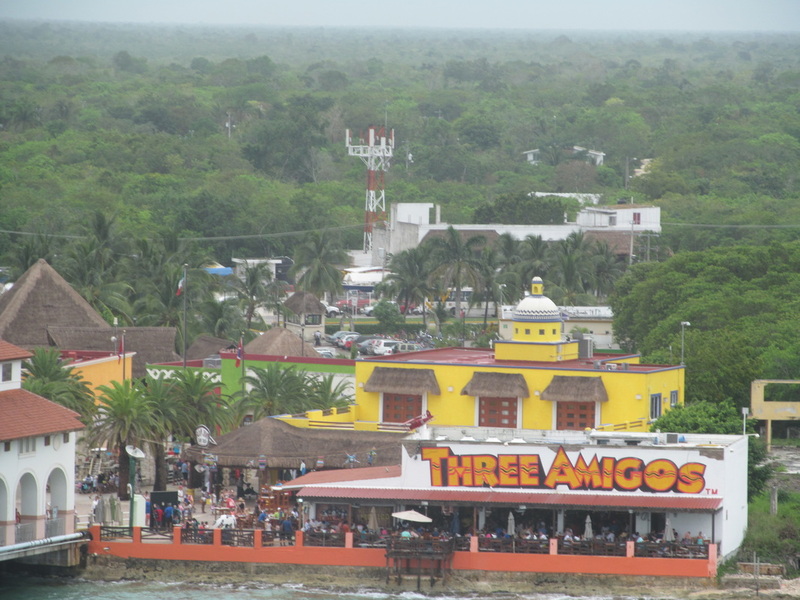 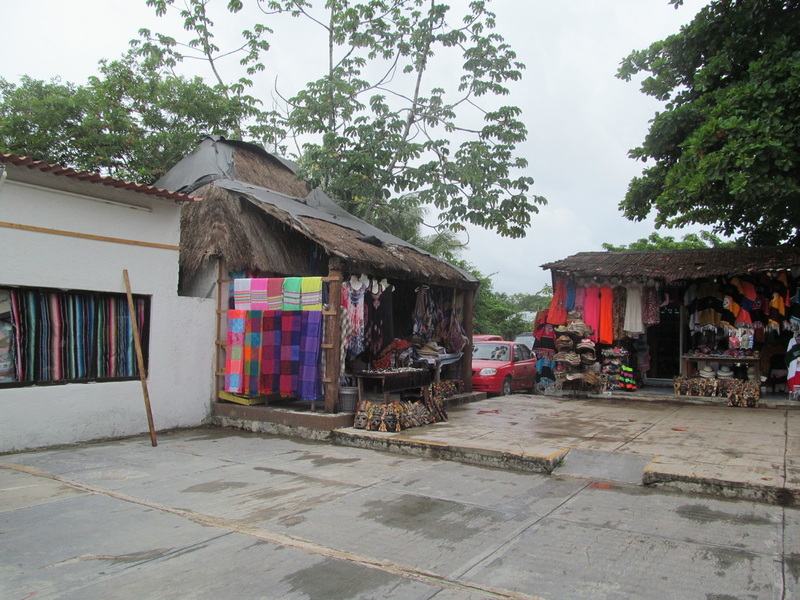 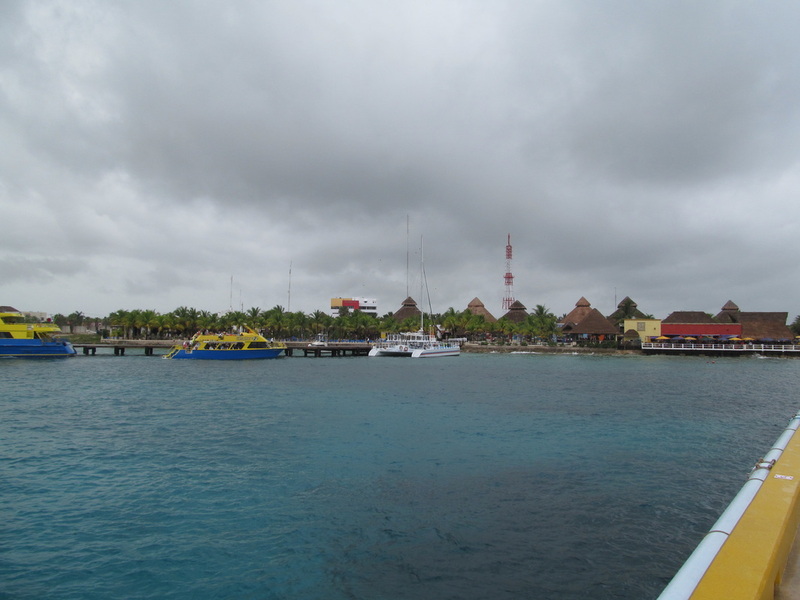 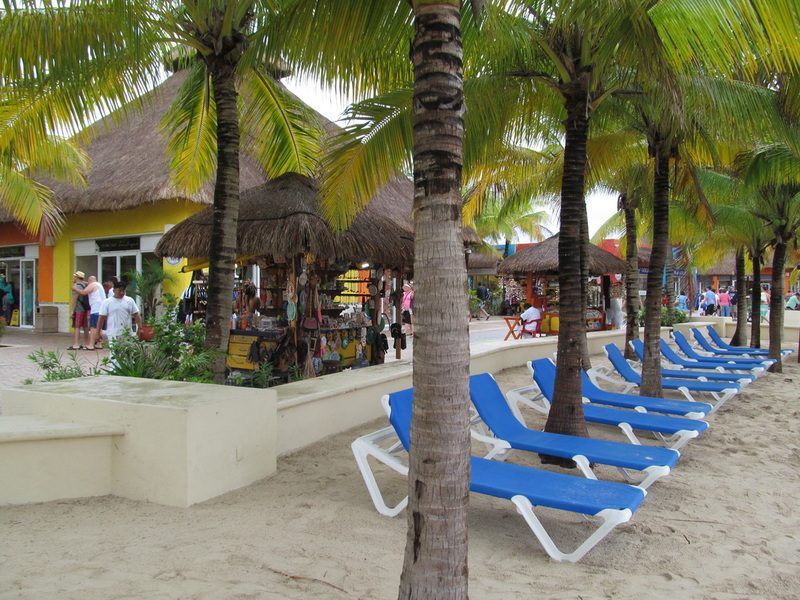 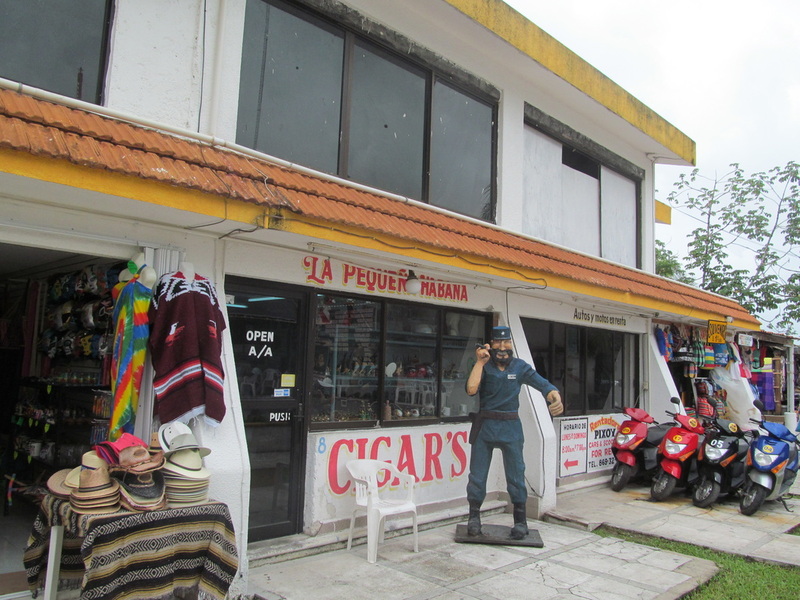 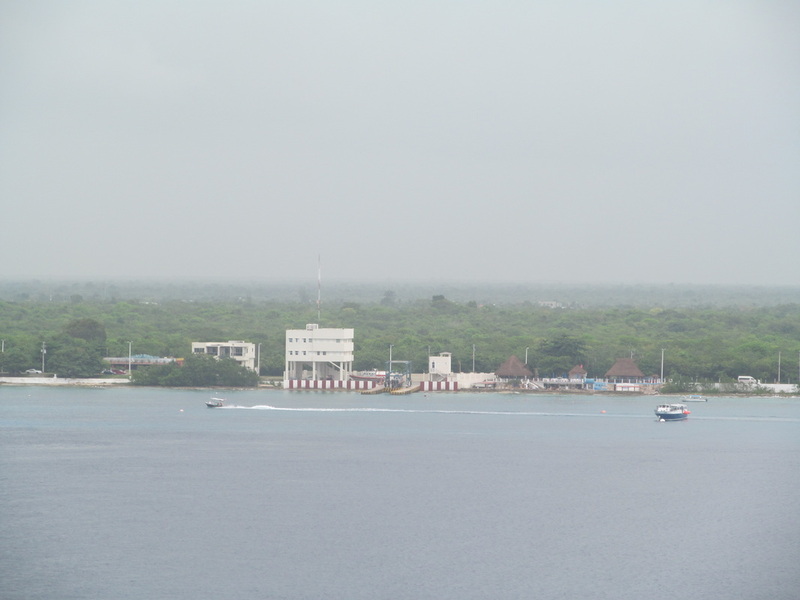 When we arrived back at Puerta Maya, it felt like everything was significantly more crowded. 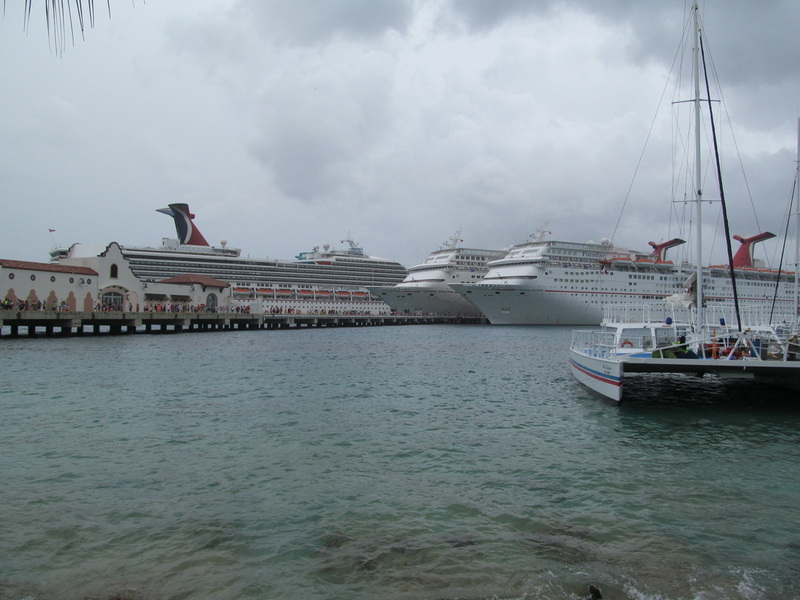 This was because the Carnival Sensation arrived while we were on our shore excursion. 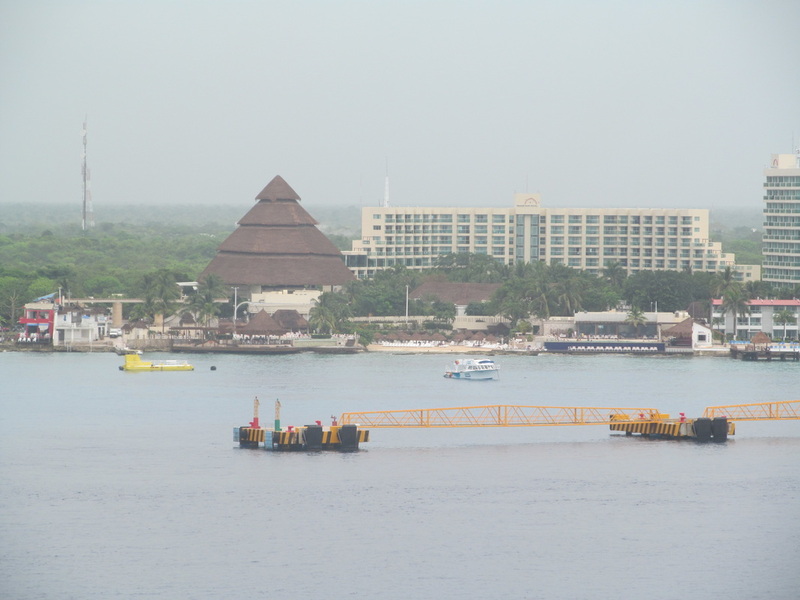 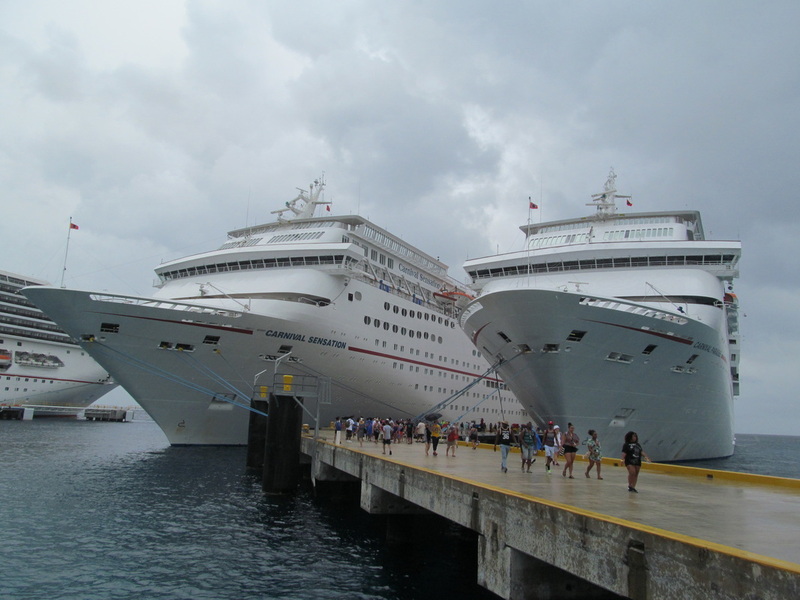 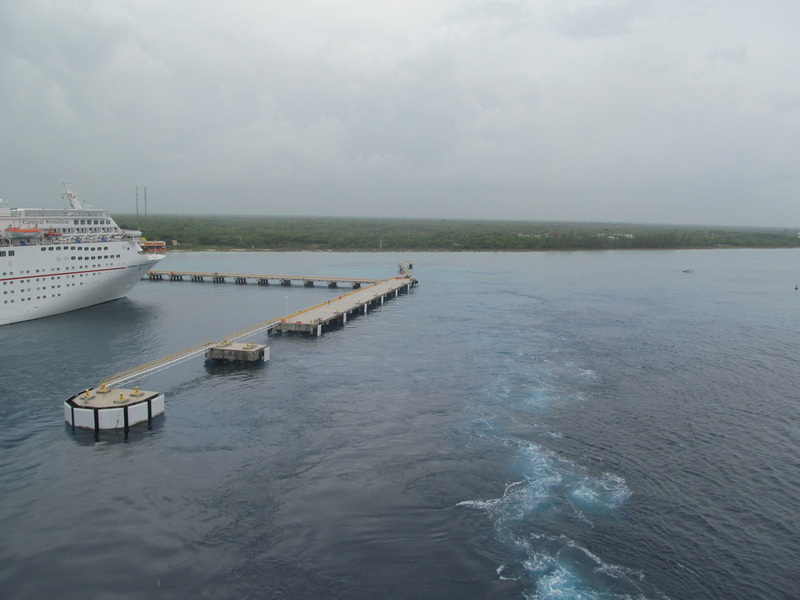 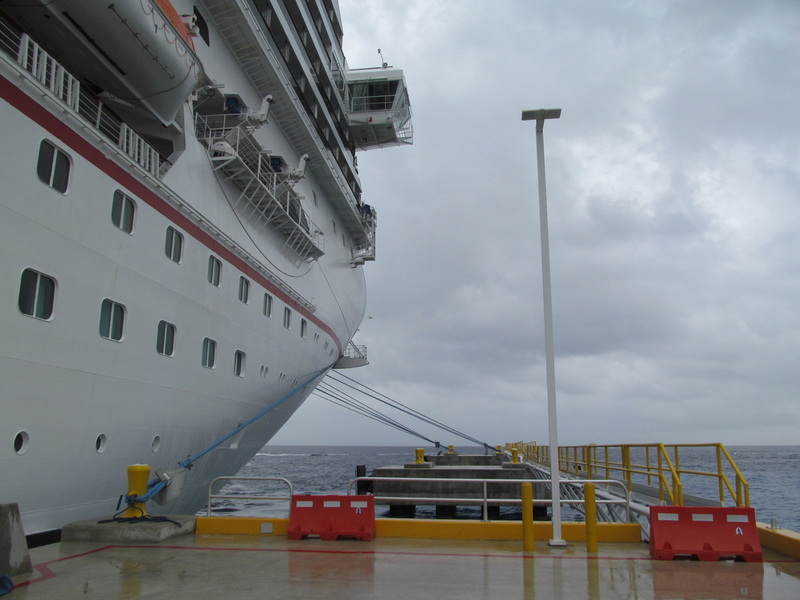 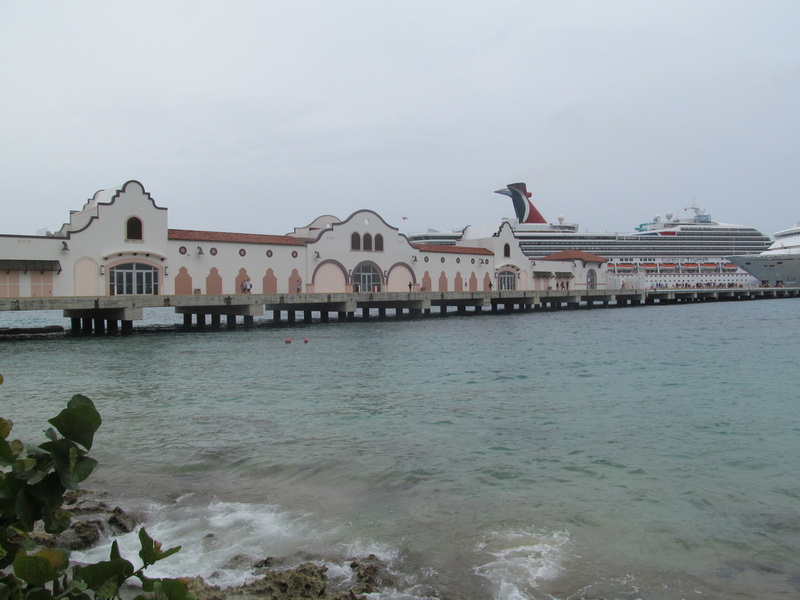 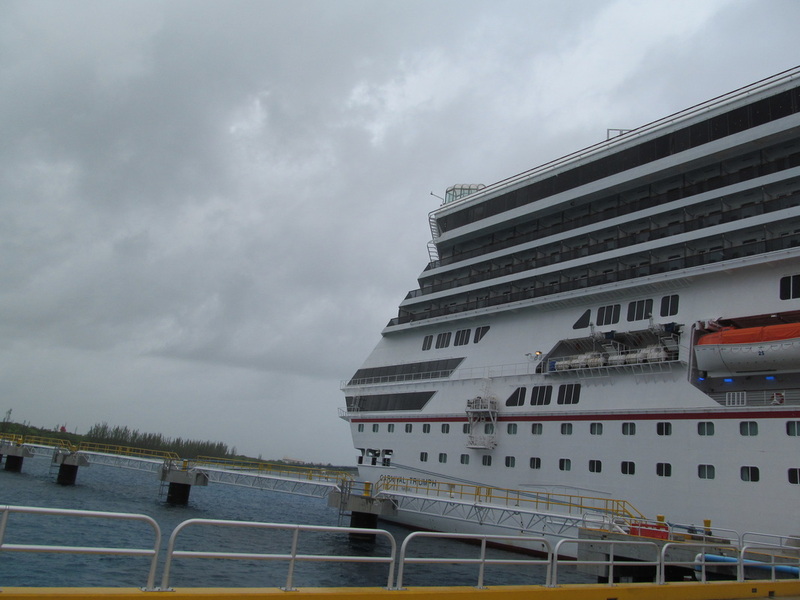 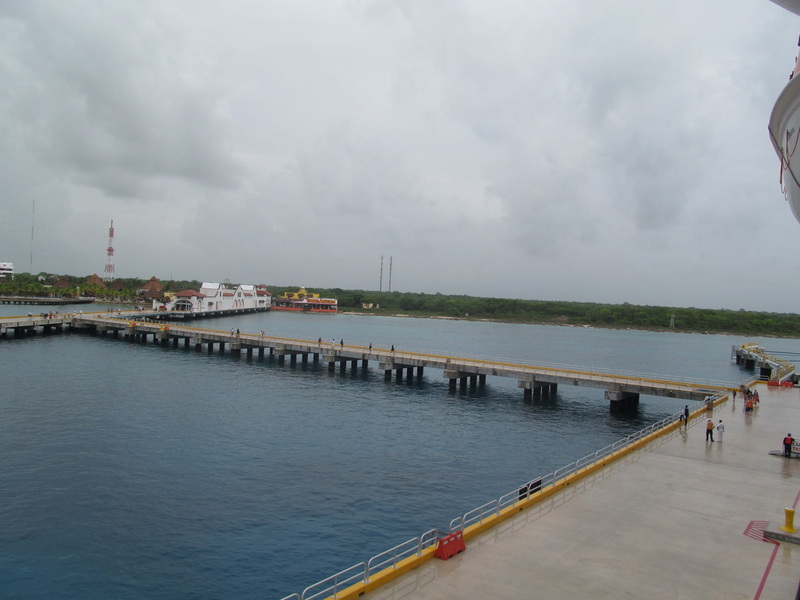 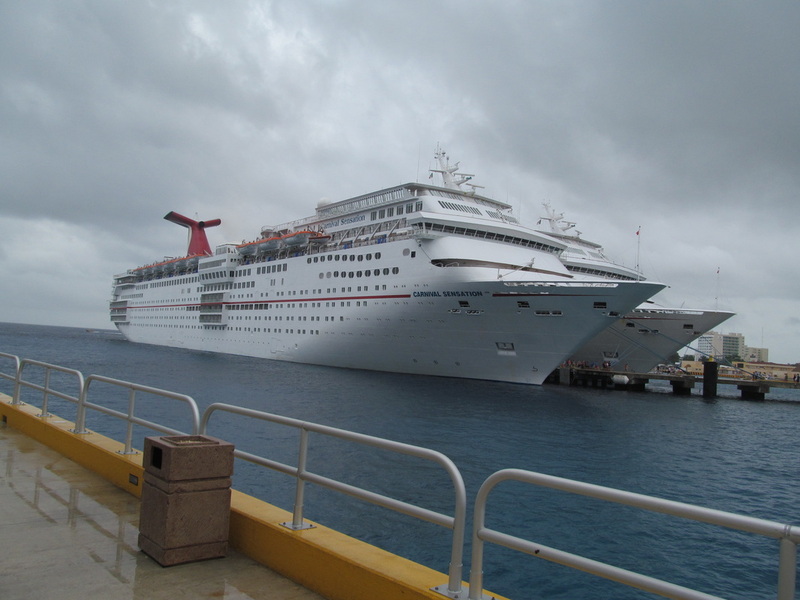 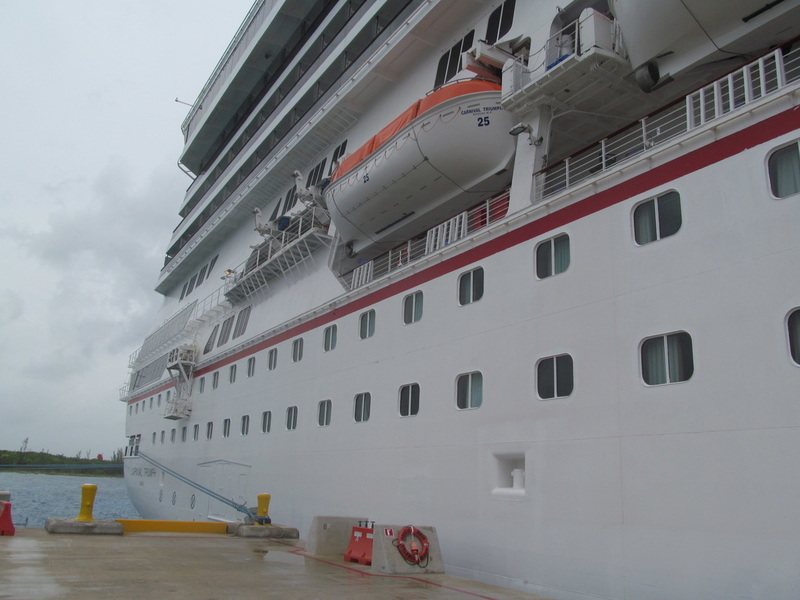 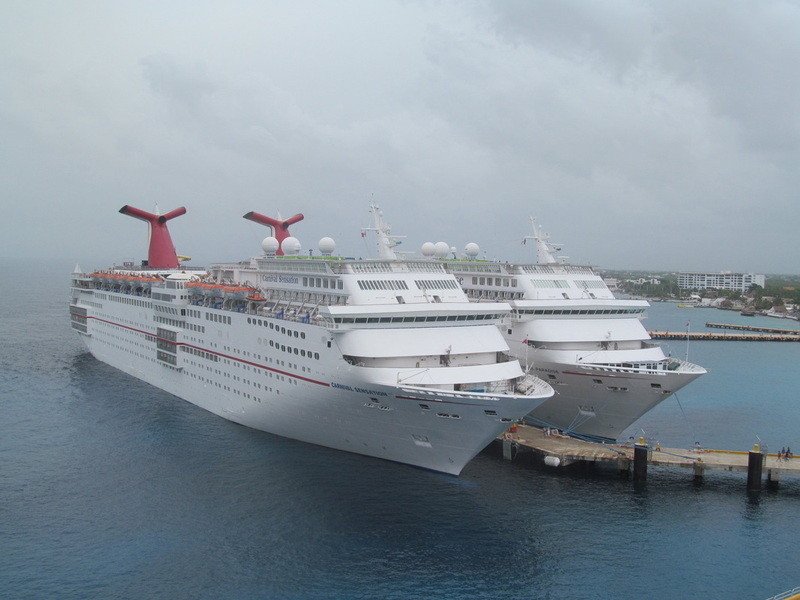 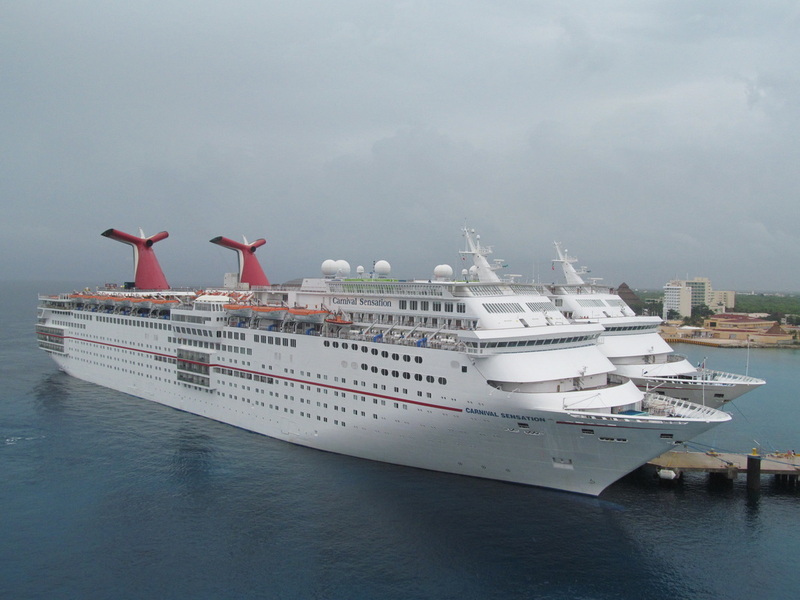 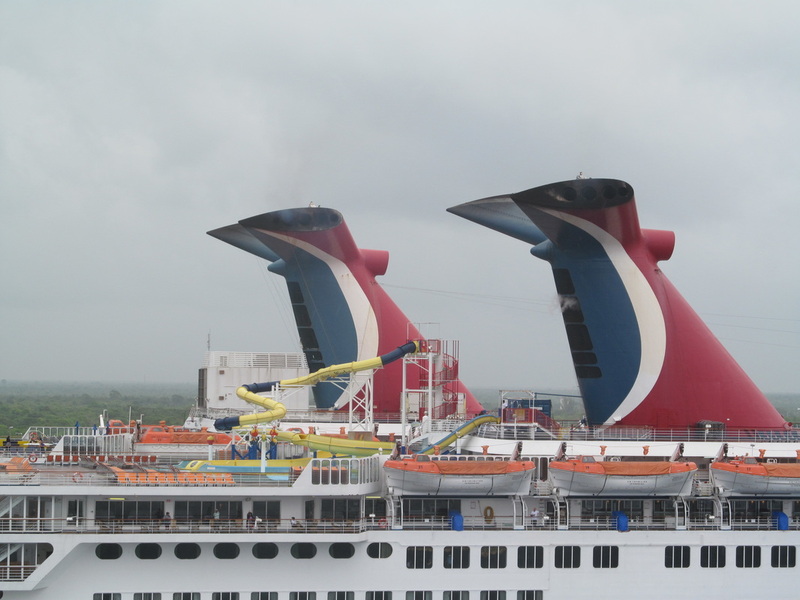 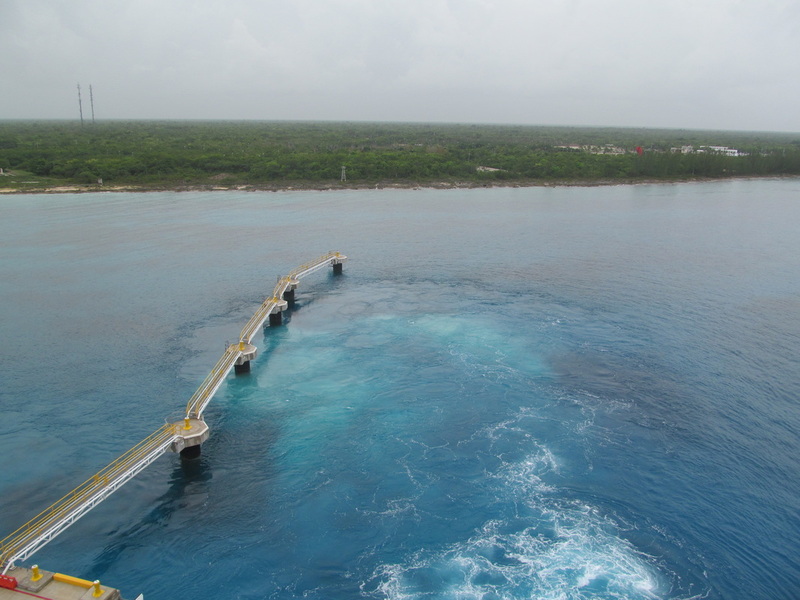 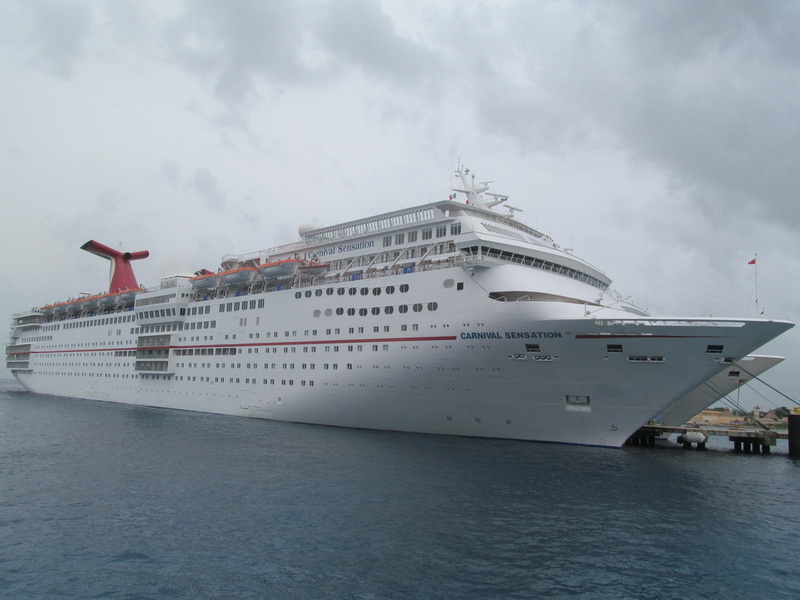 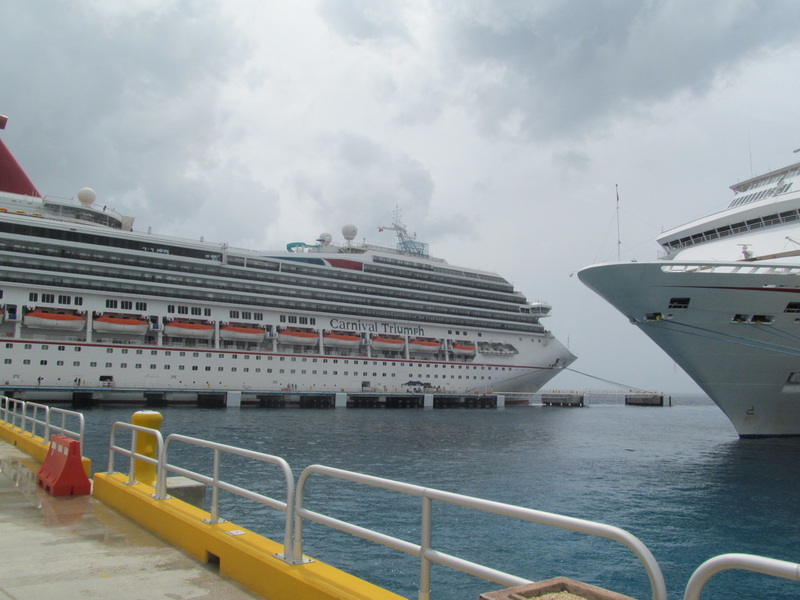 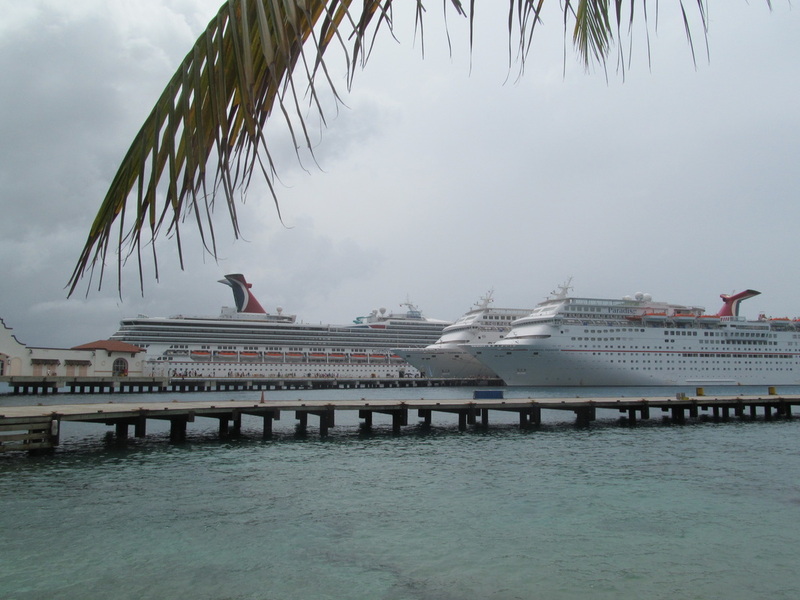 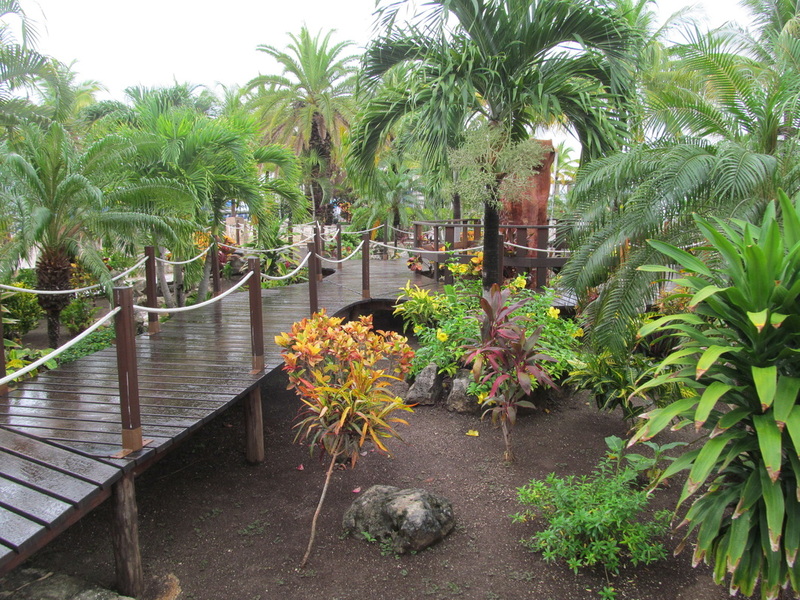 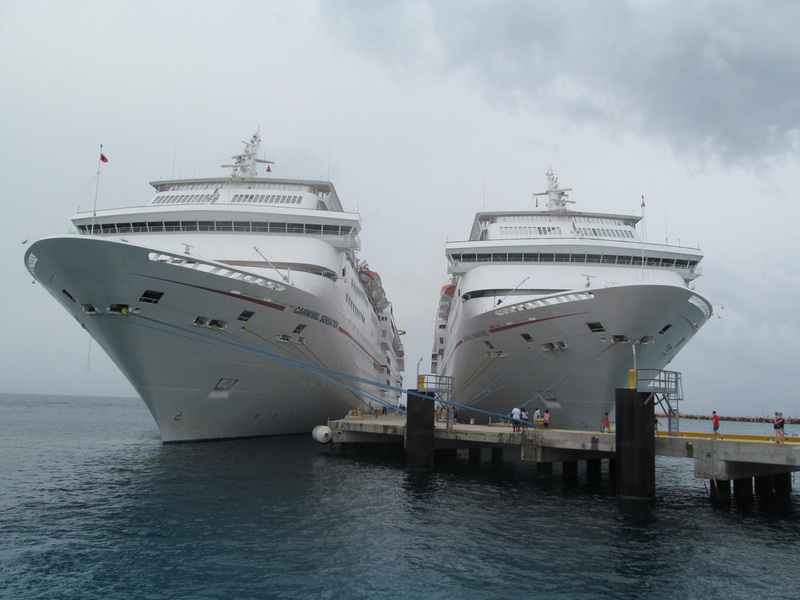 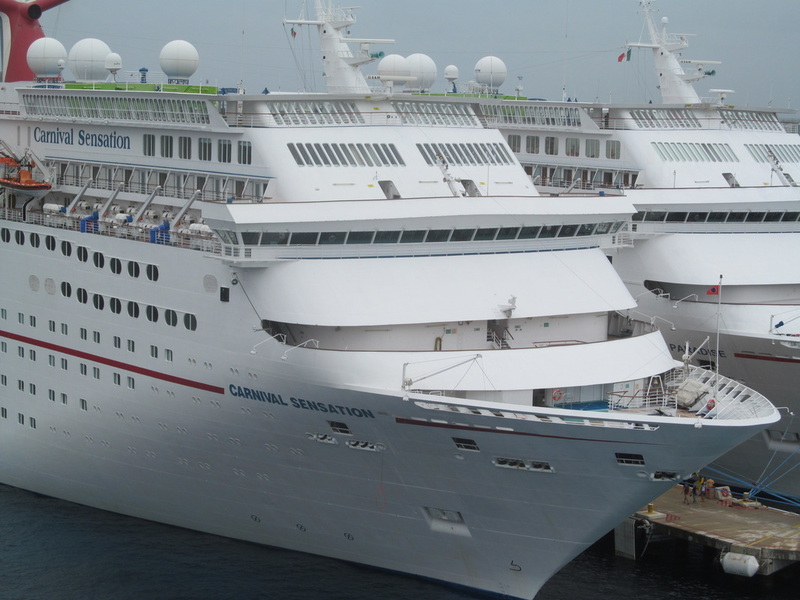 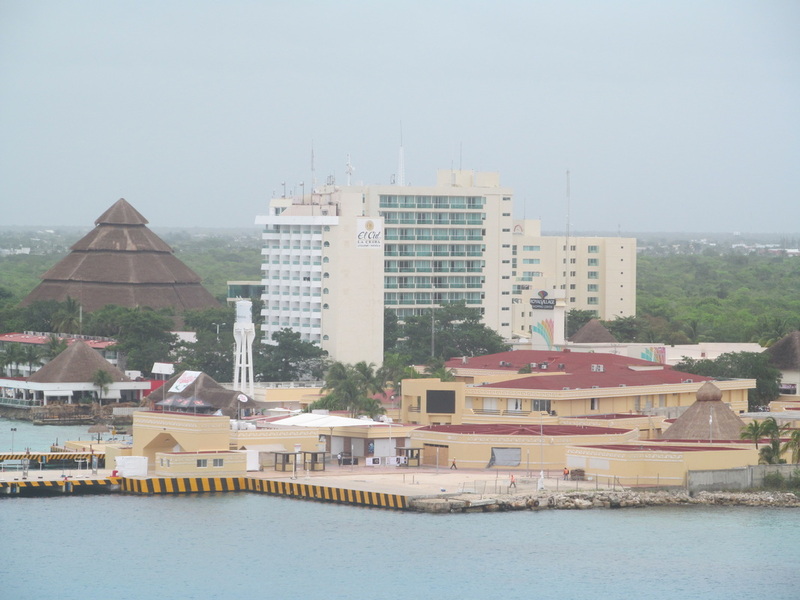 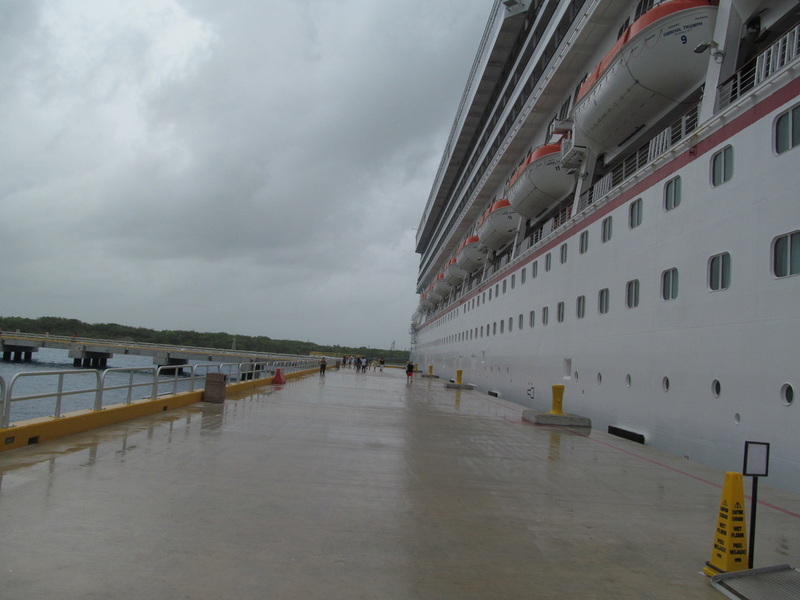 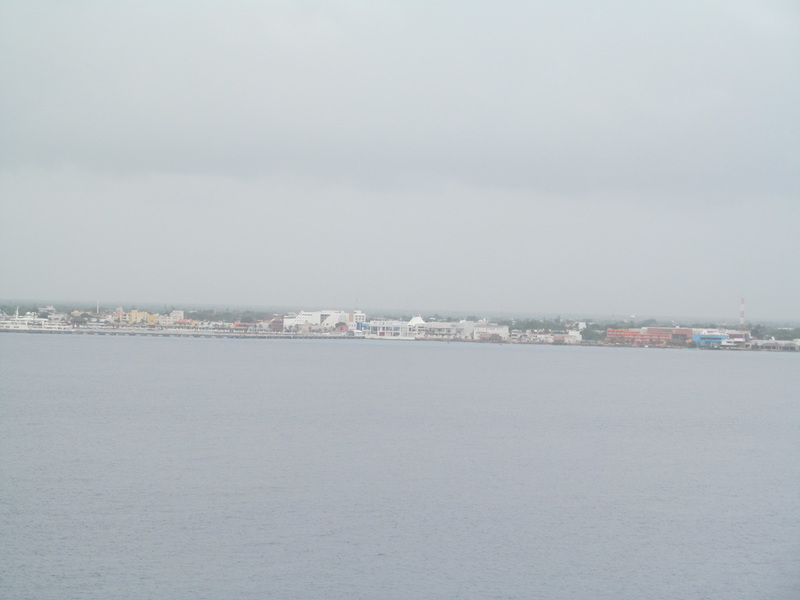 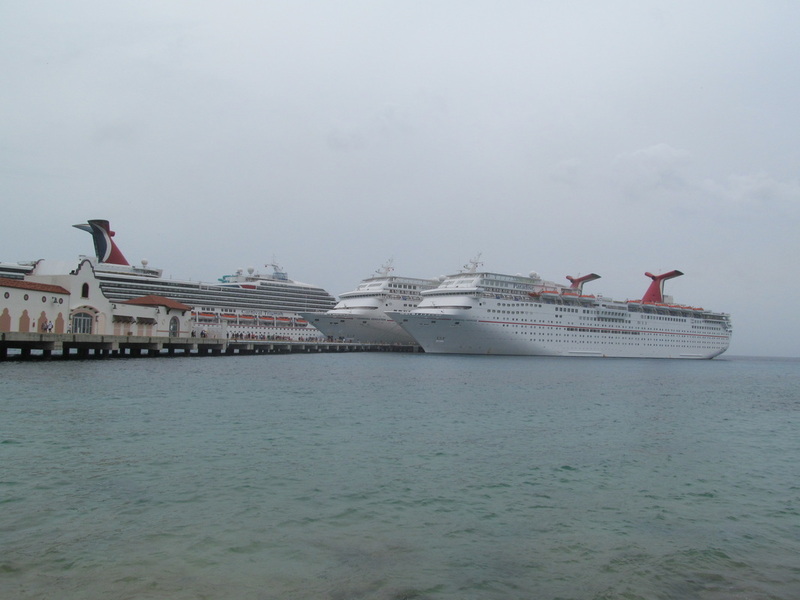 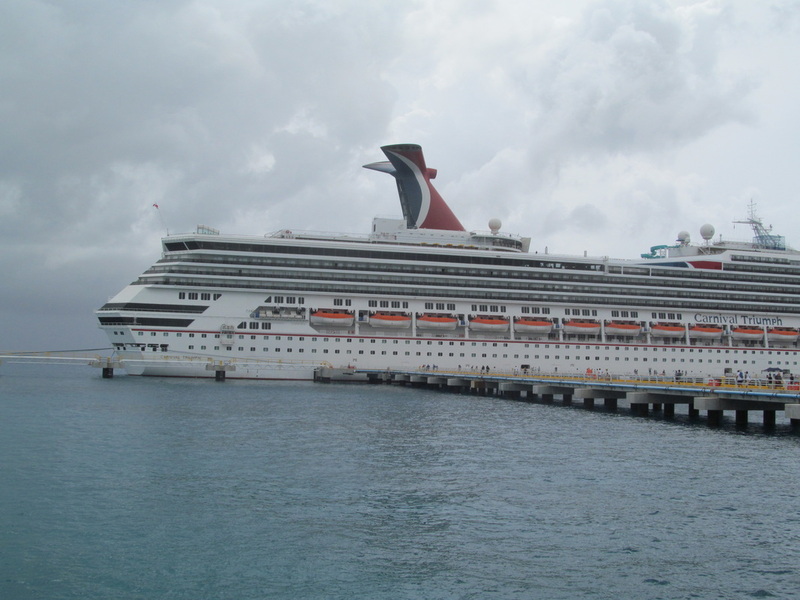 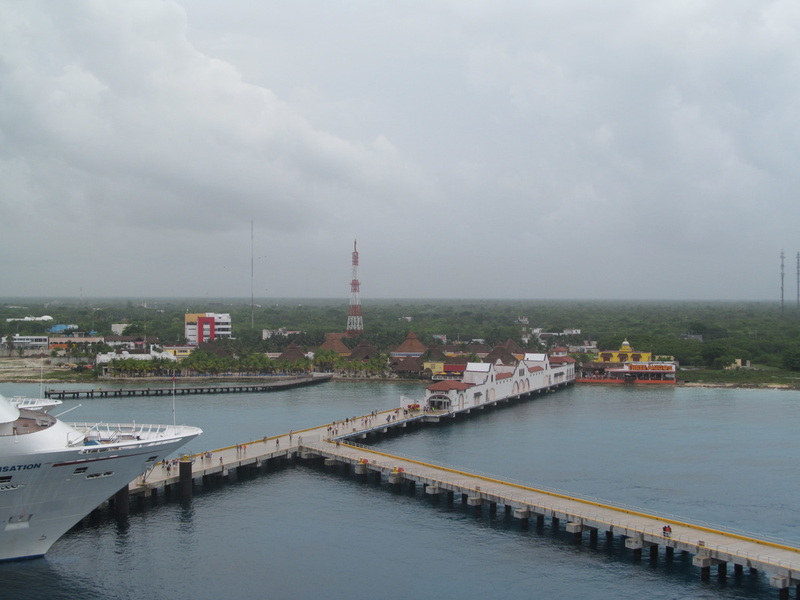 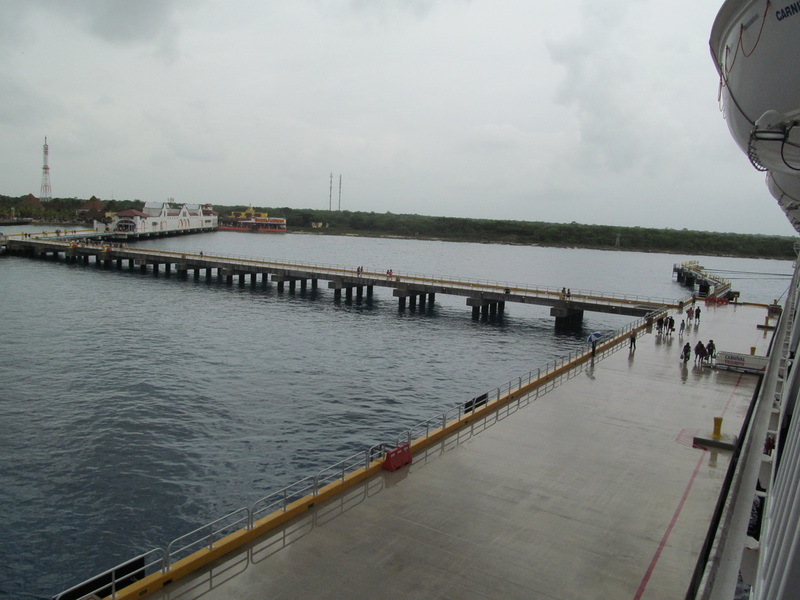 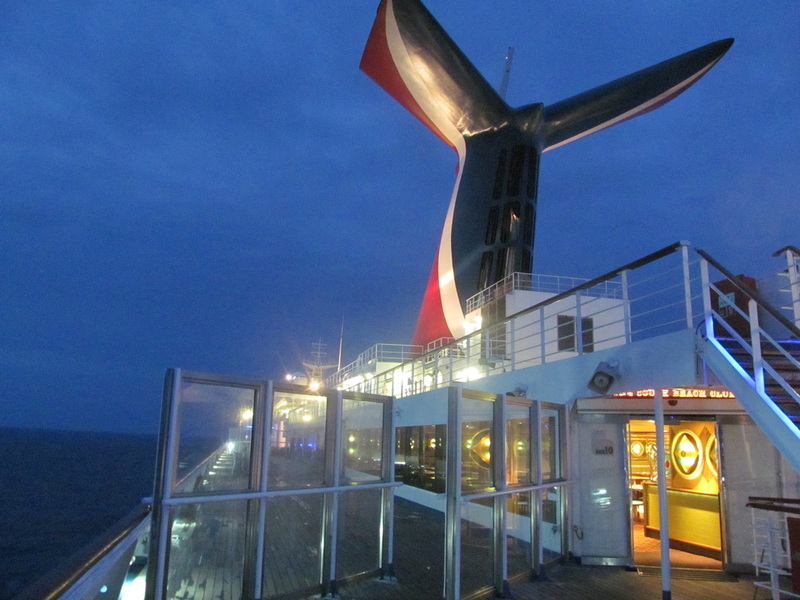 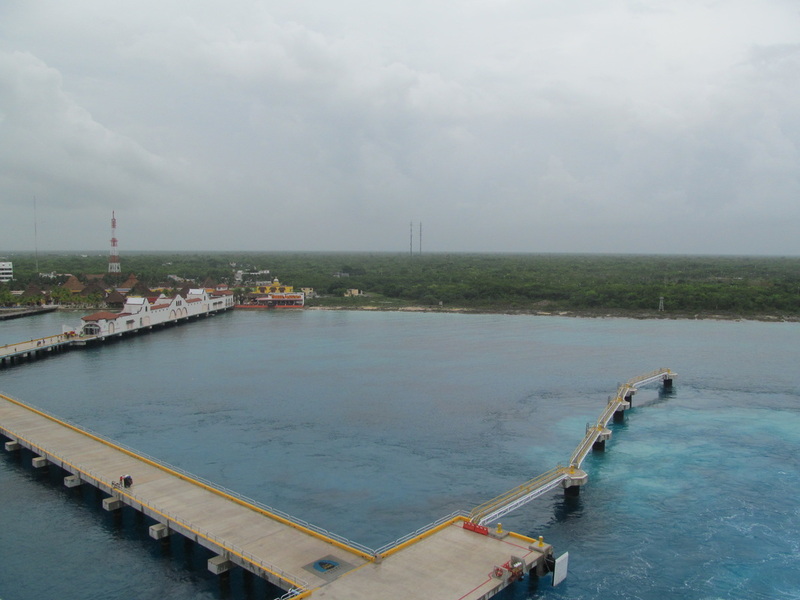 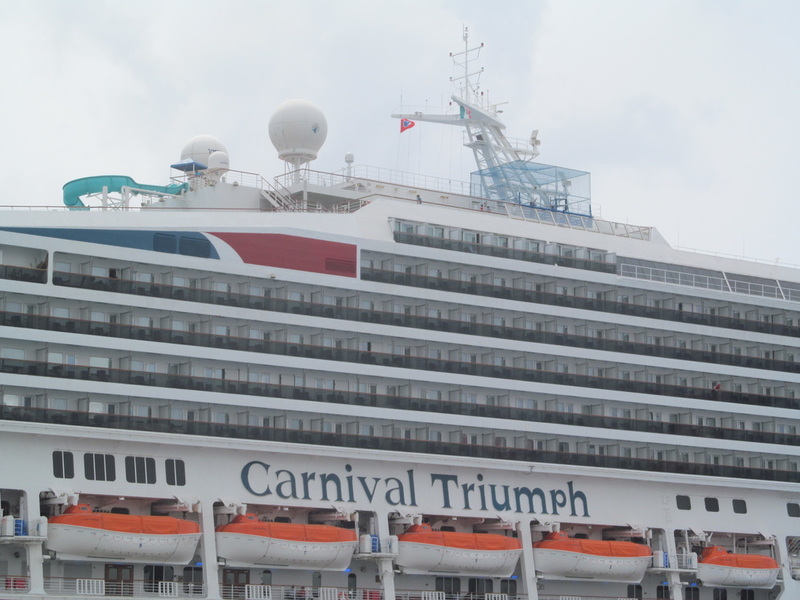 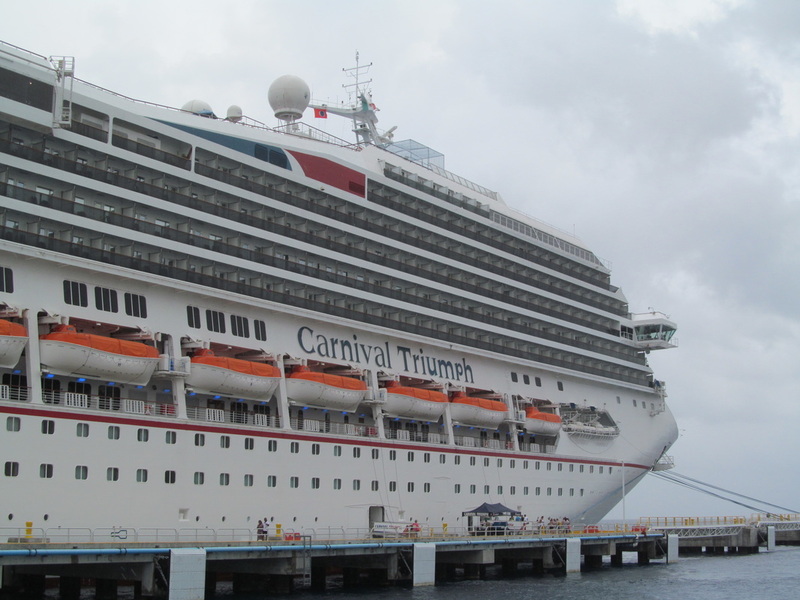 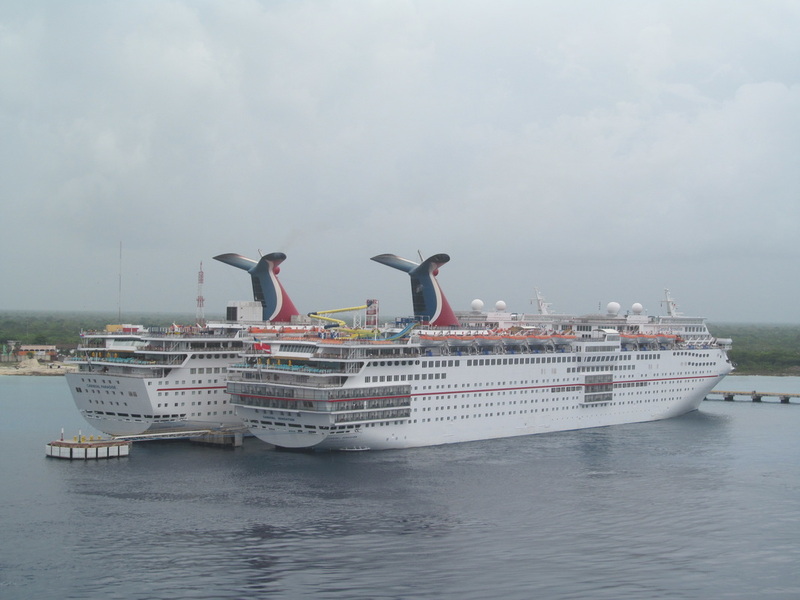 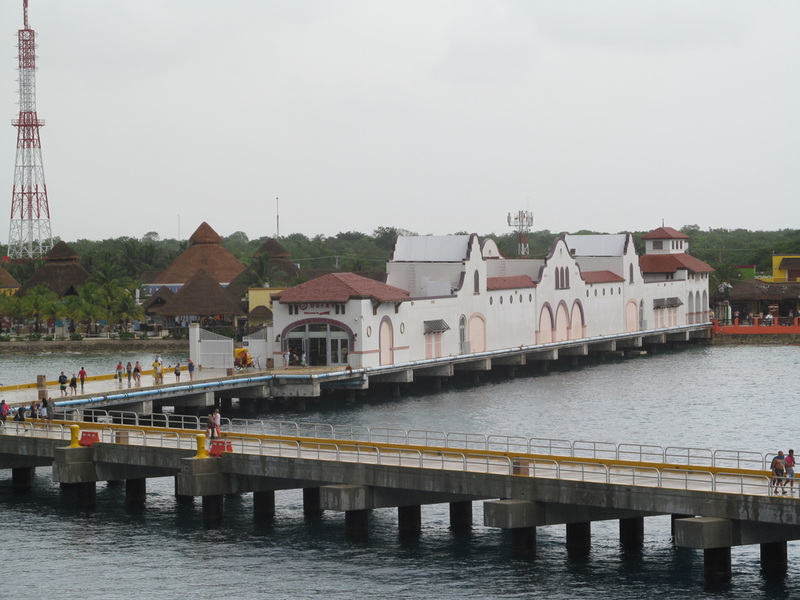 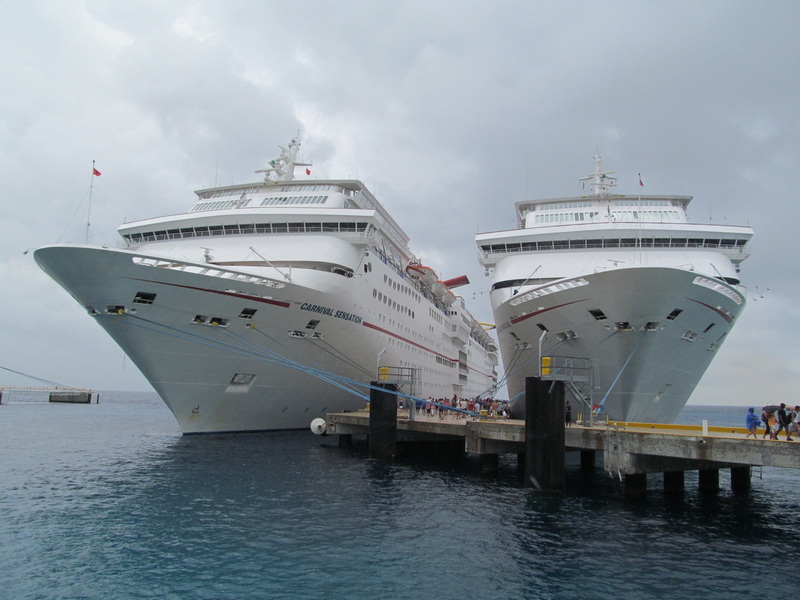 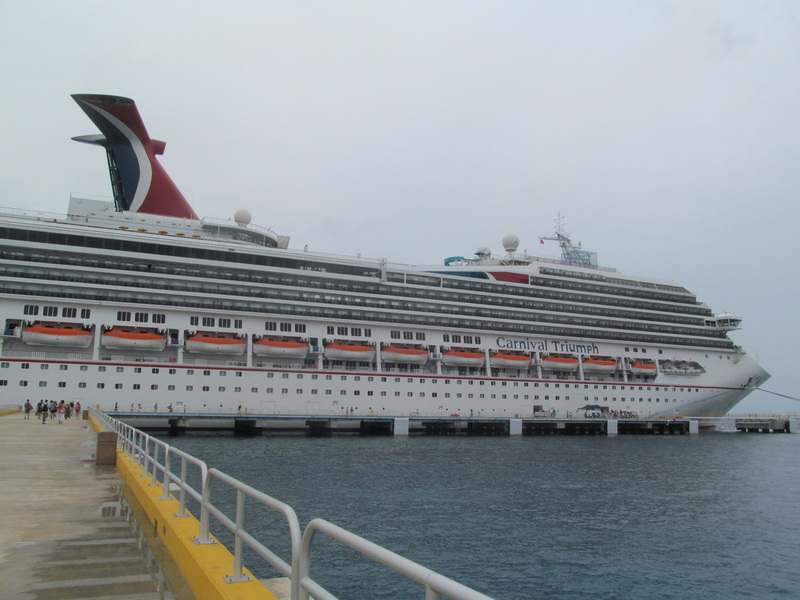 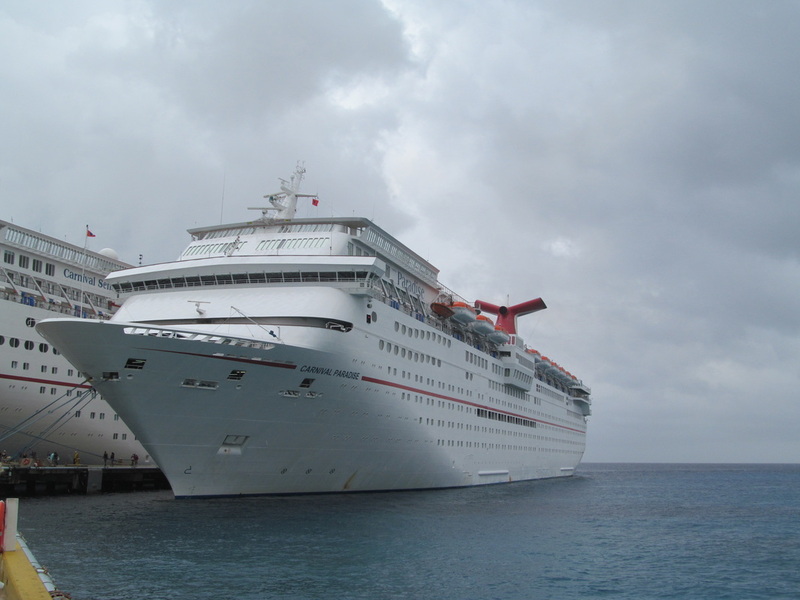 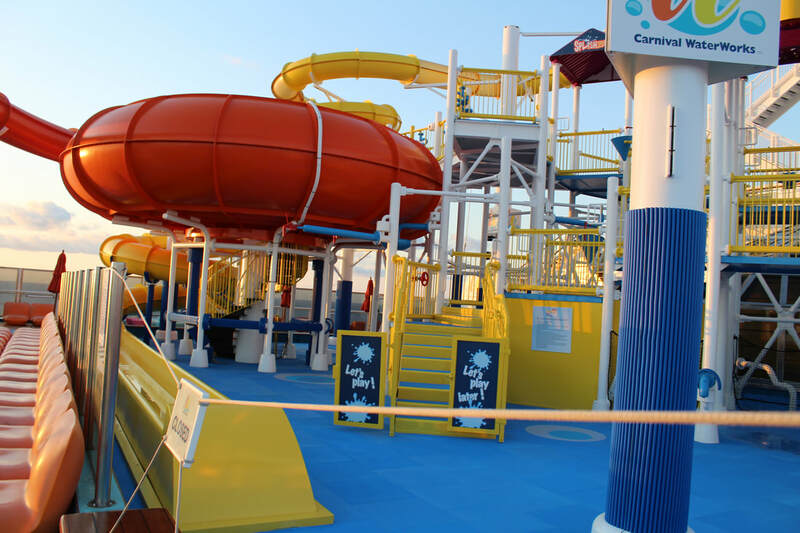 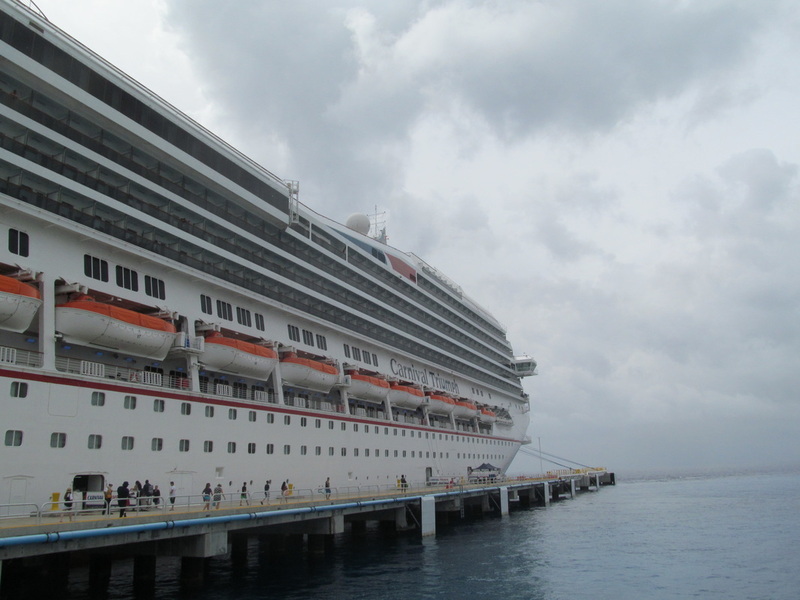 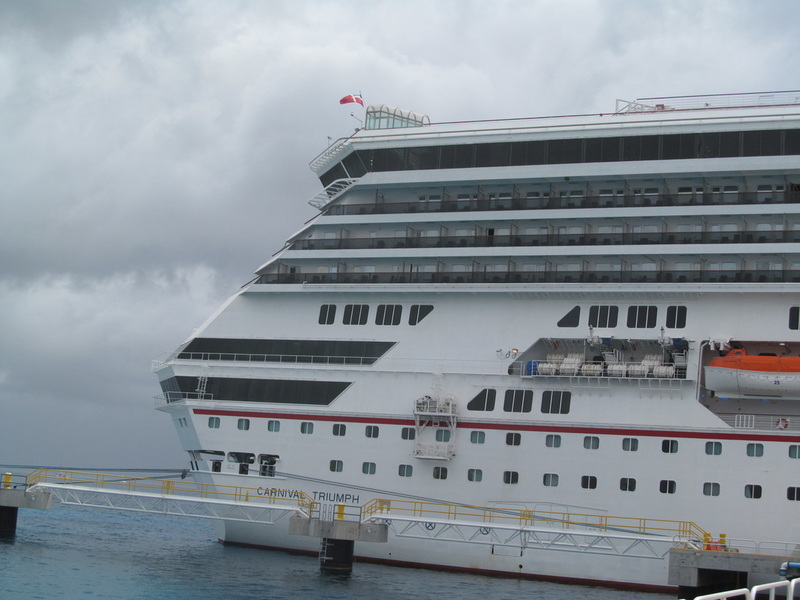 The Carnival Sensation's passengers were currently in the process of disembarking the ship to explore Cozumel. 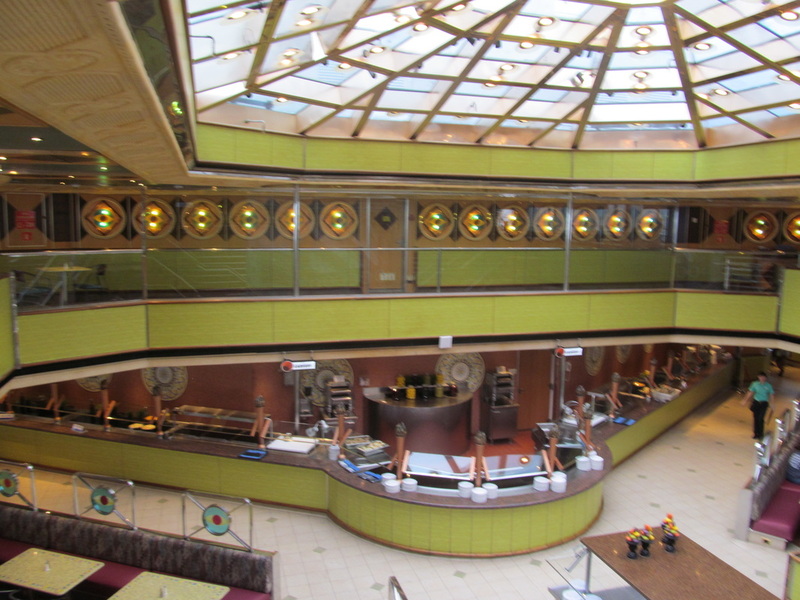 Our first priority was to get back to the ship for lunch. 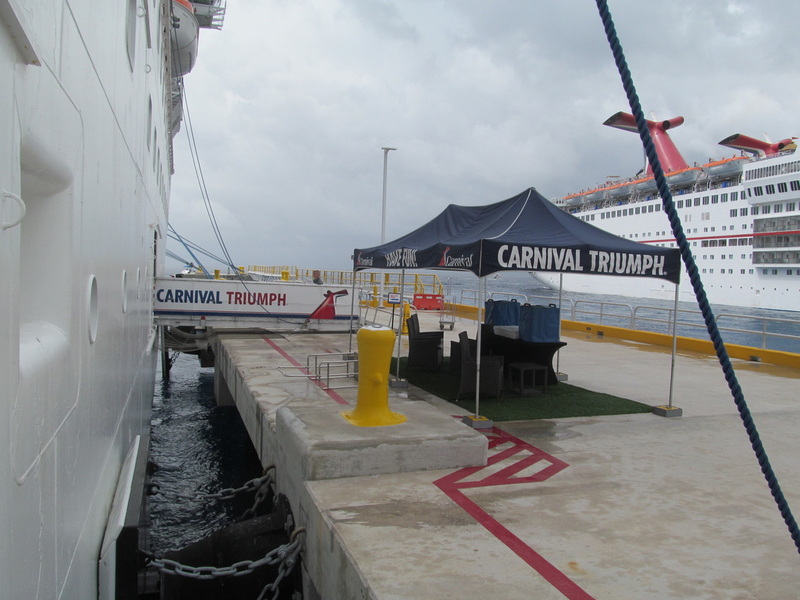 Before we were allowed on the pier, we had to show our Sail & Sign Cards and photo identification. 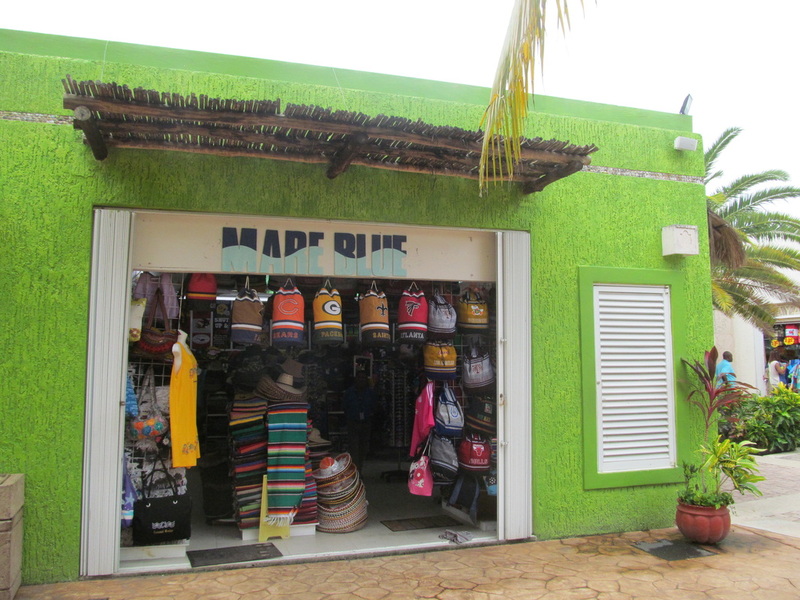 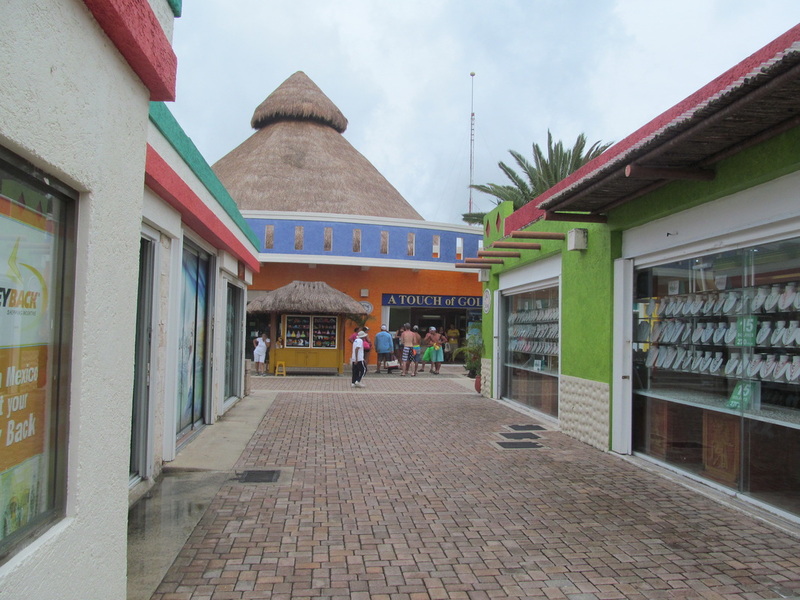 After being allowed to proceed, we had to walk back through the on-pier shops. 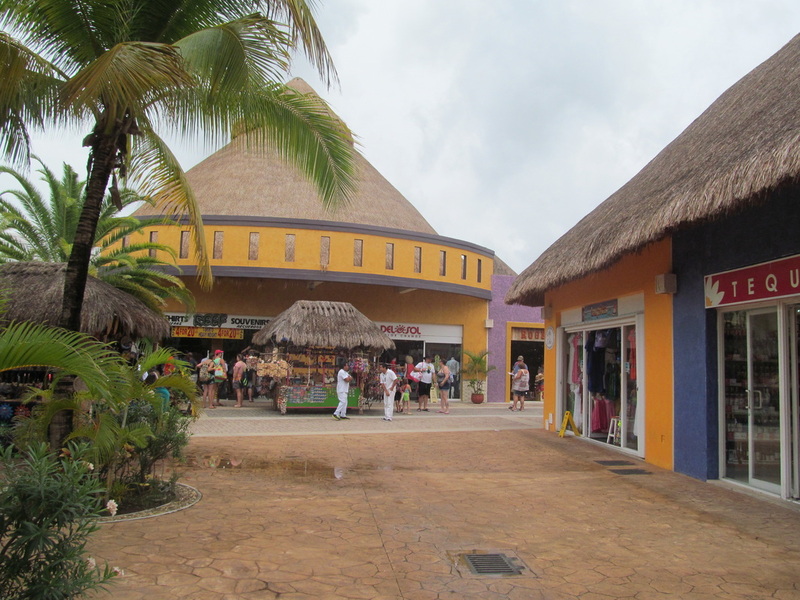 These shops were horribly crowded and filled with people. 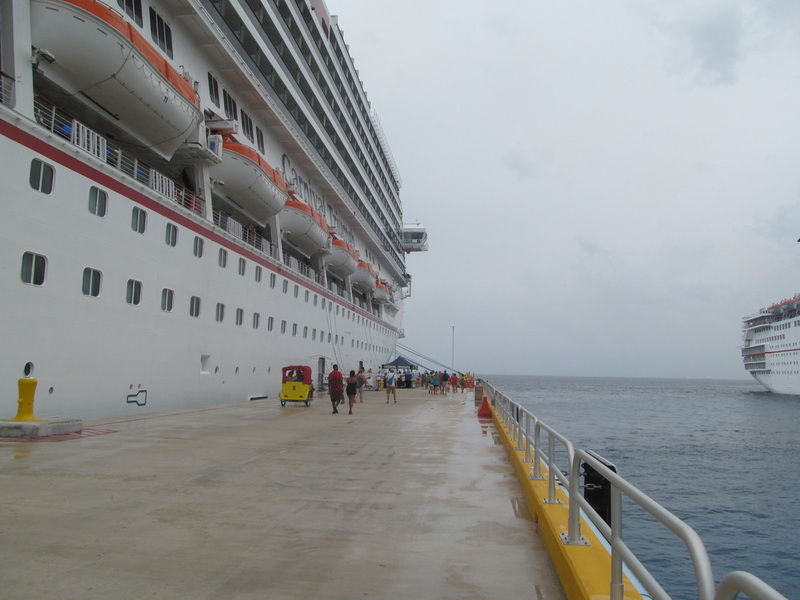 There was a very short line to get back on the ship. 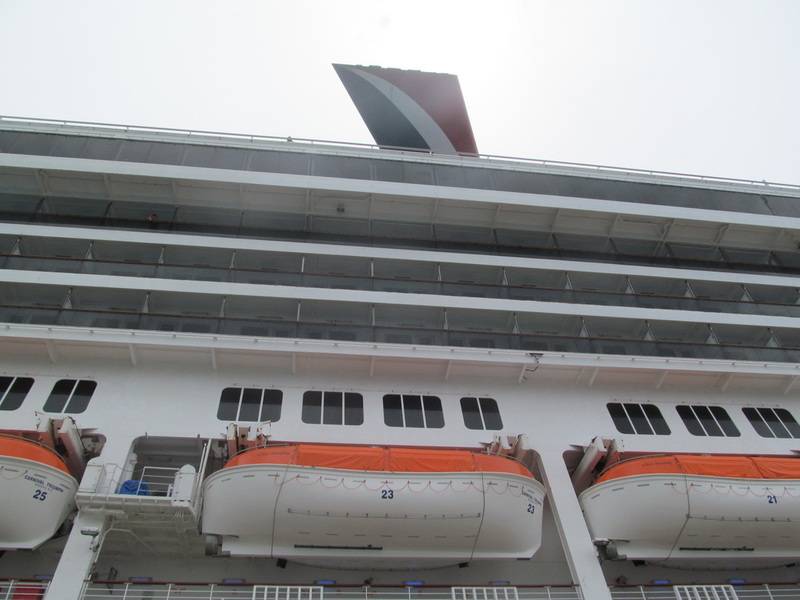 In order to get back on, we had to have our Sail & Sign cards scanned by security and then wait in line for the security checkpoint. 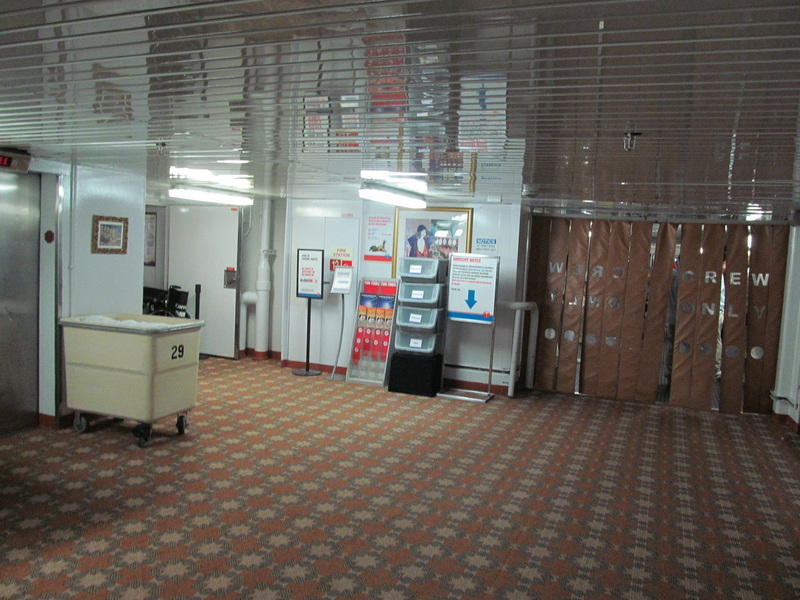 The security checkpoint consisted of a metal detector and putting all belongings on a conveyor belt for scanning. 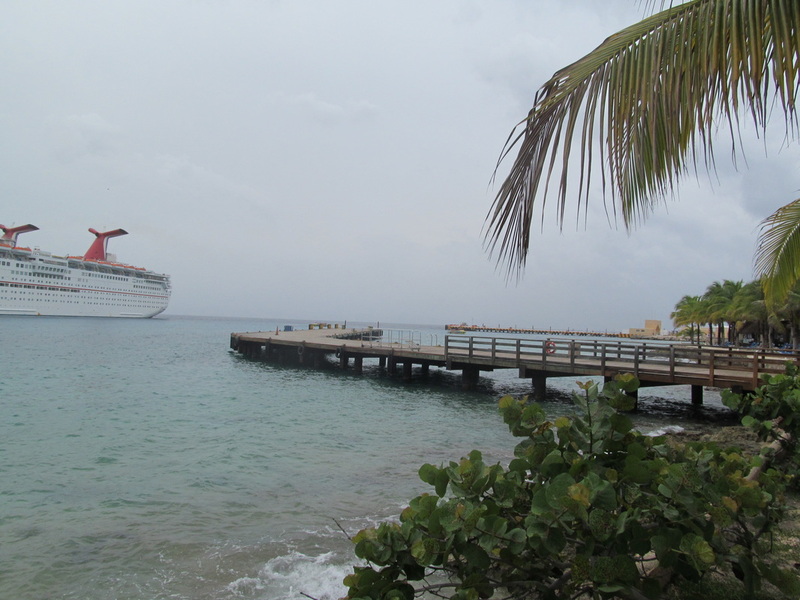 Cruisers that set the metal detector off received a pat down. 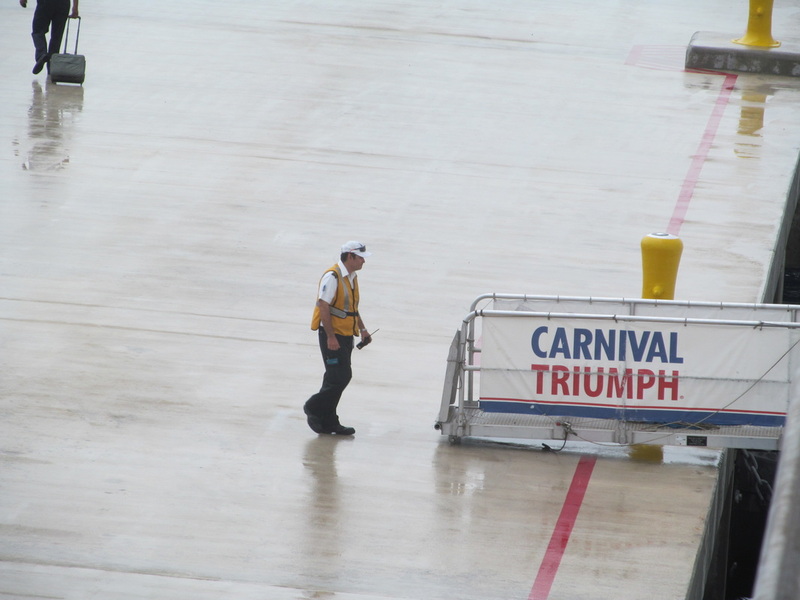 When I last sailed on the Carnival Triumph I recieved a pat down, but this time I did not need one since I did not set the alarm off. 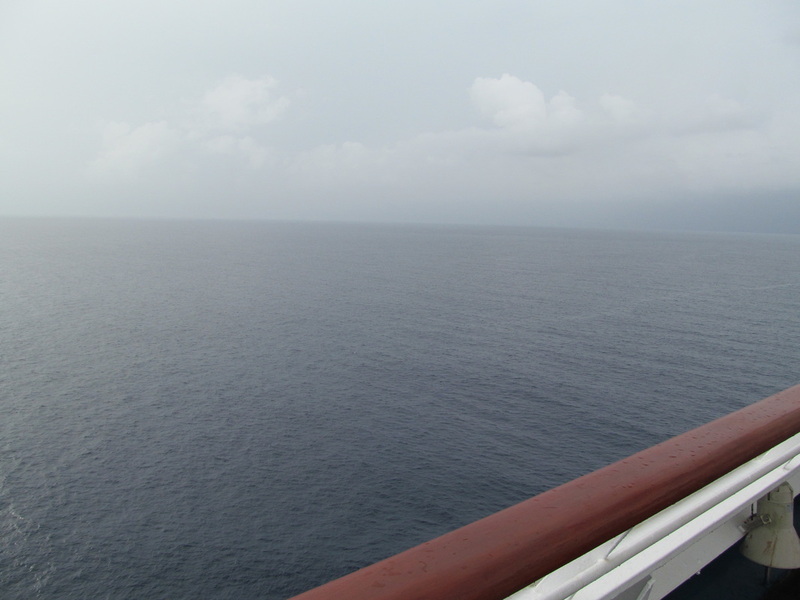 After going through the security checkpoint, we headed up to our stateroom. 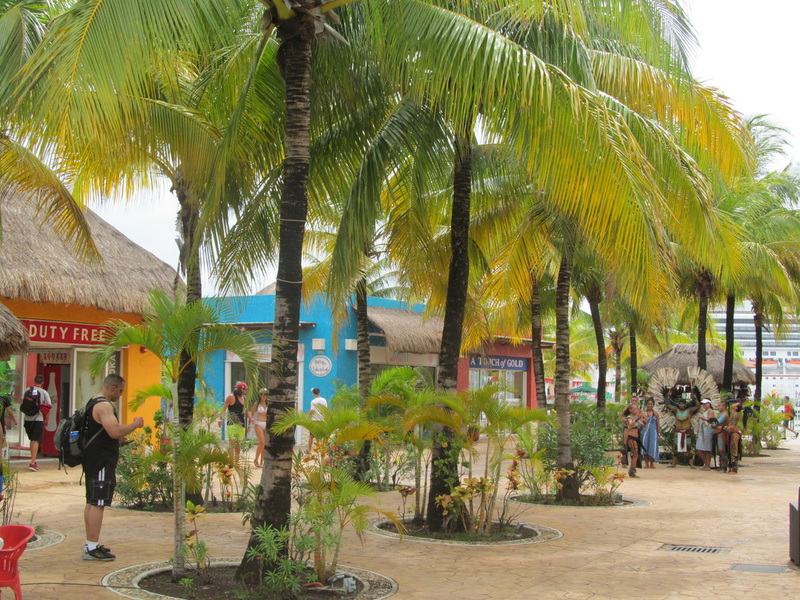 On sea days, the line for Guy's Burger Joint is long. 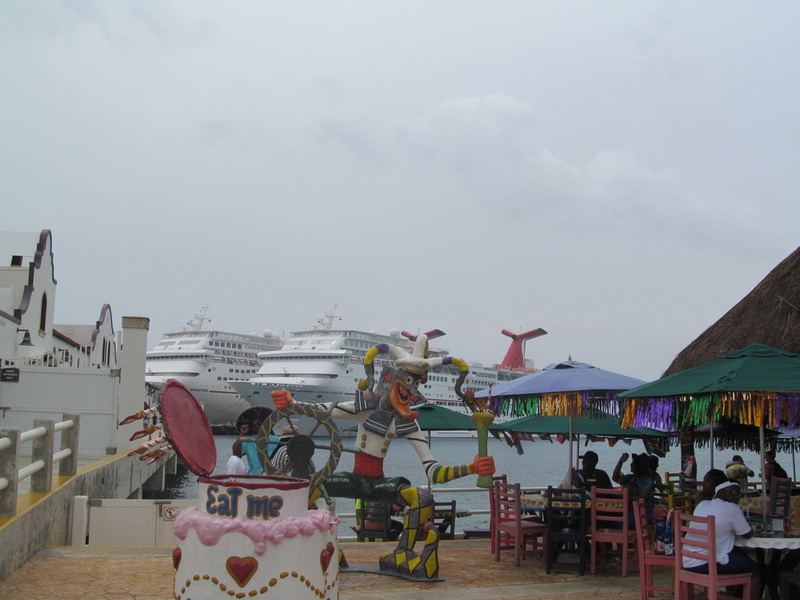 However, since many people were ashore on this day of the cruise the line for Guy's Burger Joint was extremely short. 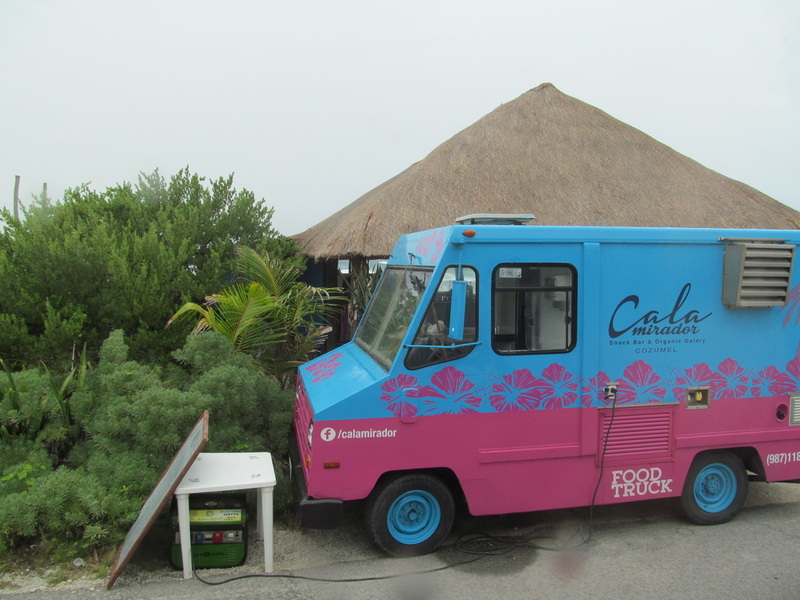 I got in line for a burger. 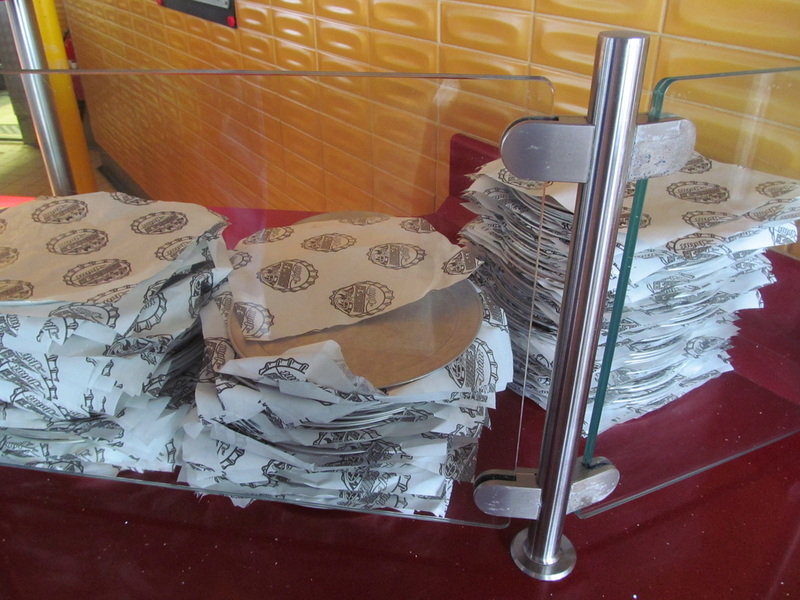 There are a few different types of burgers to choose from. 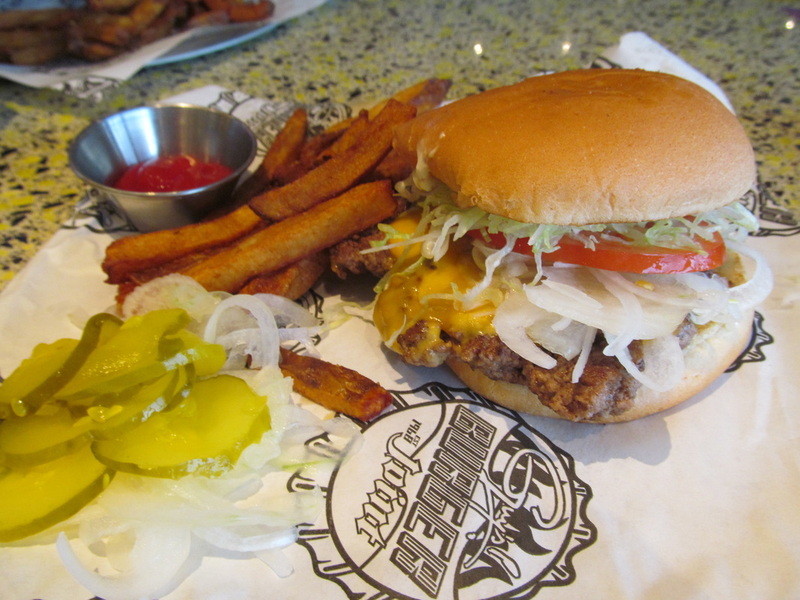 I ordered the burger that was called the "Straight Up". 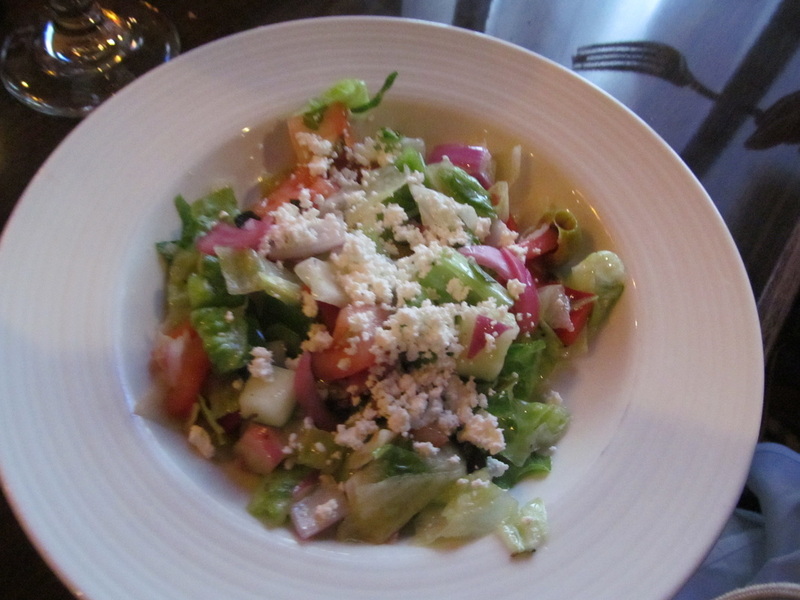 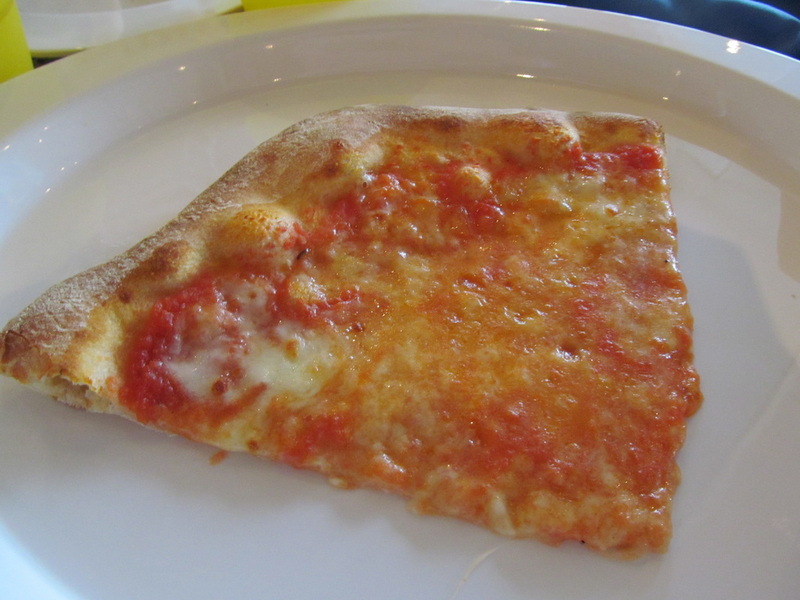 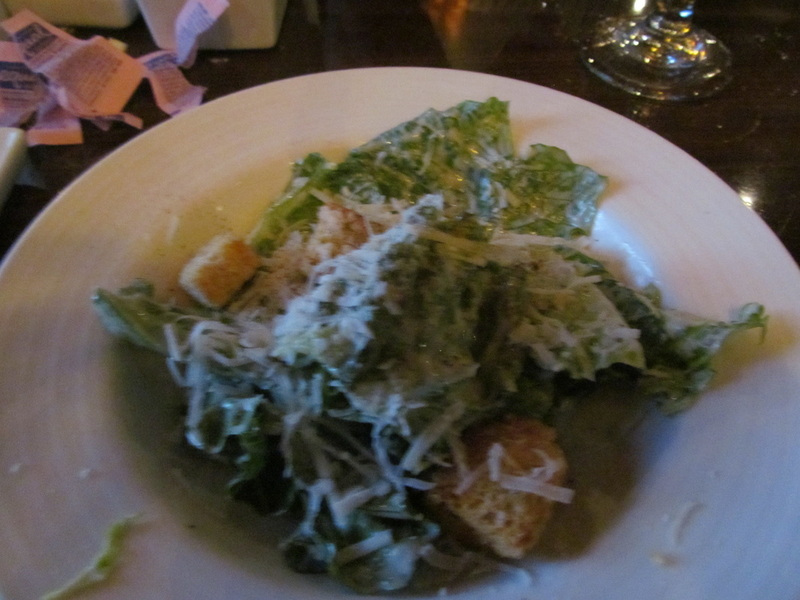 It came with cheese, tomato, lettuce, and onion. 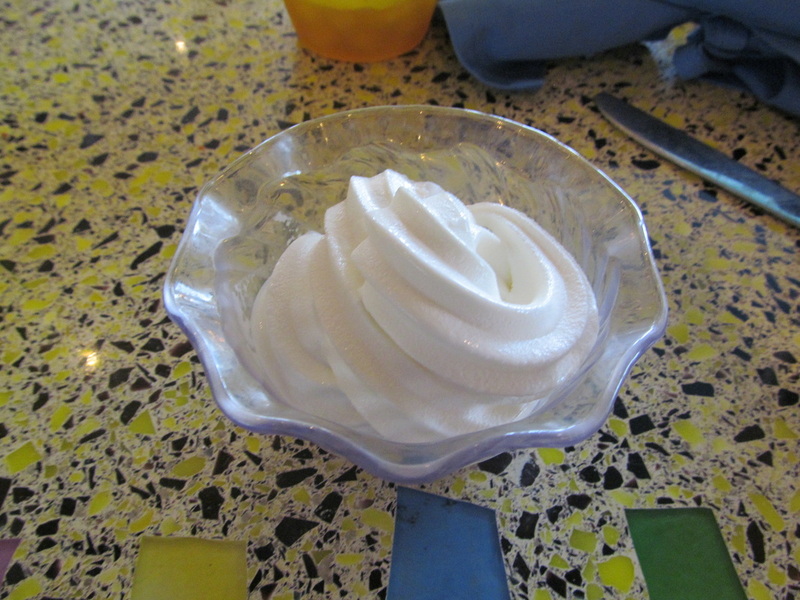 The crew members asked if I wanted fries and I told them I did want fries. 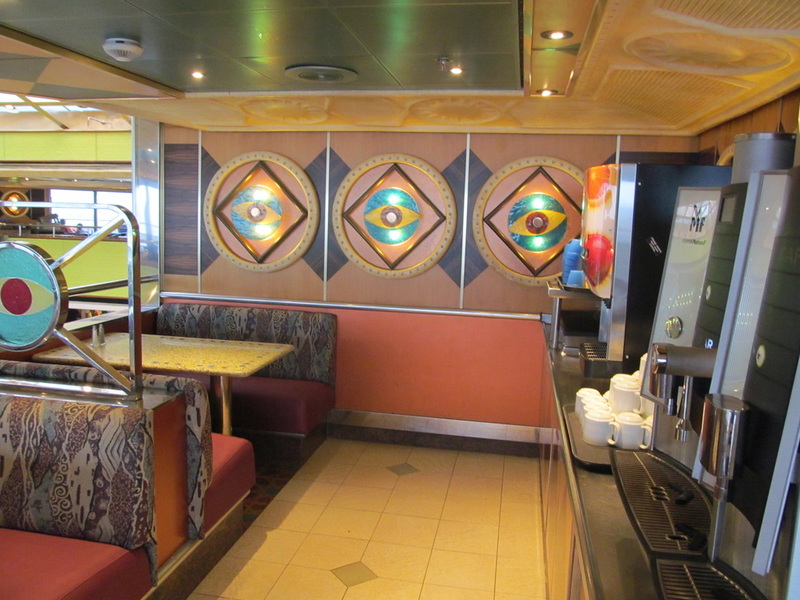 Guy's Burger Joint has a toppings bar that is away from the main serving counter that allows cruisers to add things such as bacon and other vegetables to a hamburger. 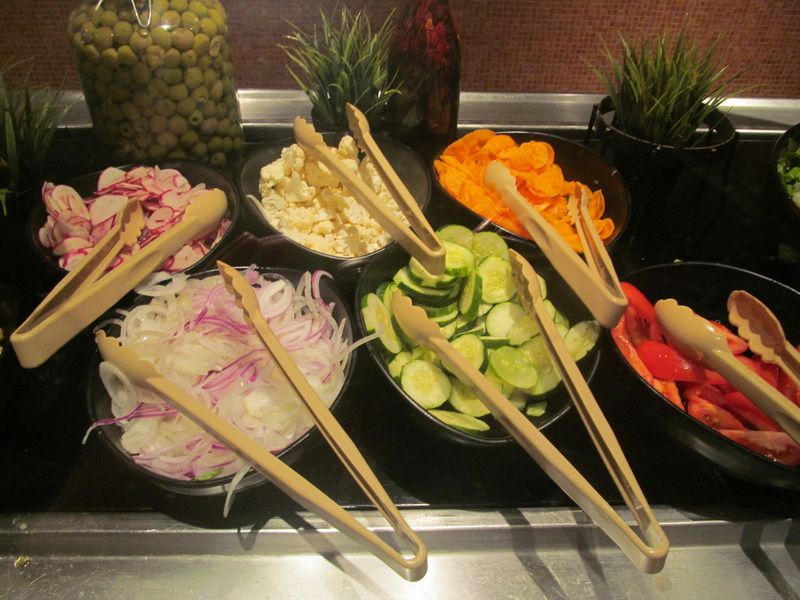 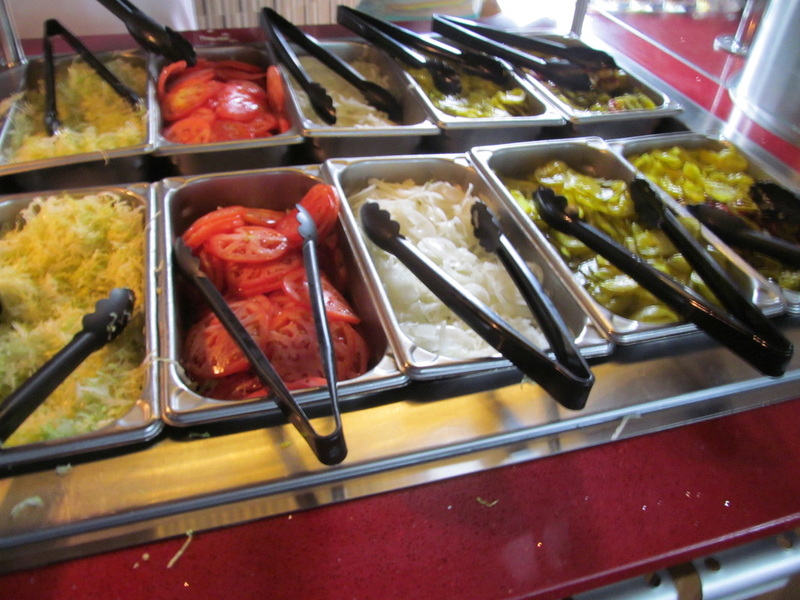 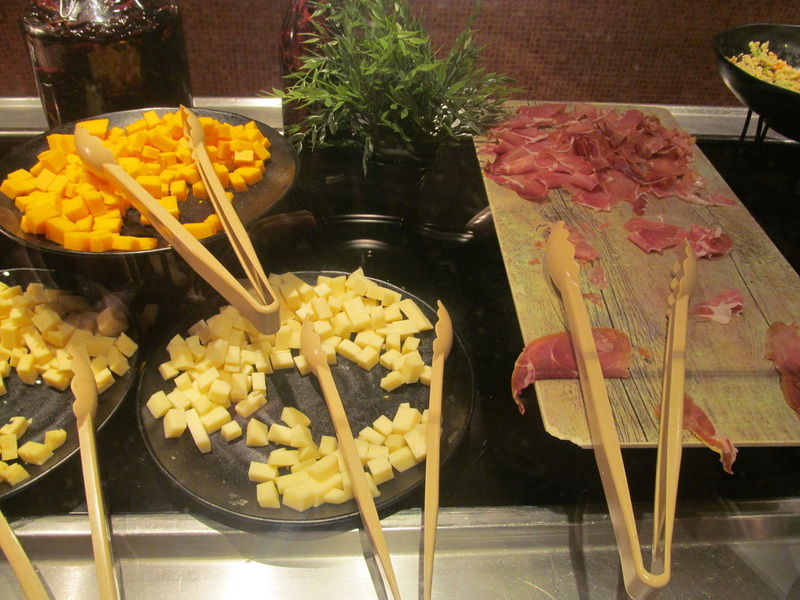 The toppings bar also has a dispenser filled with ketchup, ranch, mayo, and other dressings. 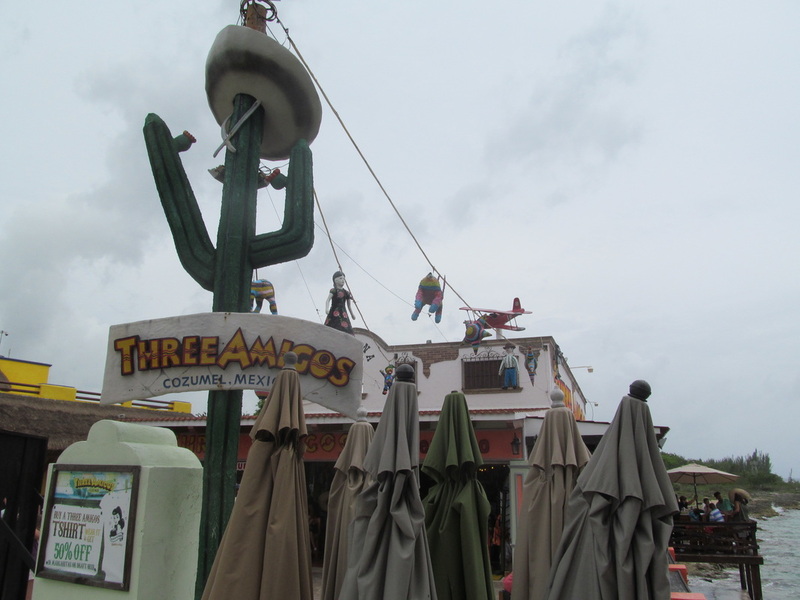 My hamburger tasted extremely good. 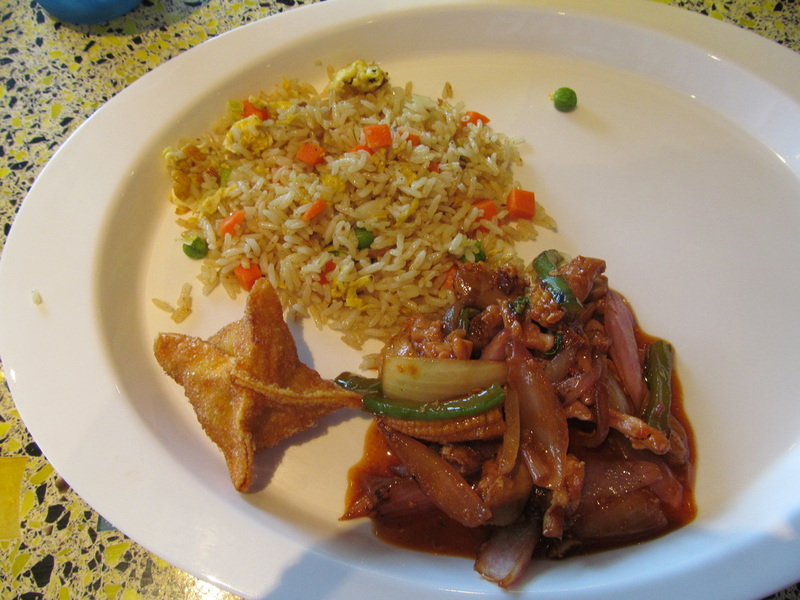 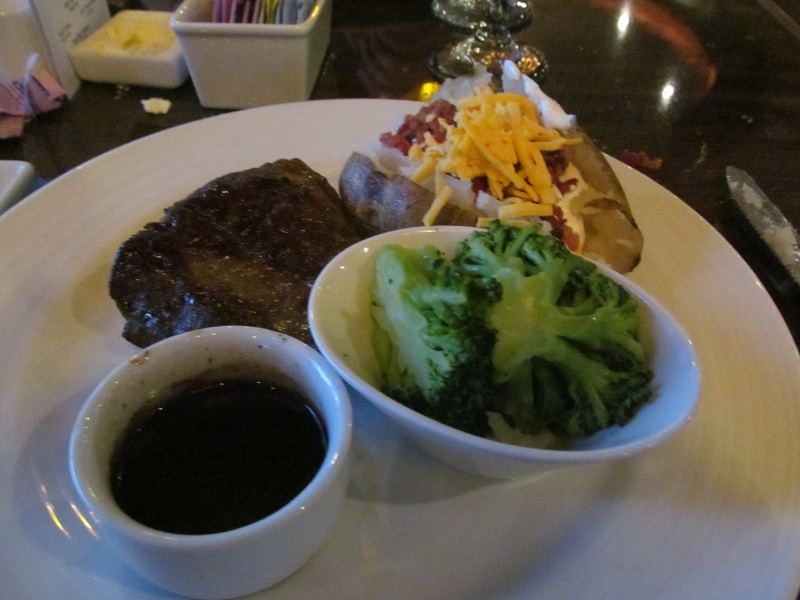 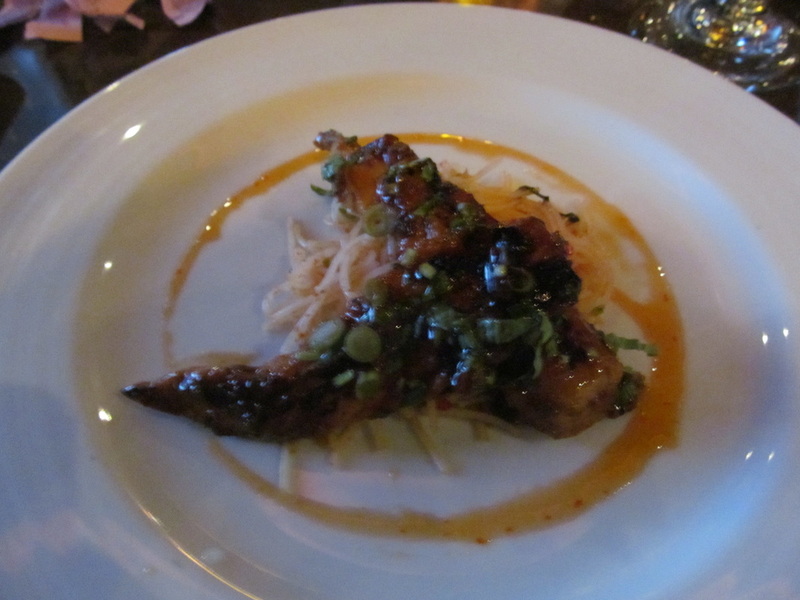 The meat had a good flavor and all of the vegetables tasted fresh. 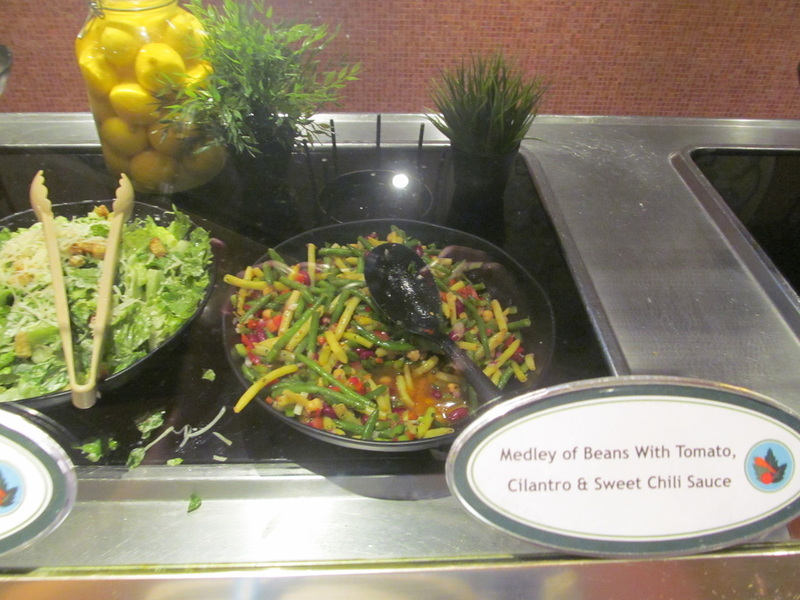 The french fries were a little spicy, but good. 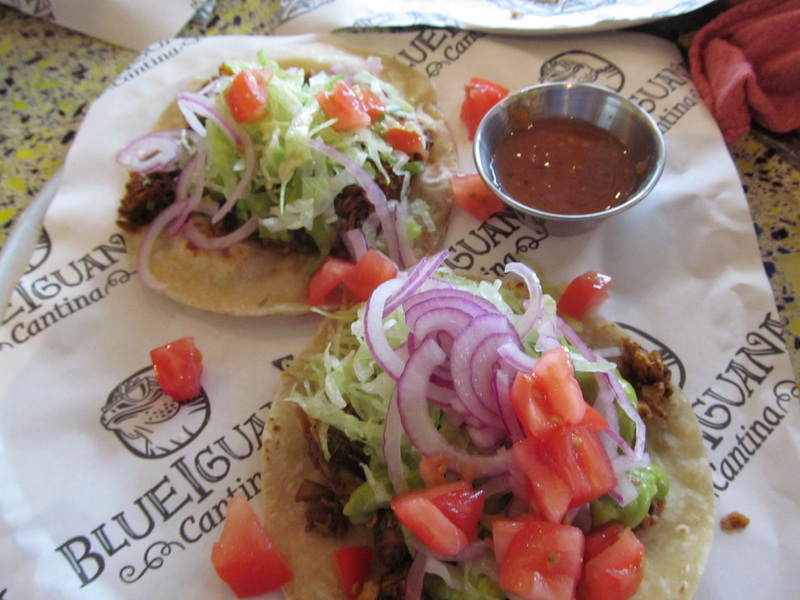 I think the quality of Guy's Burger Joint has improved since I first tried it in 2013. 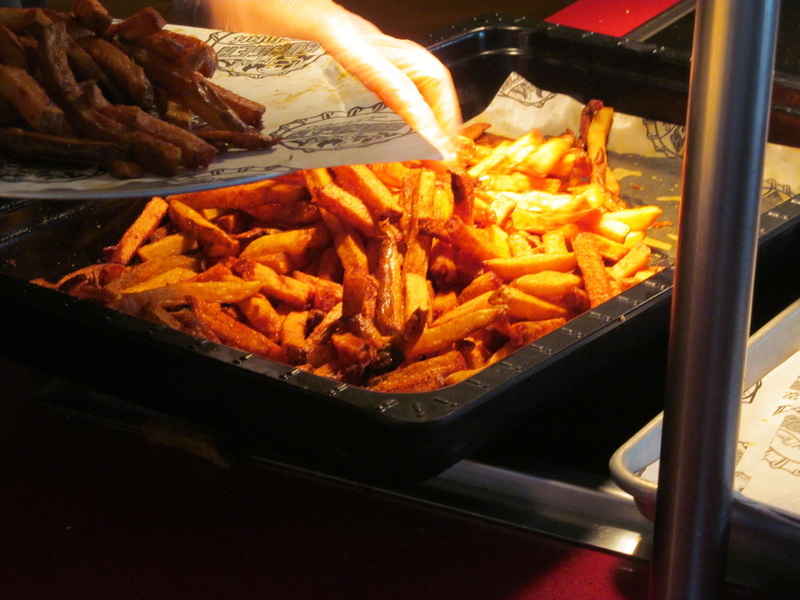 Guy's Burger Joint's French Fries - Extremely Good! 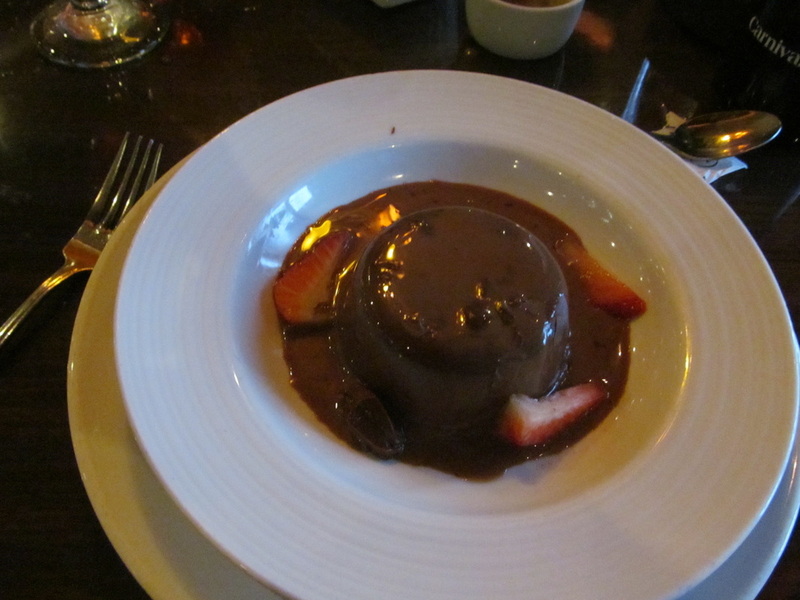 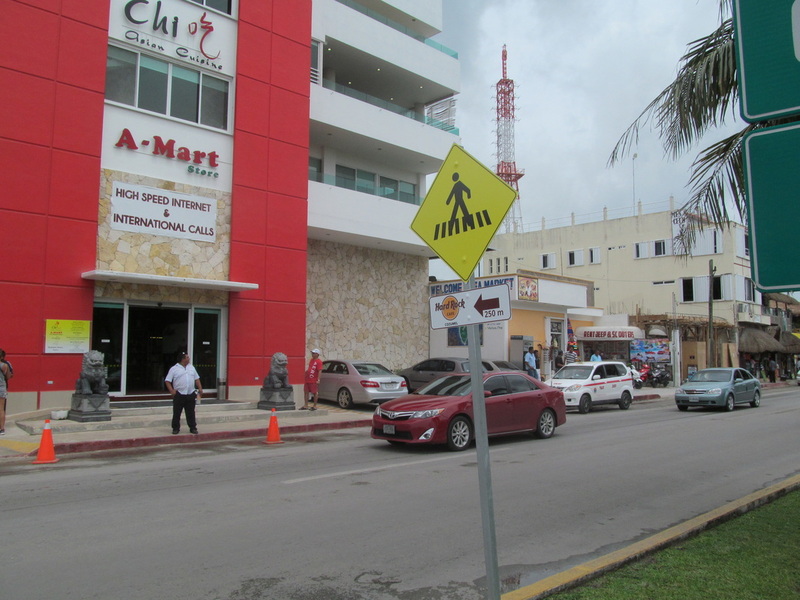 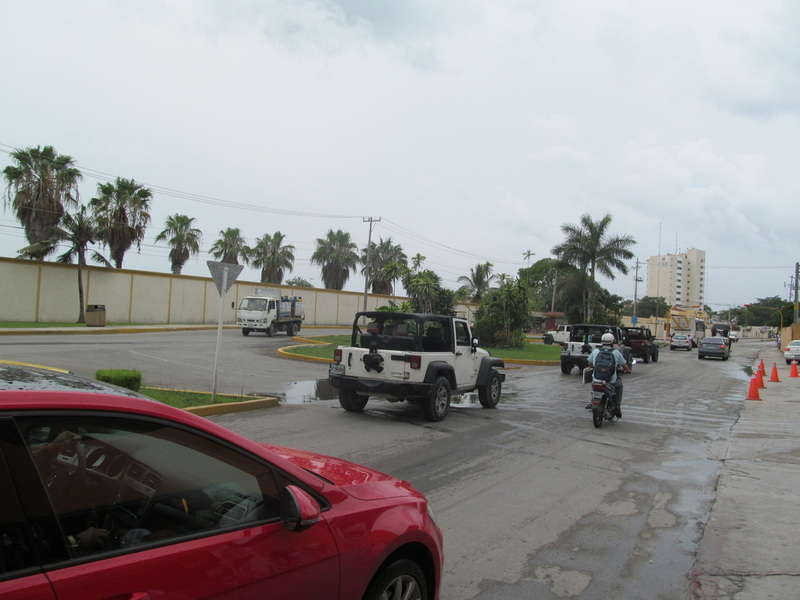 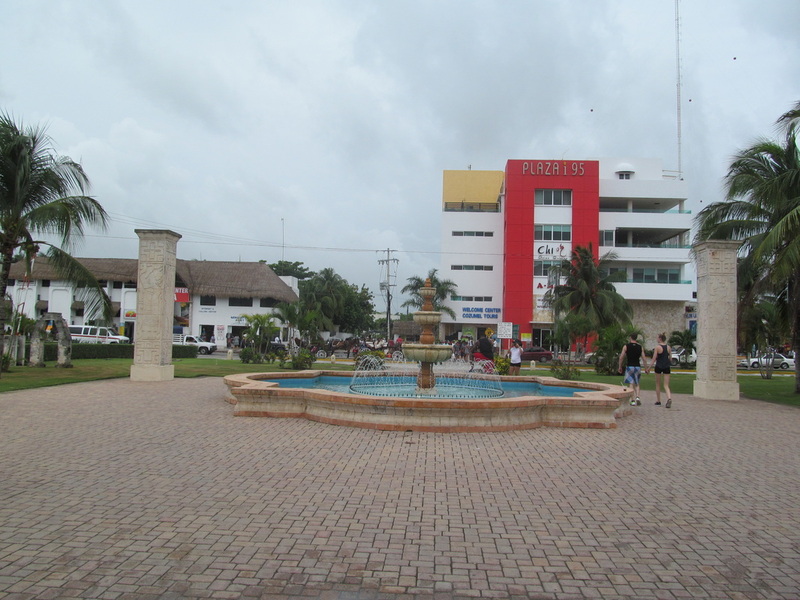 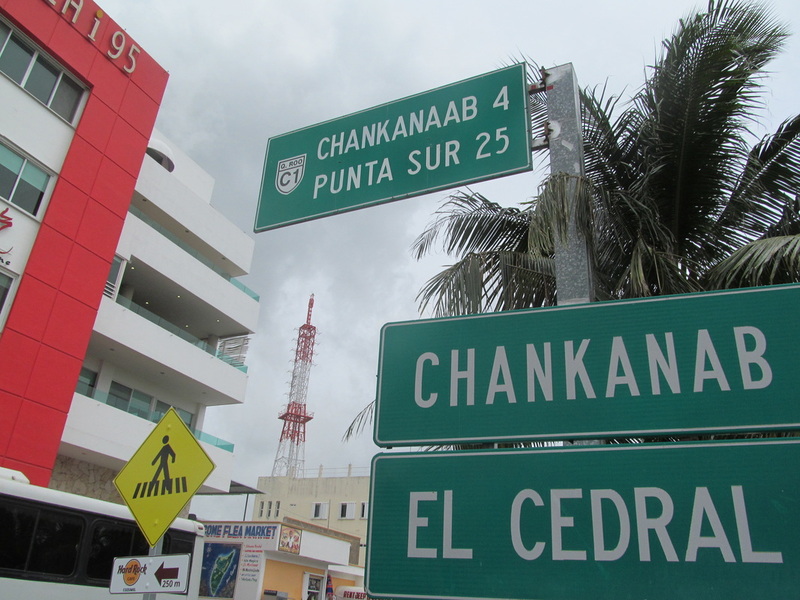 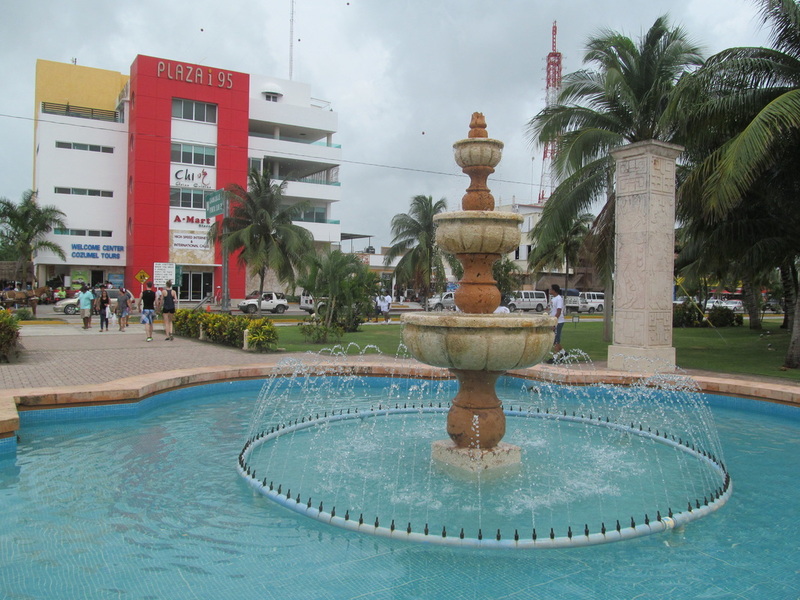 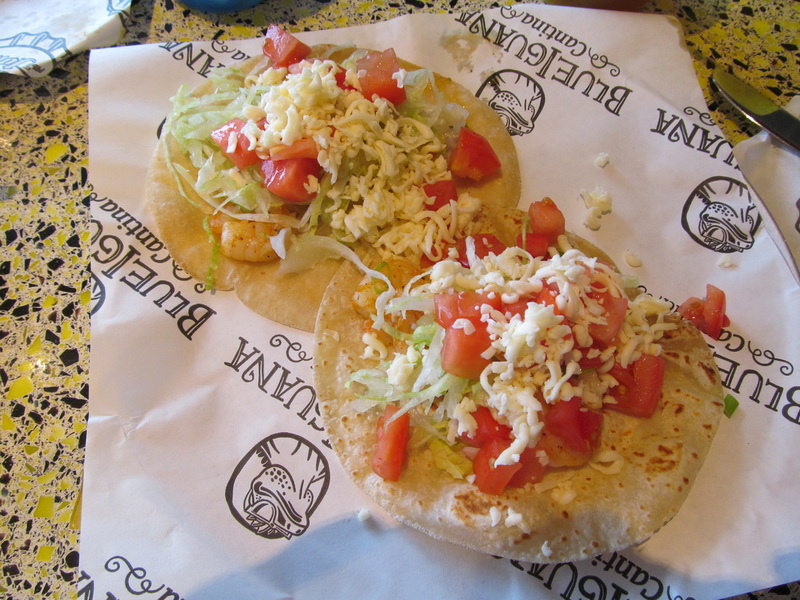 After walking around Puerta Maya, we decided to leave Puerta Maya and walk across the street. 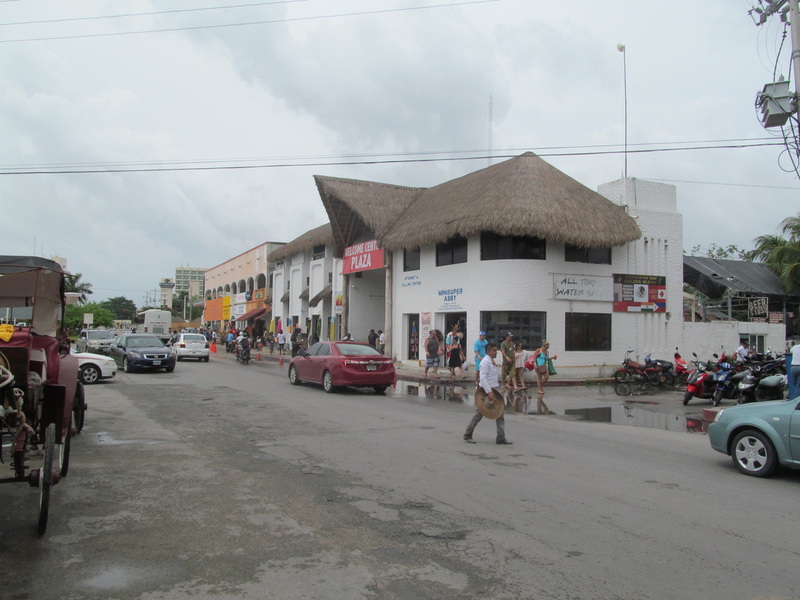 The area across the street has many shops and bars. 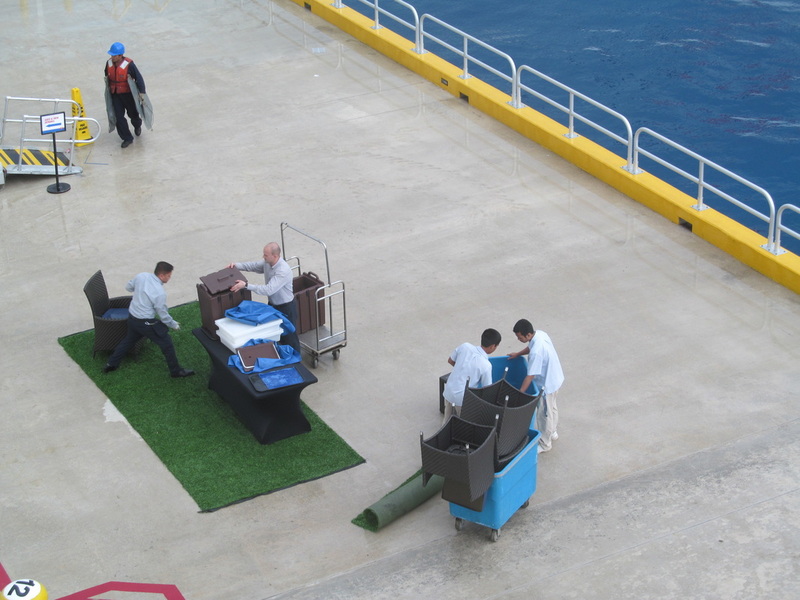 There were many crew members and some guests in these areas. 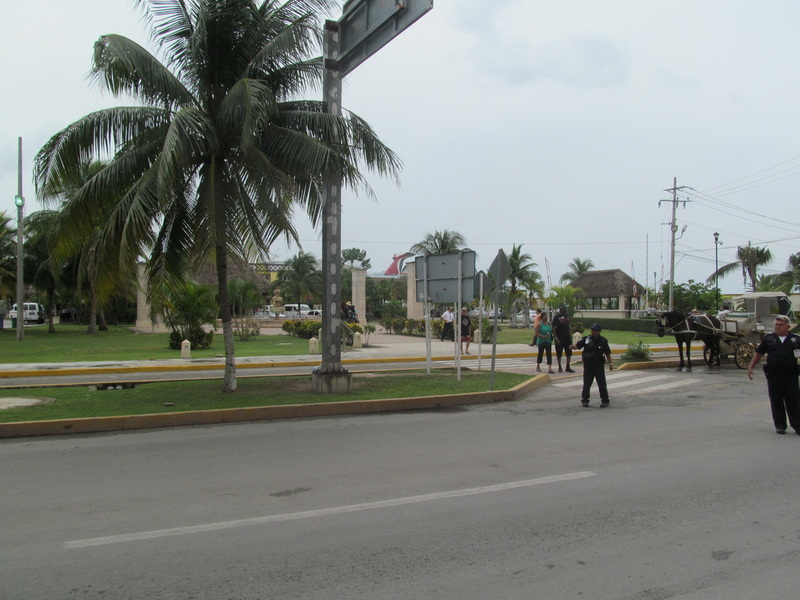 One downside to crossing the street is the traffic is heavy, but a uniformed police officer was stopping traffic to allow people to cross the street. 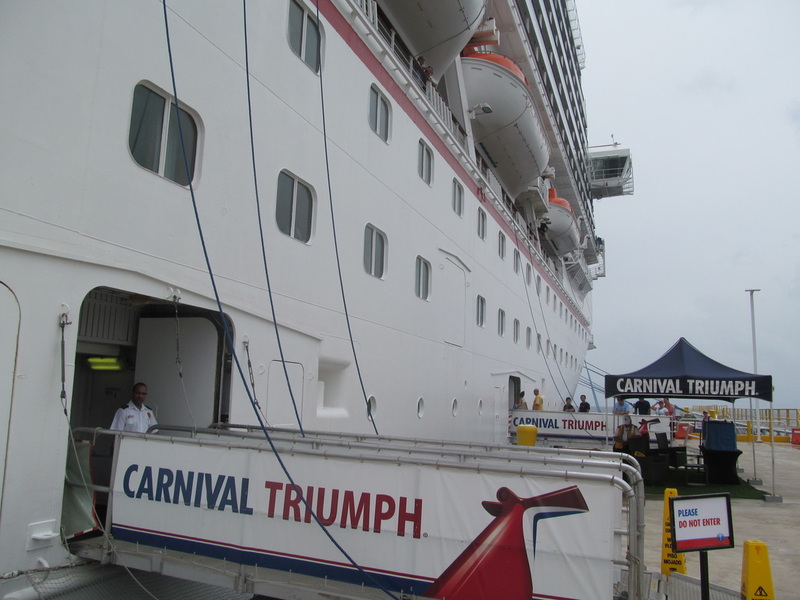 Prior to be allowed on the pier, we once again had to show our Sail & Sign cards and passports. 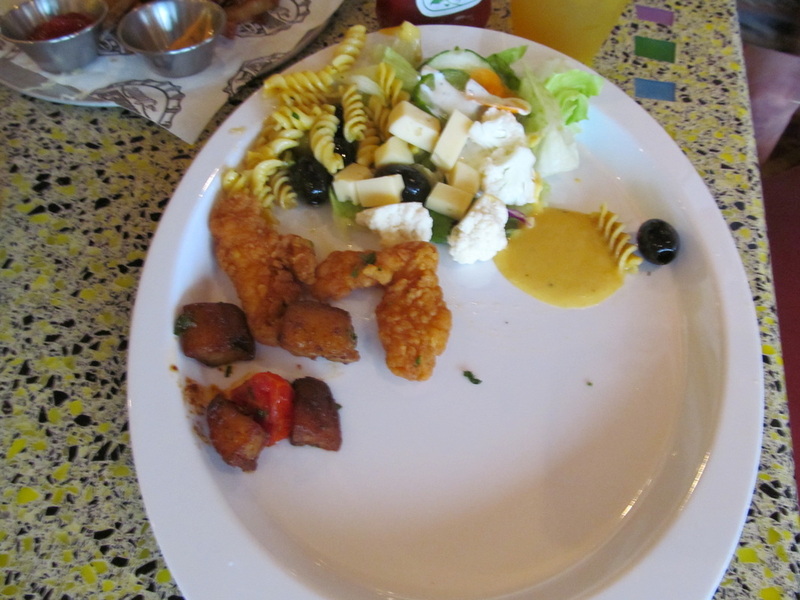 There were some people that tried to bypass security and they were instantly redirected to the back of the line. 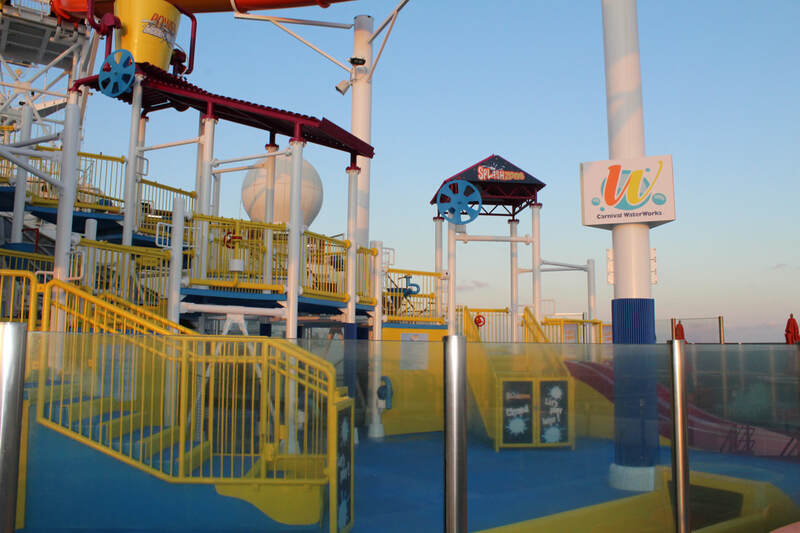 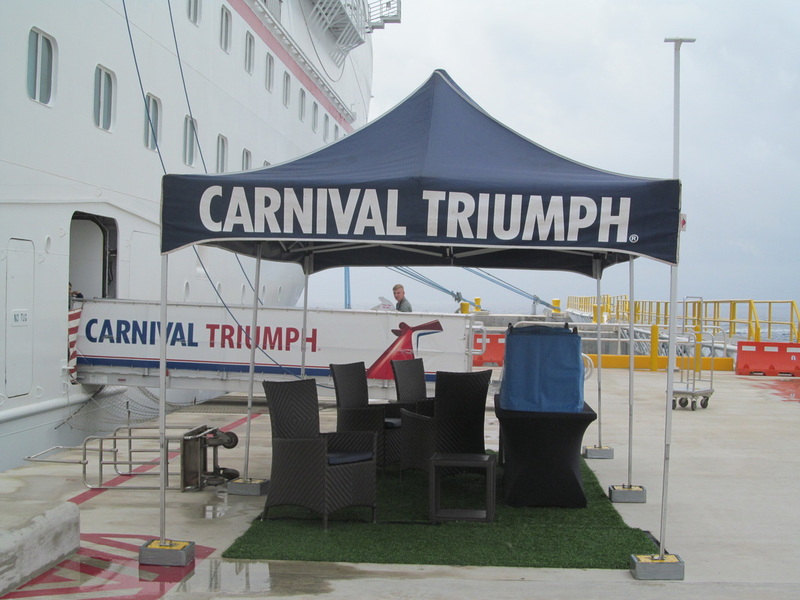 By the front gangways, Carnival had a tent with water and chairs setup. 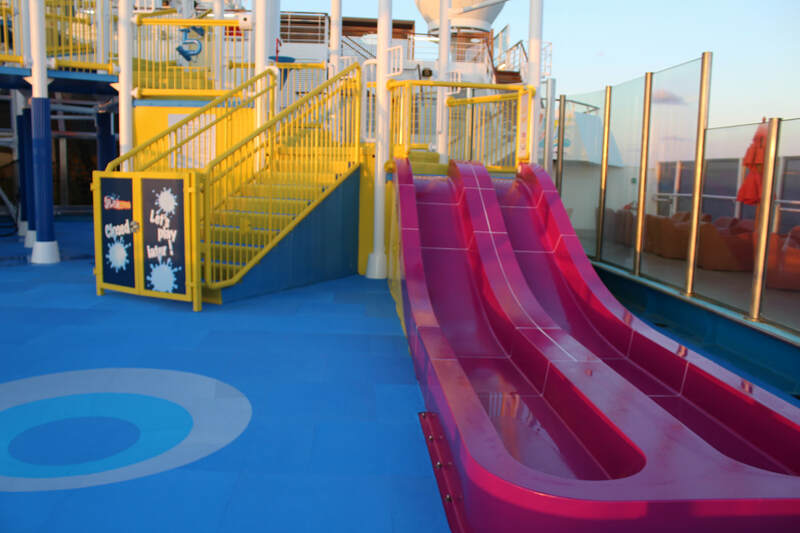 This seemed like a great idea. 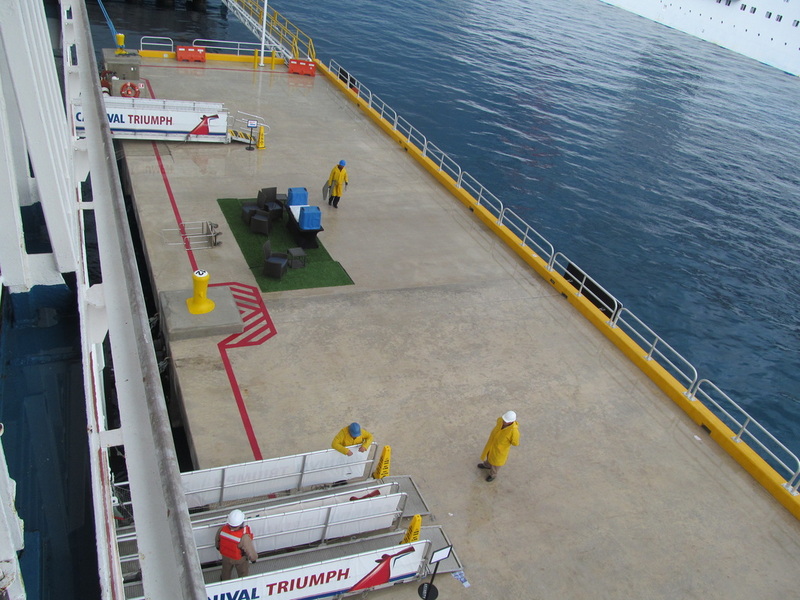 Since it was not hot or sunny outside, I did not see this area utilized. 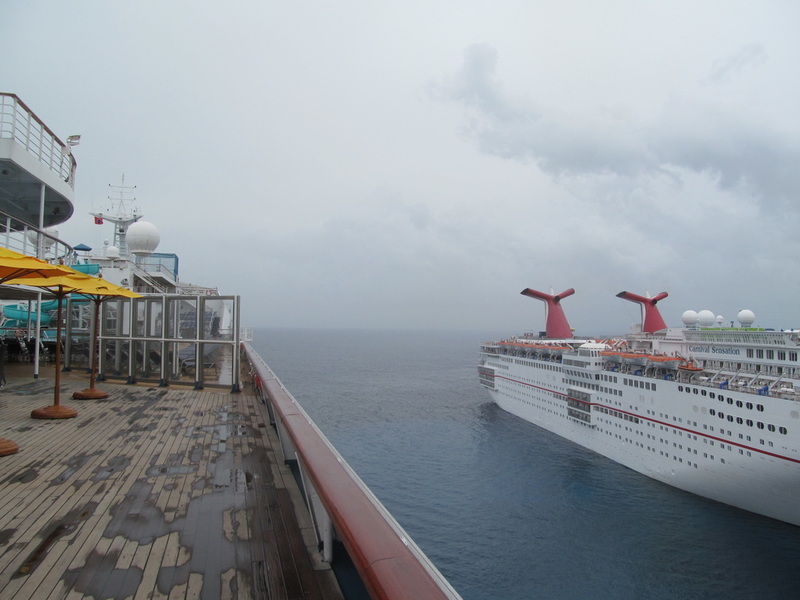 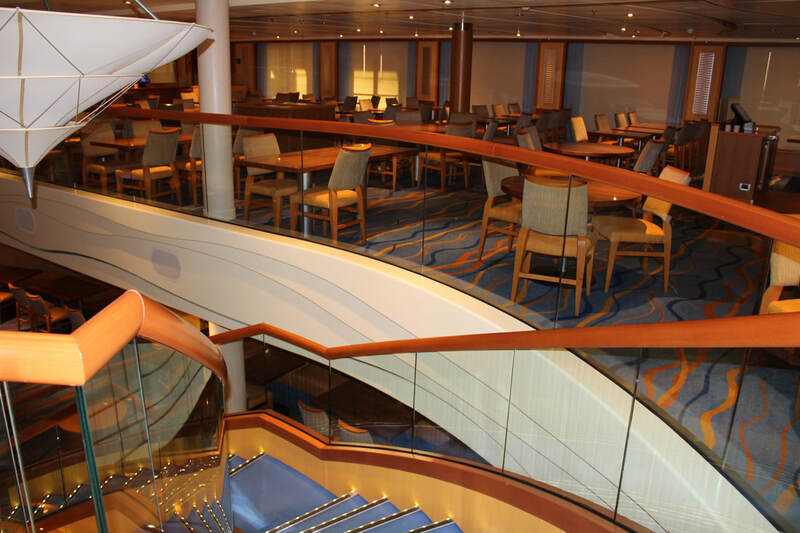 The designated time for cruisers to be back onboard was 4:00pm in order for the ship to sail at 4:30pm. 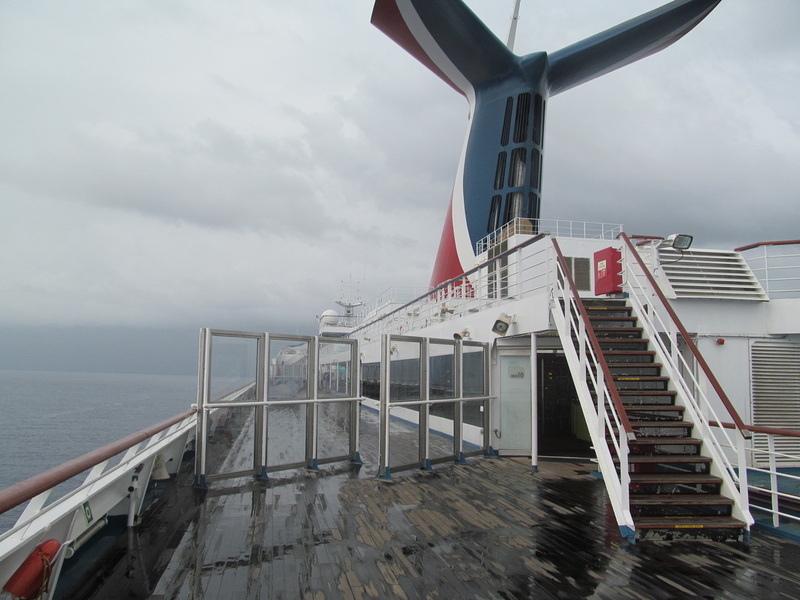 Around 4pm, we walked outside on Deck 3 to see if there was a line for boarding. 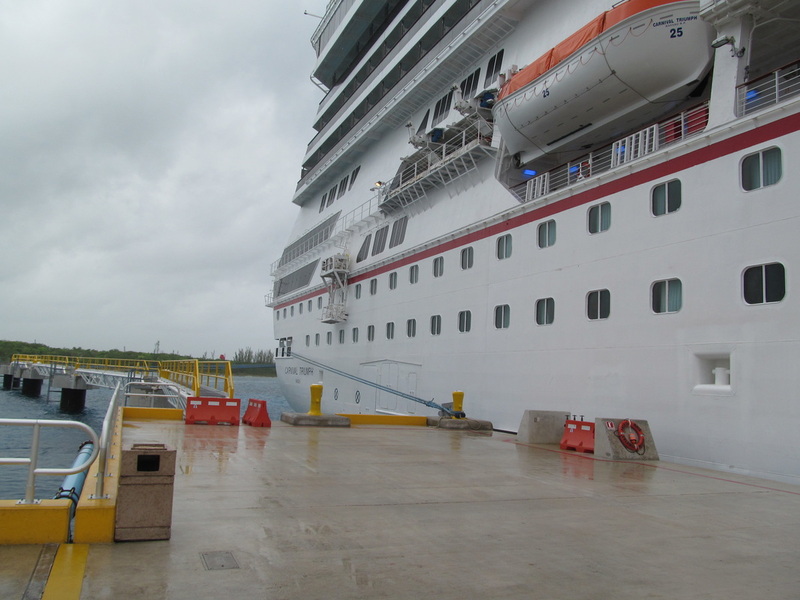 Surprisingly, the front gangways were being disassembled. 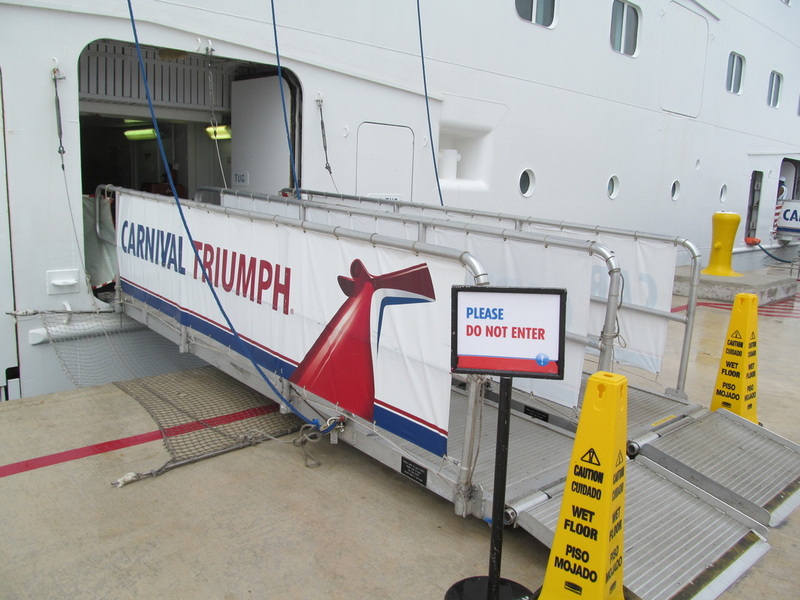 This probably was because most people were entering through the back gangway and not walking farther to the front gangways. 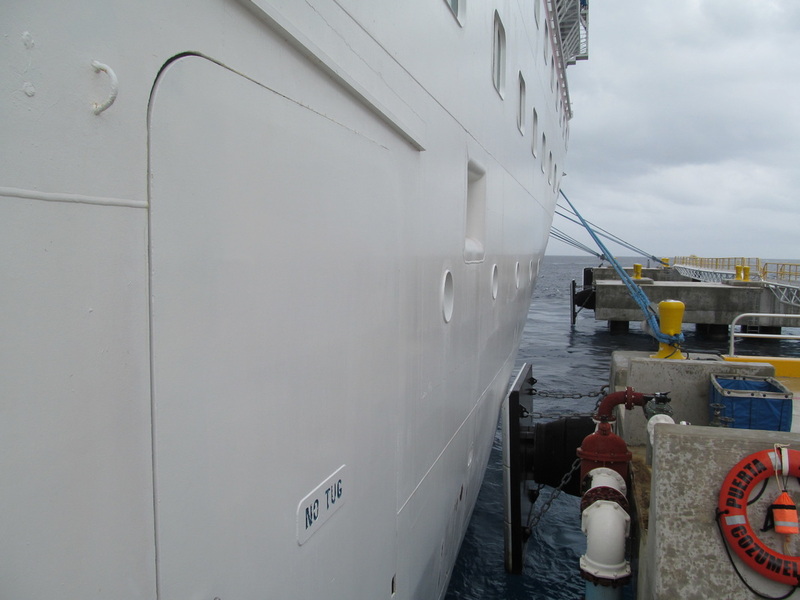 It did not take the crew much time to put up the front gangways. 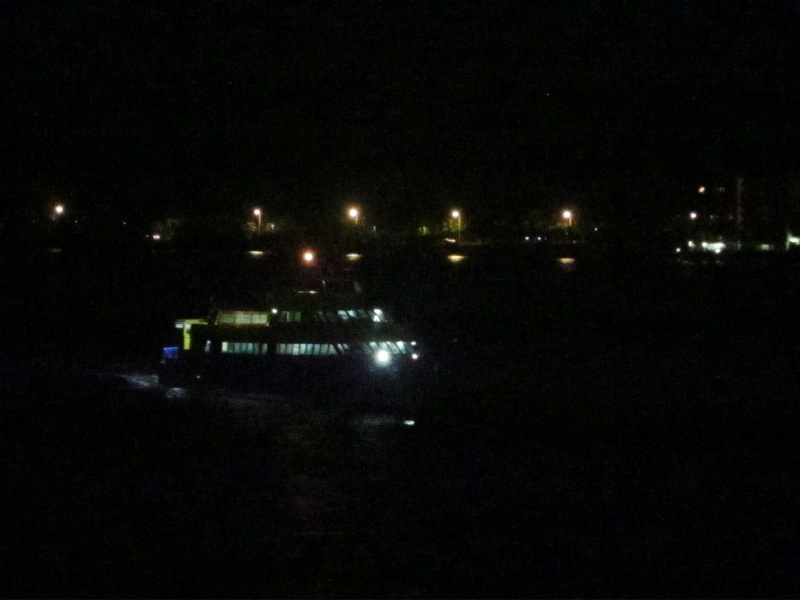 There were a few people that boarded extremely late. 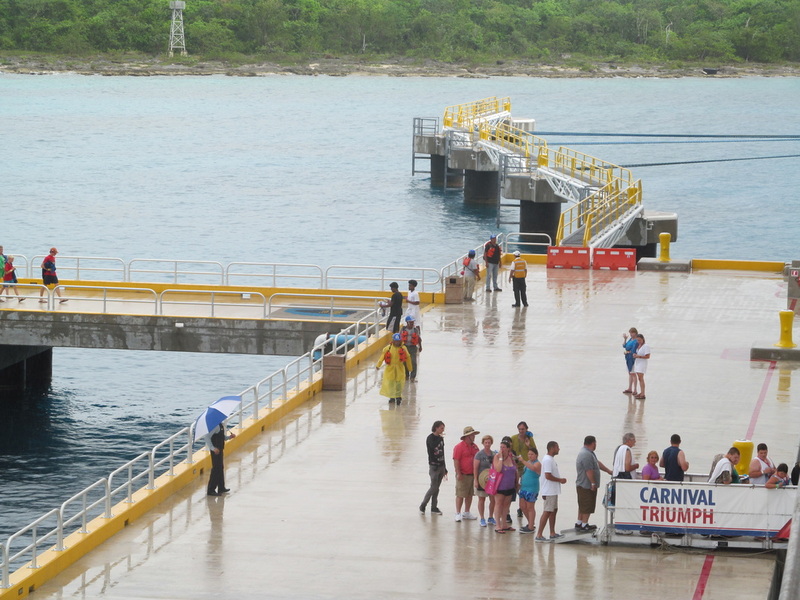 For a while the pier was empty, but the gangway was still out because some cruisers were not yet onboard. 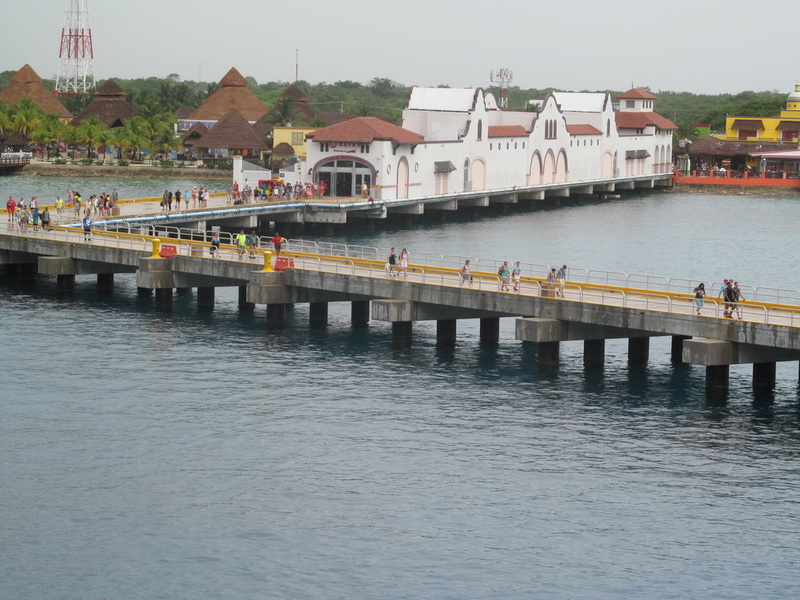 A little before 4:30pm, some of the last people walked down the pier. 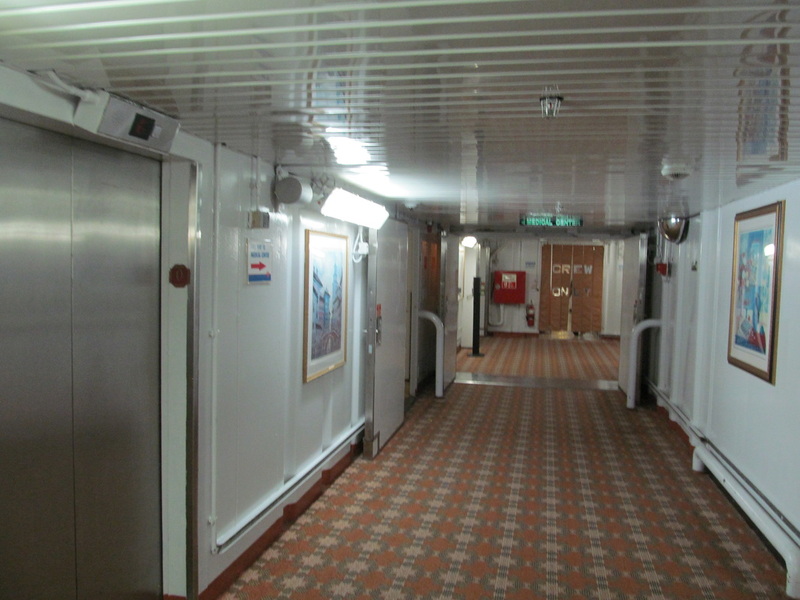 After those people boarded, the back gangway was brought into the ship. 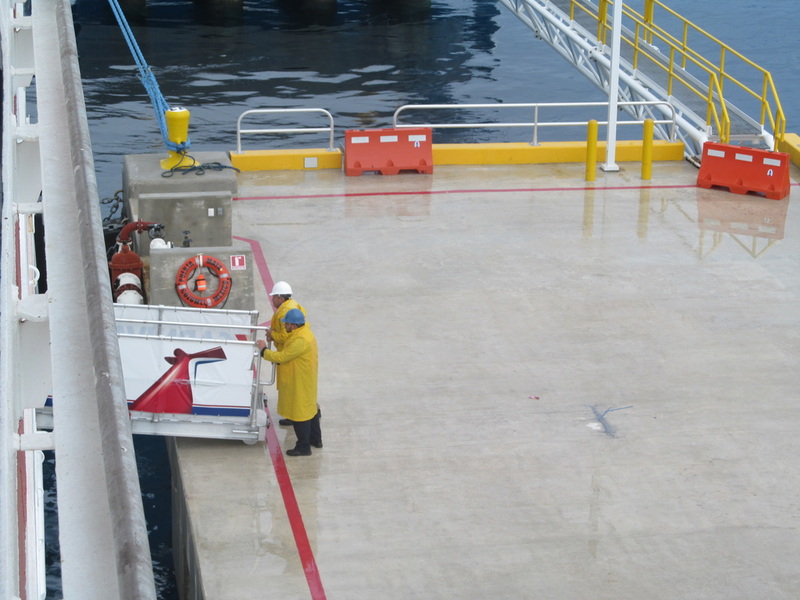 Within a few minutes it was time for the ship to be untied from the dock. 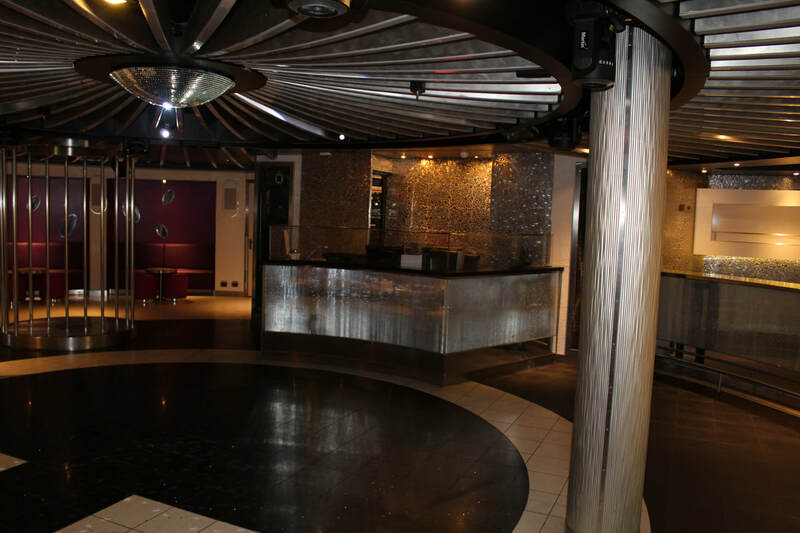 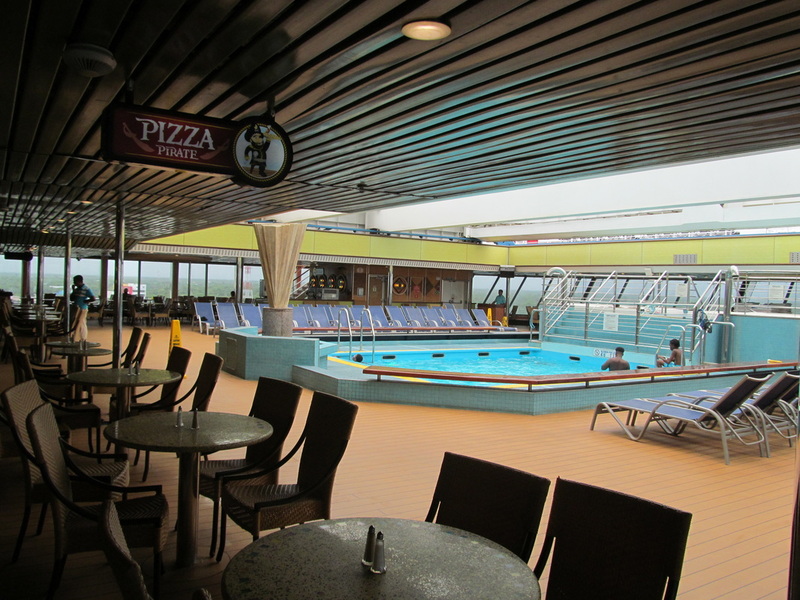 After watching sail-a-way I stopped in the South Beach Club for a quick drink of water. 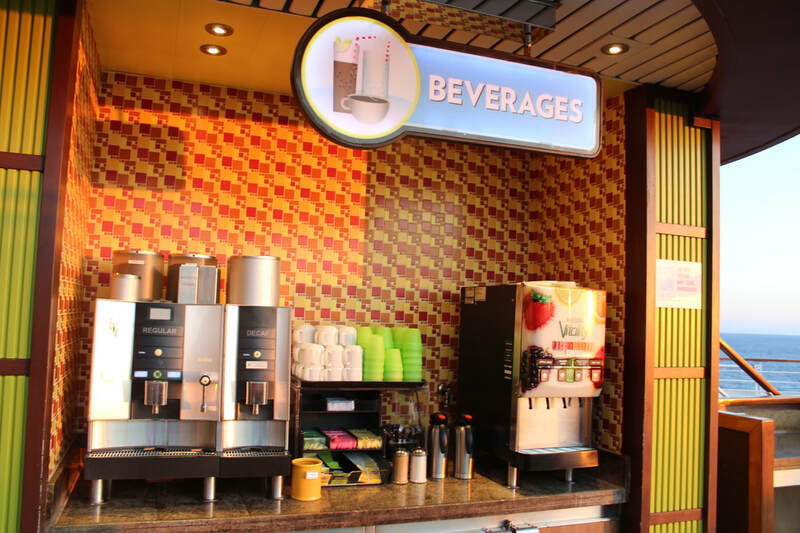 On the 2nd floor of the South Beach Club (the Deck 10 level) there is a beverage station that many cruisers do not know about. 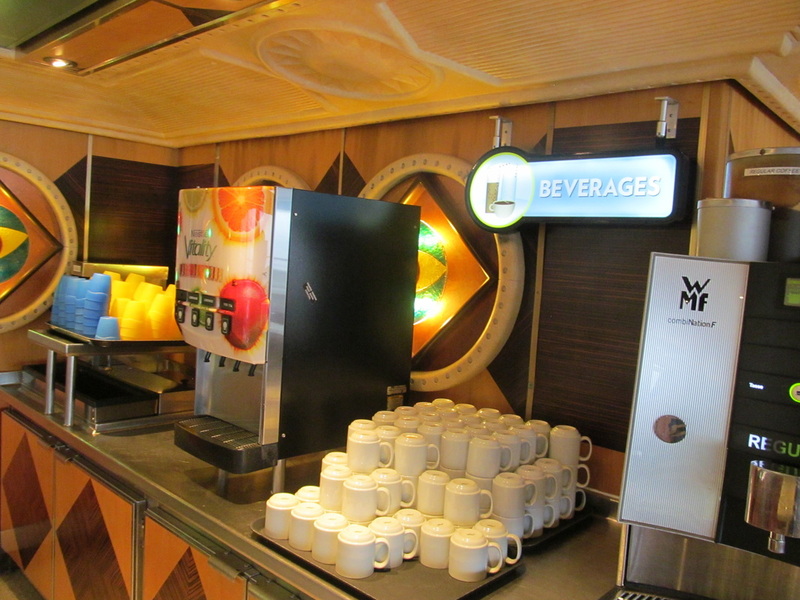 This beverage station had water, tea, lemonade, and coffee. 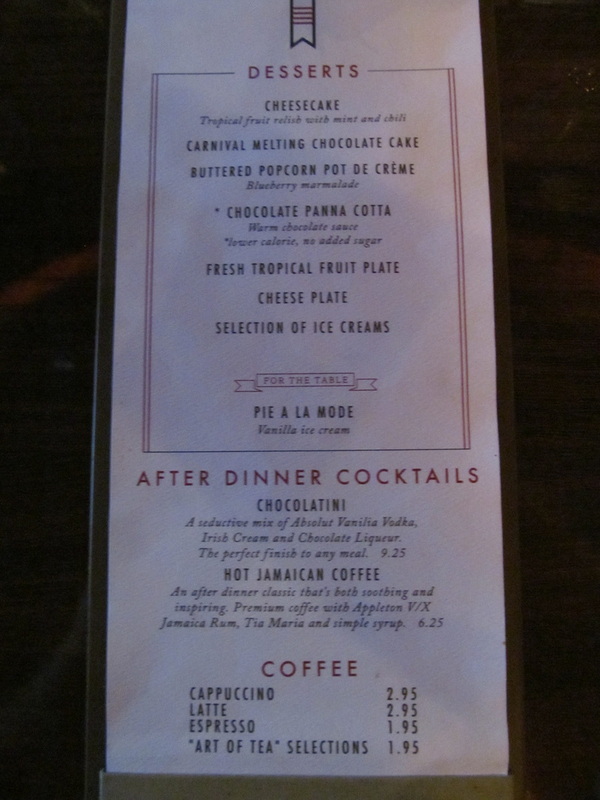 American Table Appetizers Menu - Click Photo To Make It Larger! 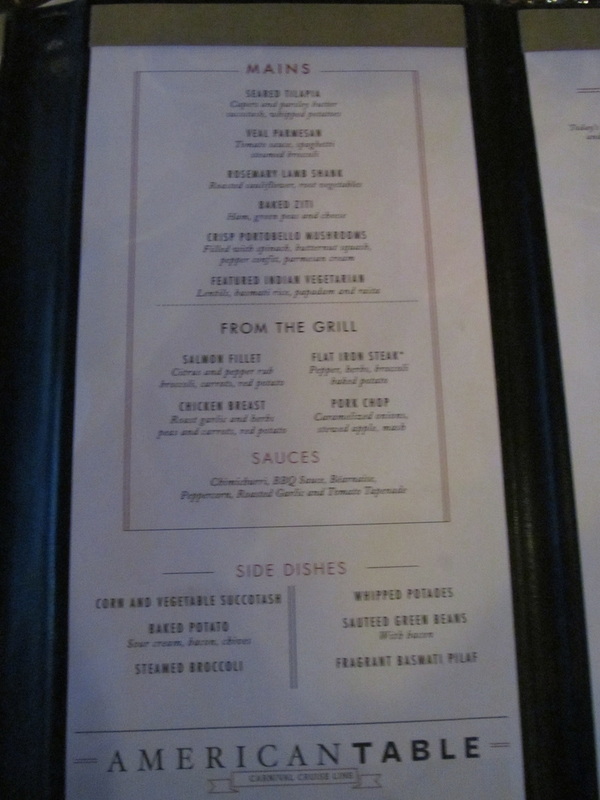 American Table Main Course Menu - Click Photo To Make It Larger! 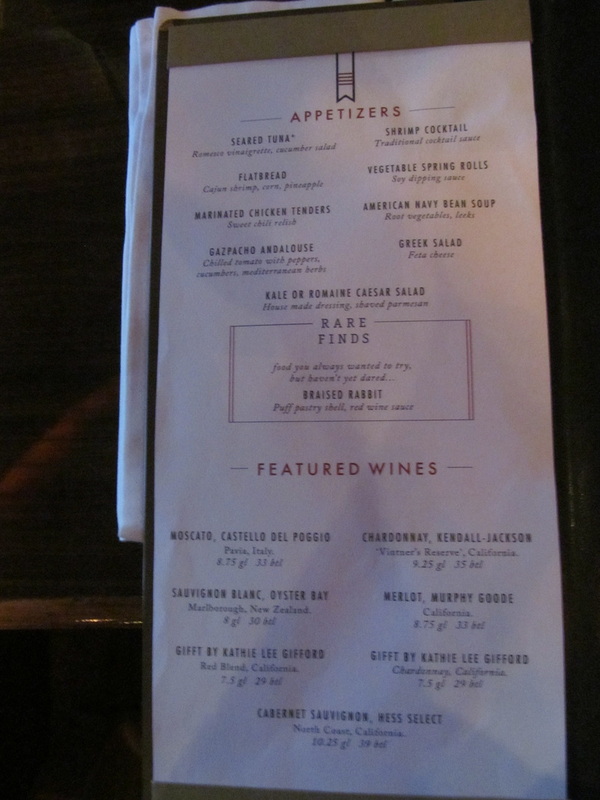 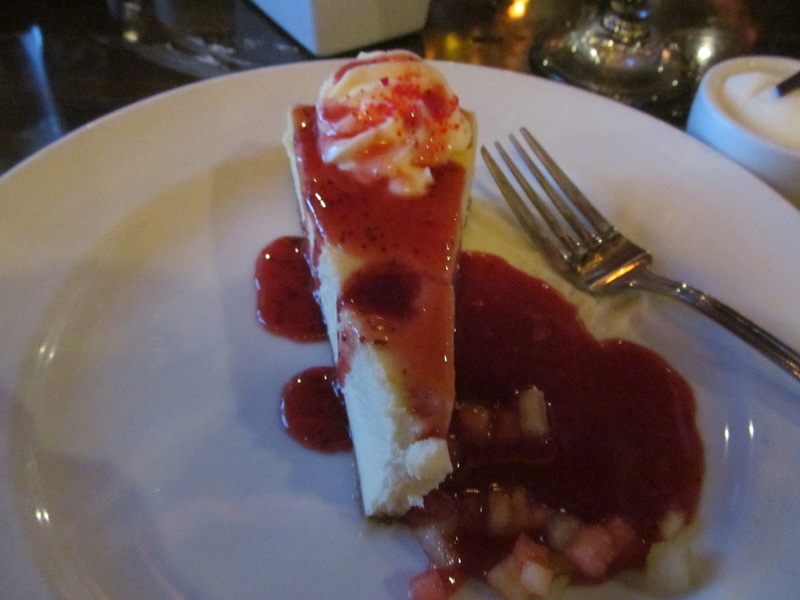 American Table Port of Call & Steakhouse Selection ($) Menu - Click Photo To Make it Larger! 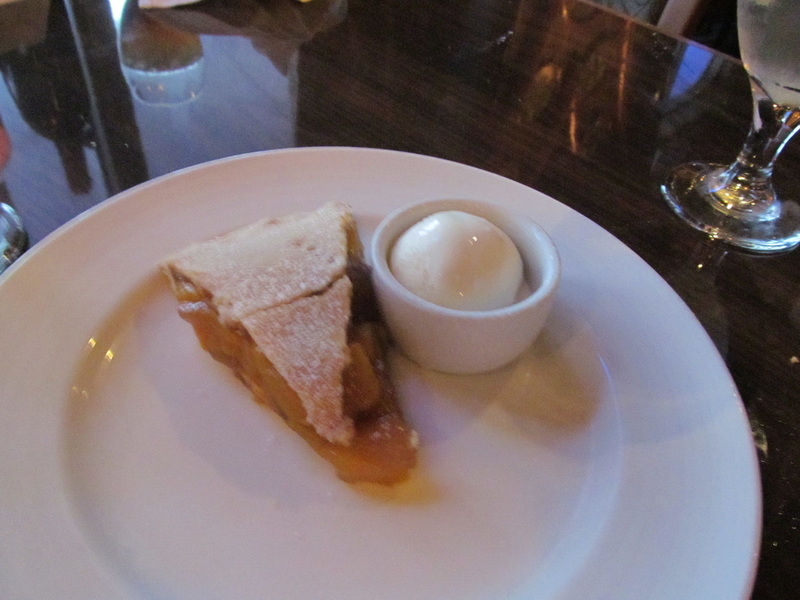 American Table Dessert Menu - Click To Make Photo Larger! 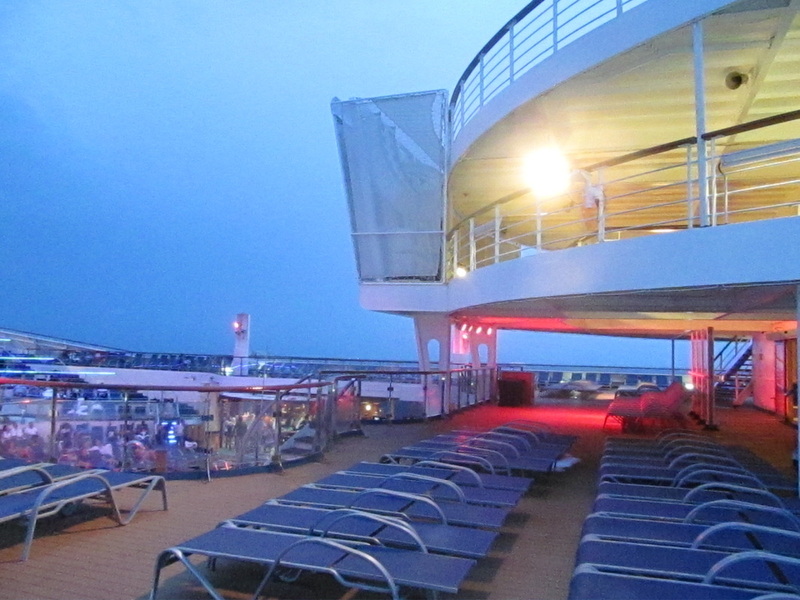 Around 7pm I was sitting in my stateroom when the PA went off. 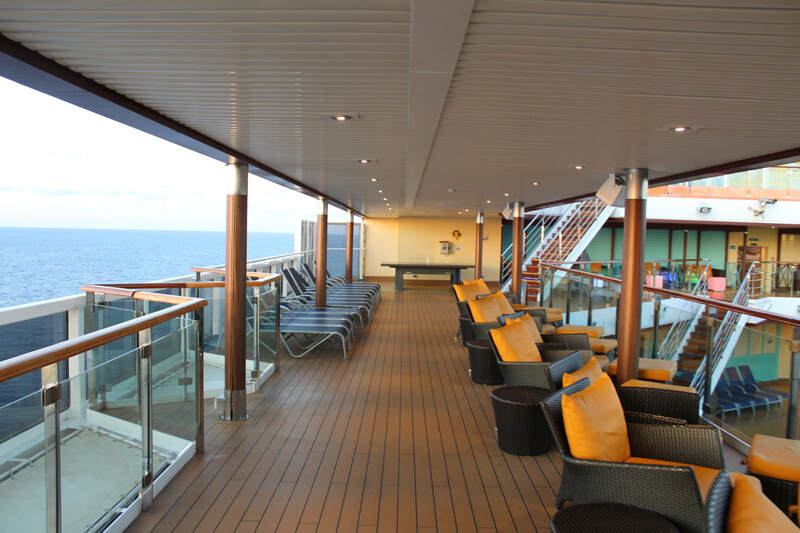 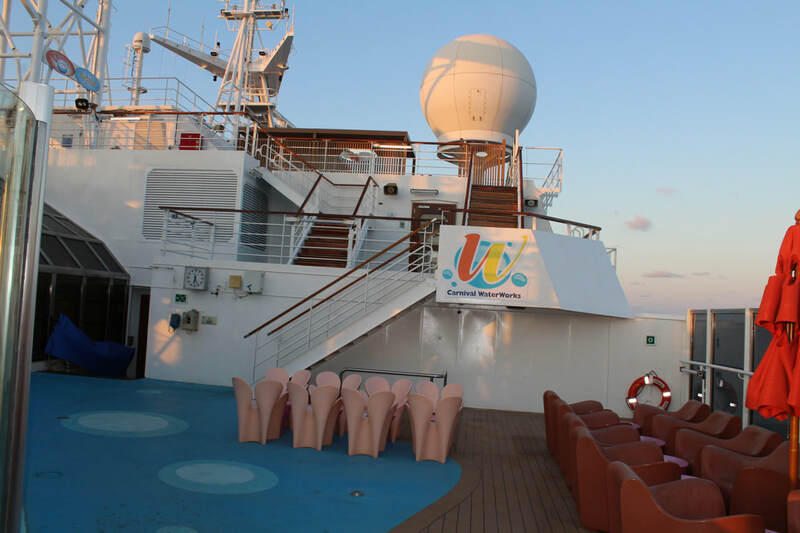 Typically, the PA is not broadcasted into the staterooms except in the event of an emergency announcement. 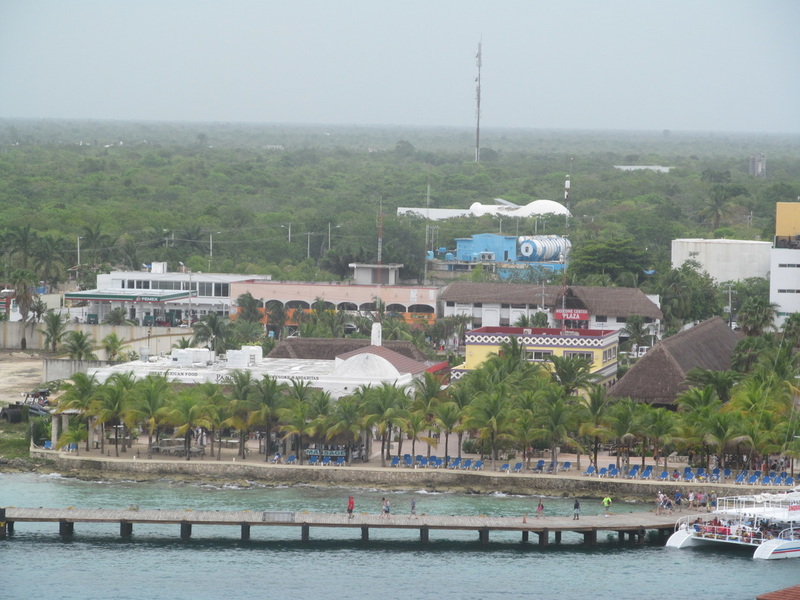 The announcement was by the cruise director and he told us were were turning around to head back to Cozumel. 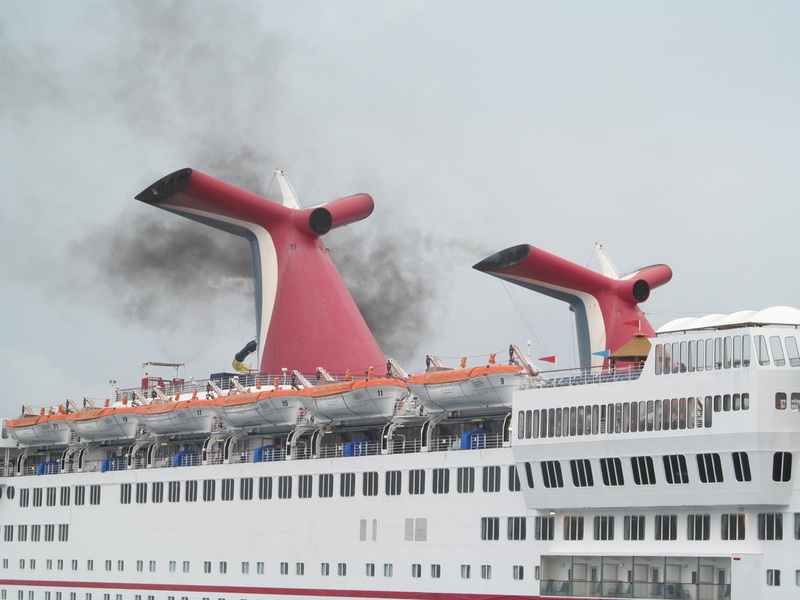 This was because a guest needed to be evacuated from the ship due to a medical reason. 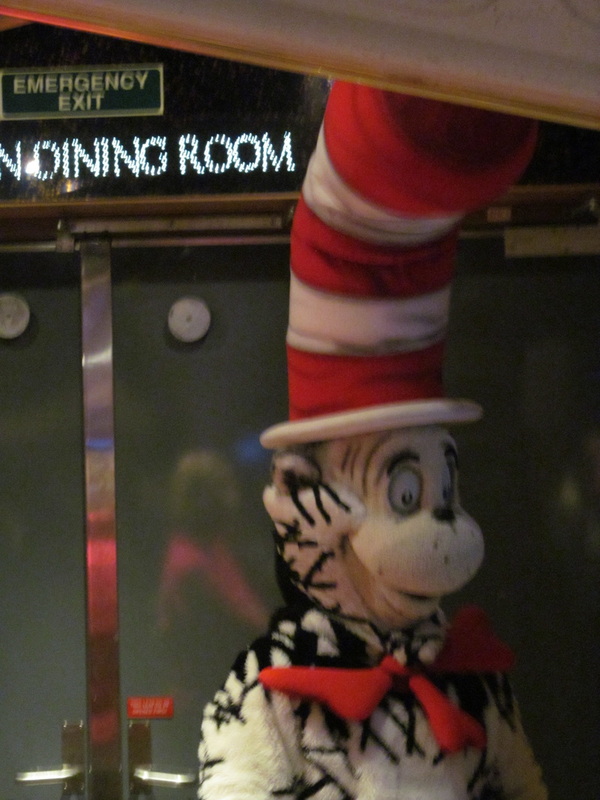 The announcement was very professional and sounded very sincere. 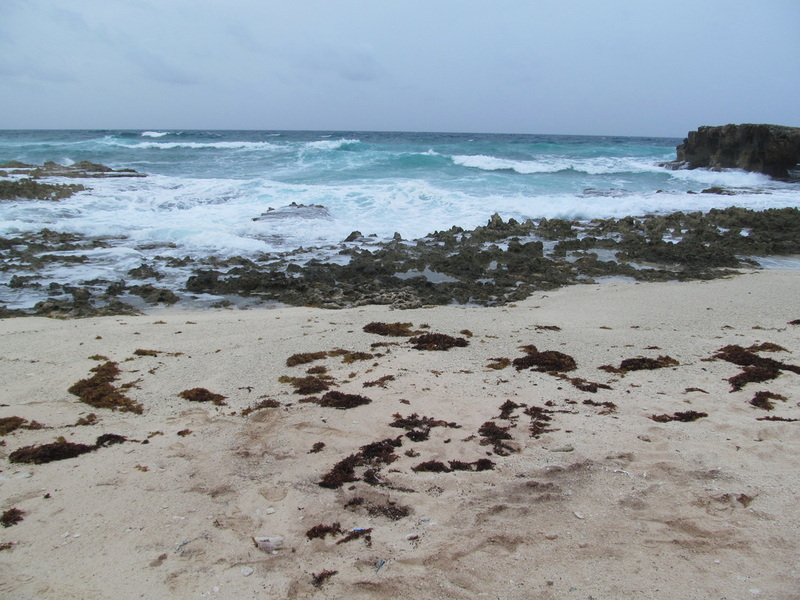 I immediately went outside to see if we had already turned around. 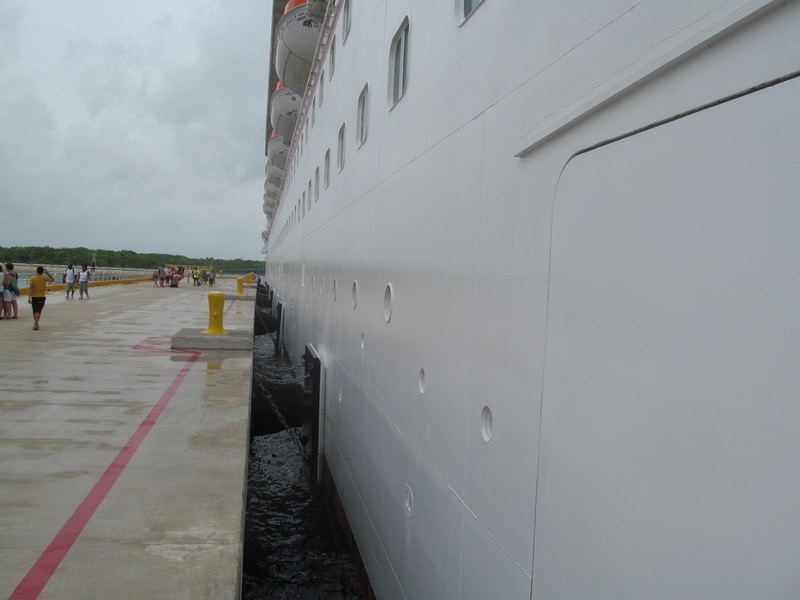 We must have turned around prior to the cruise director's announcement. 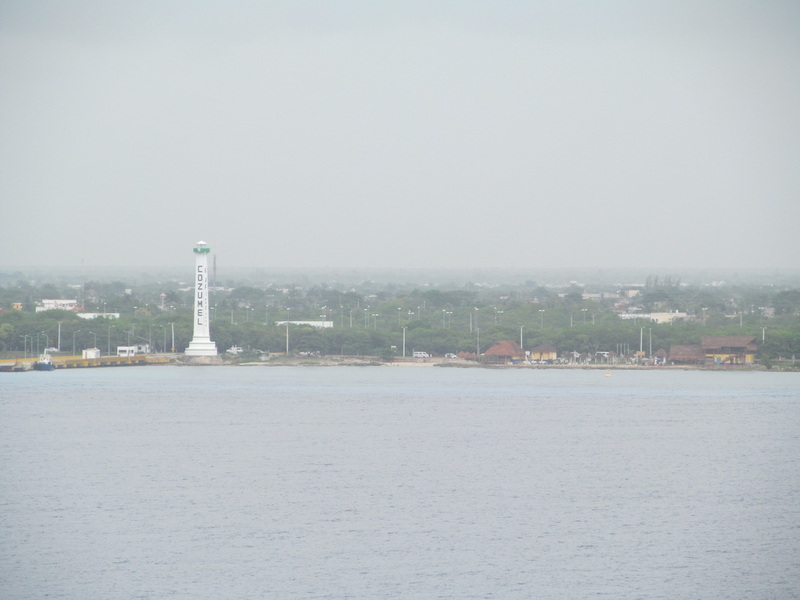 The Carnival Paradise sailed by as we head back towards Cozumel. 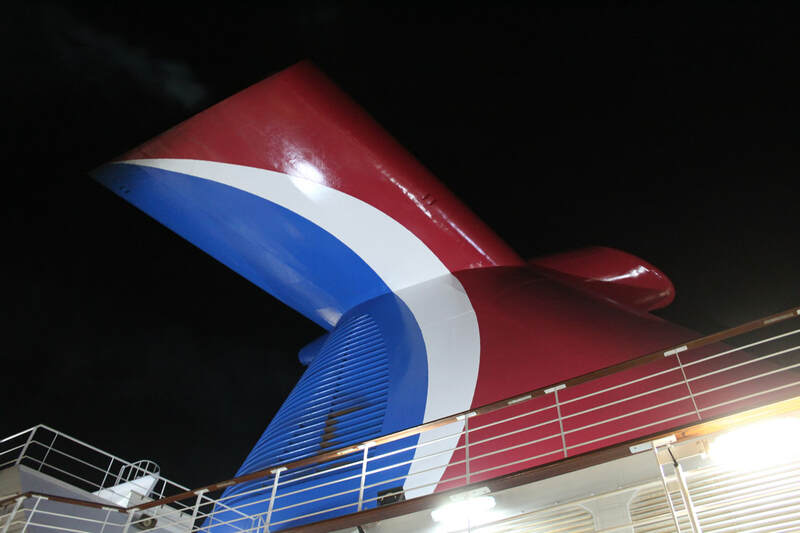 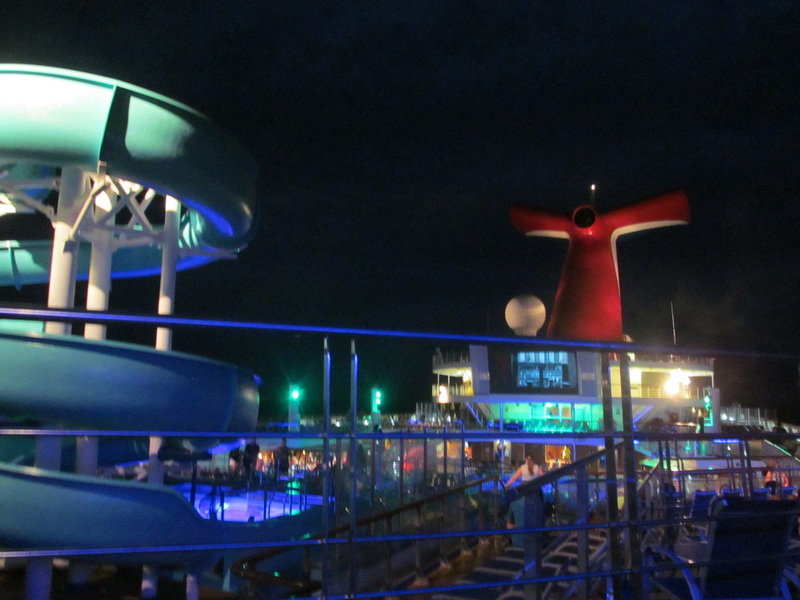 The ship was illuminated and I could see a few camera flashes go off as people took pictures of the Carnival Triumph. 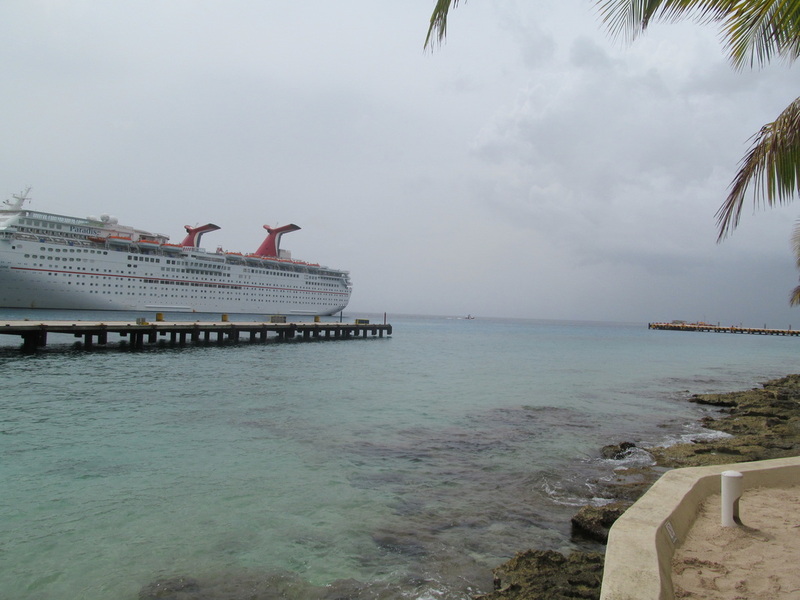 ​ Around 9:00pm, the lights of Cozumel could be seen as the Carnival Triumph pulled back into Cozumel's harbor. 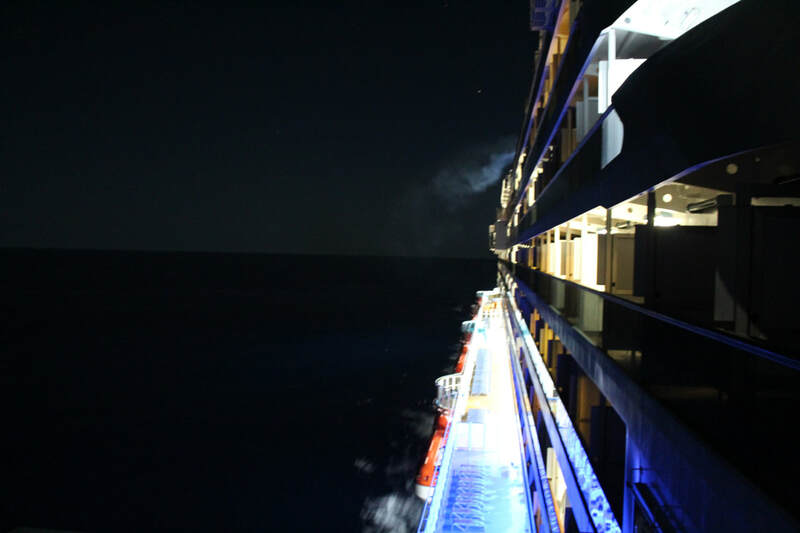 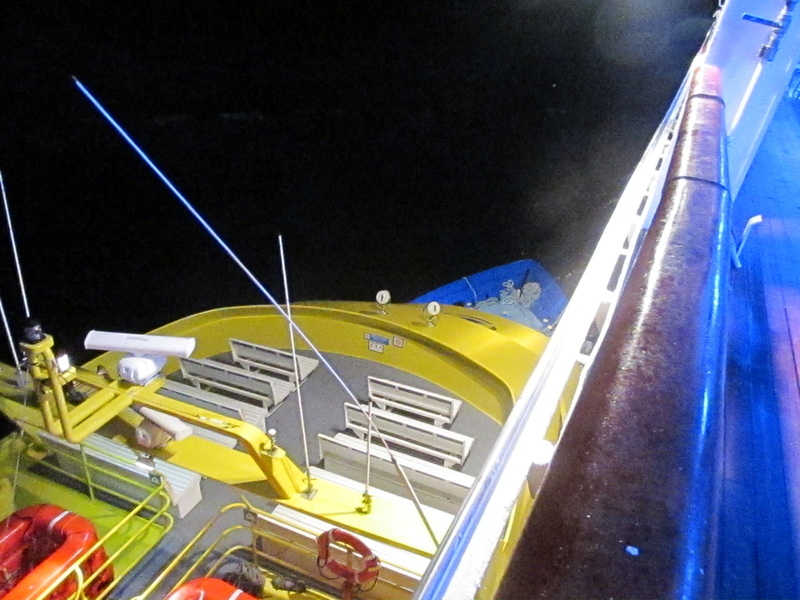 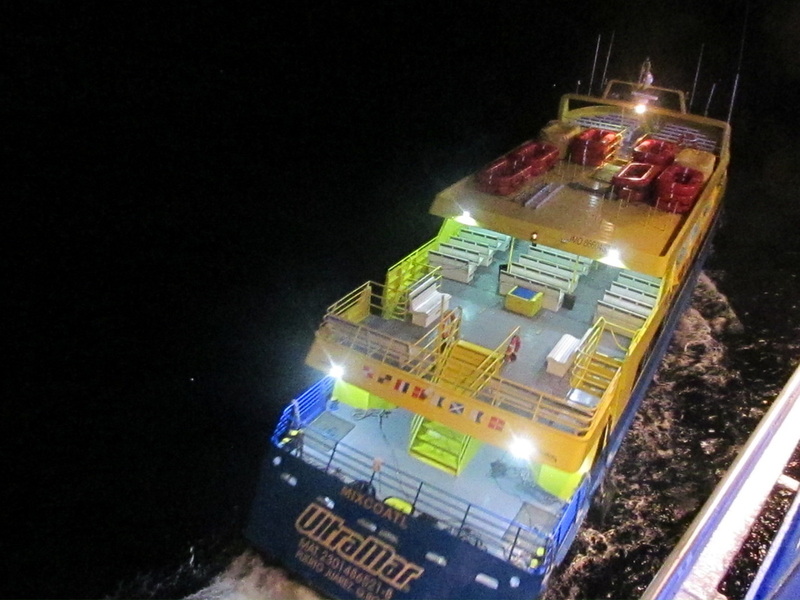 We sailed extremely slow and many of the ship's exterior lights were turned on. 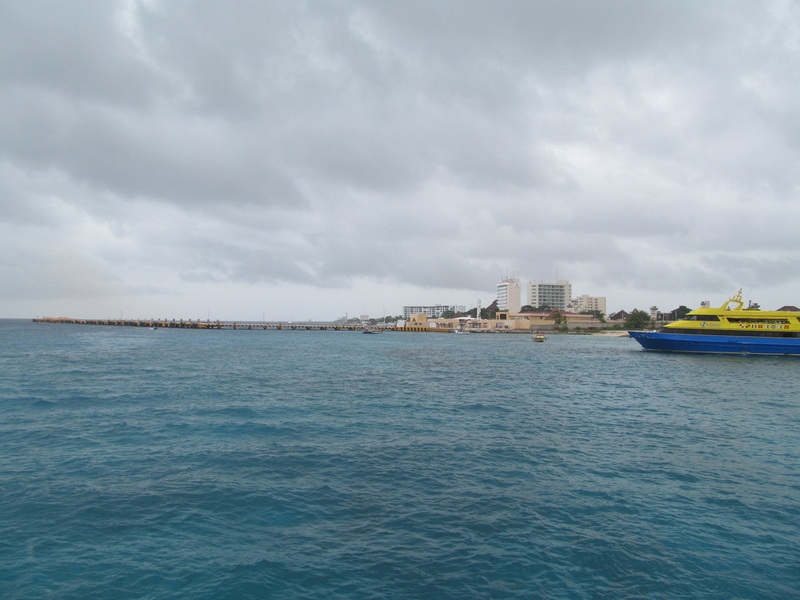 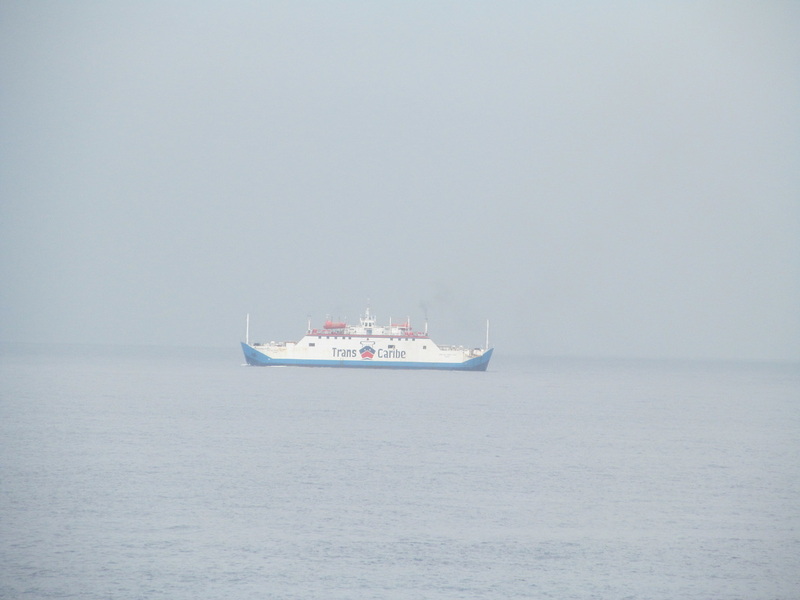 A boat that is typically used for shore excursions came to take care of the medical emergency. 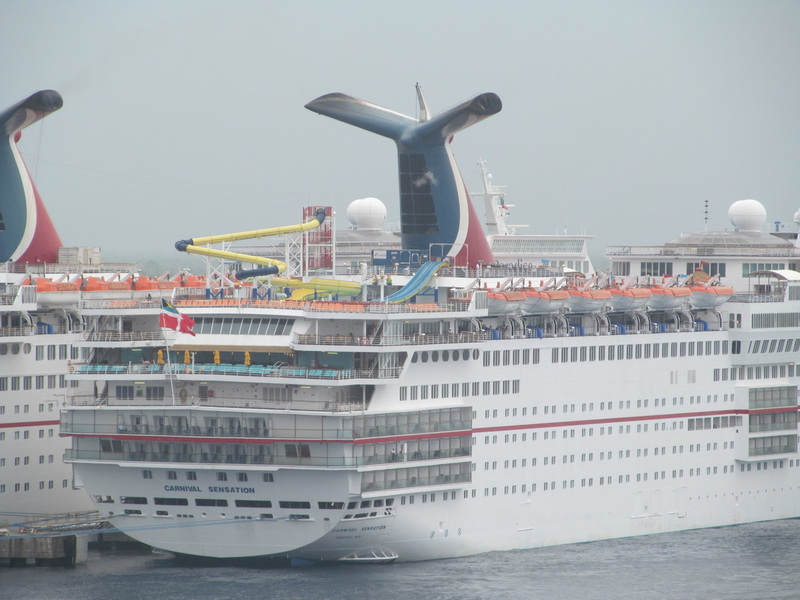 This boat scrapped the side of the ship as it approached. 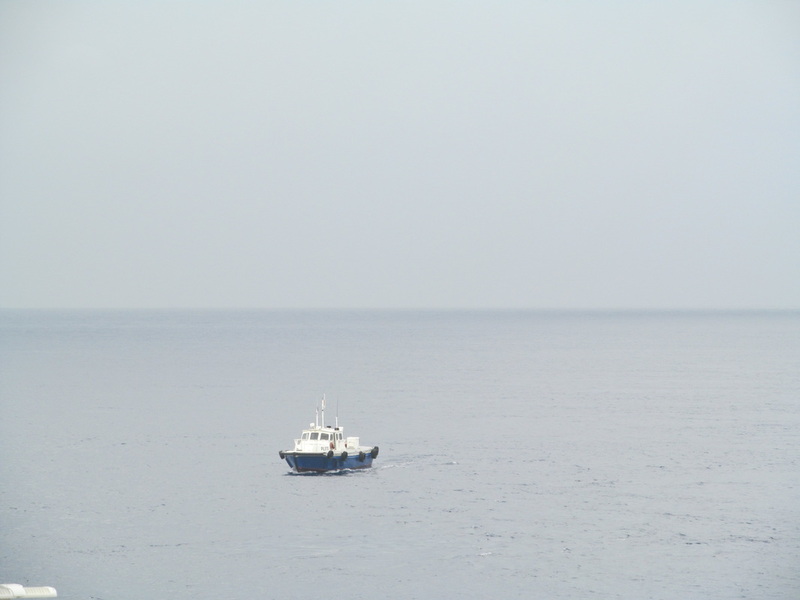 After a few minutes this boat was gone and the medical emergency was over. 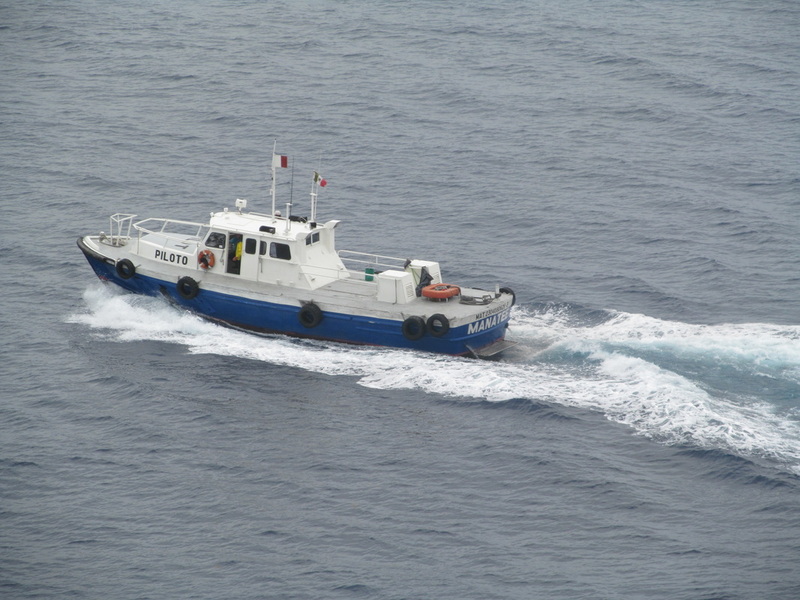 The pilot boat lingered around for a little longer and probably did a paperwork exchange. 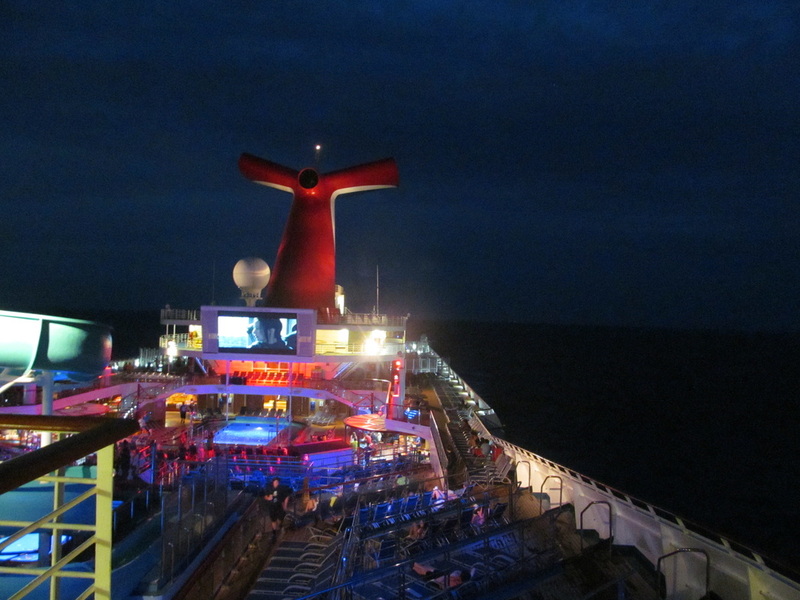 By 10pm, we were sailing back towards New Orleans. 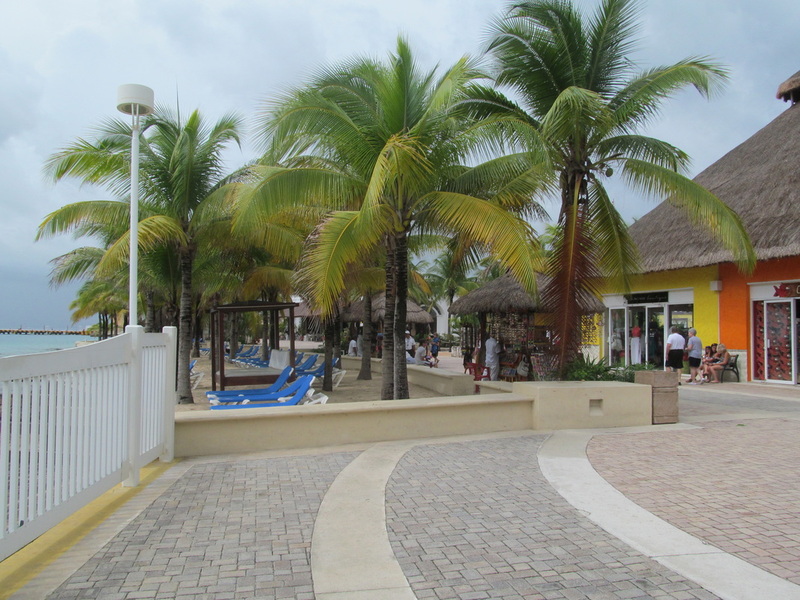 I hope the guest that needed evacuation is okay and will have a full speedy recovery. 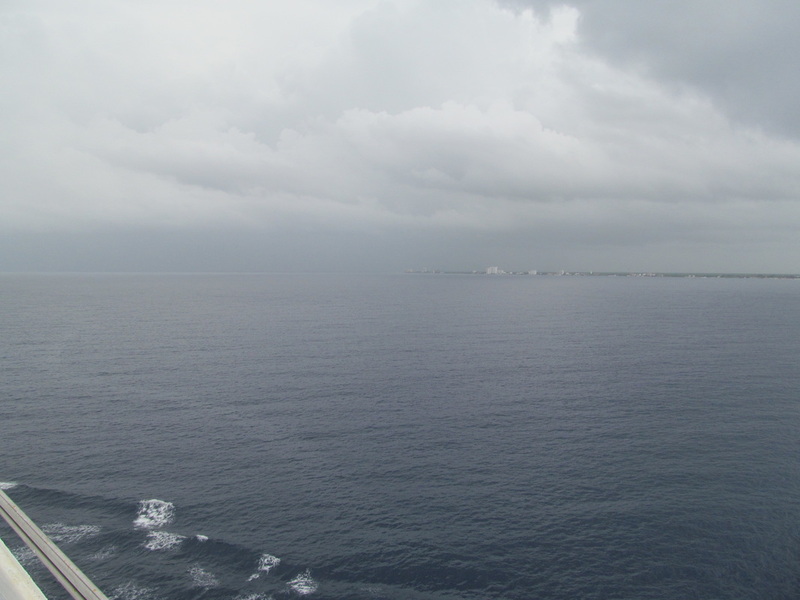 After the medical emergency was over, I went to bed. 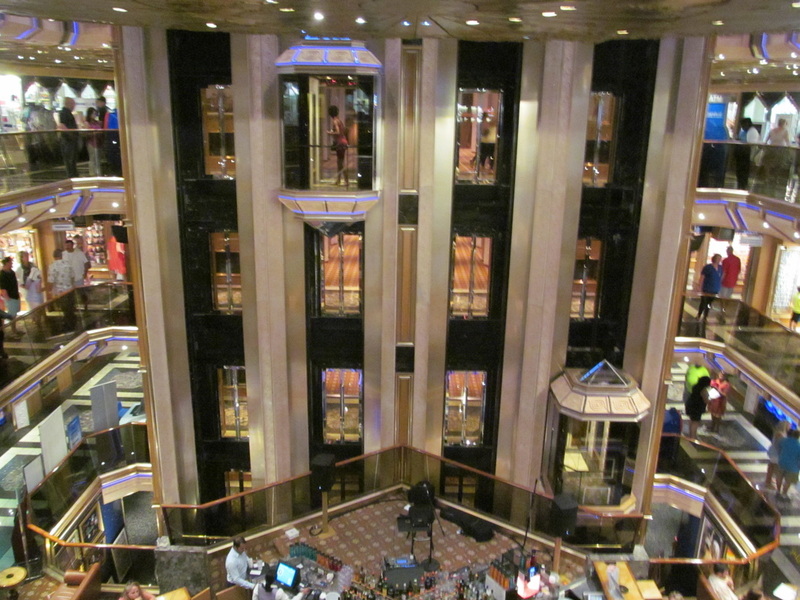 The music from the atrium was loud again, but I managed to fall asleep. 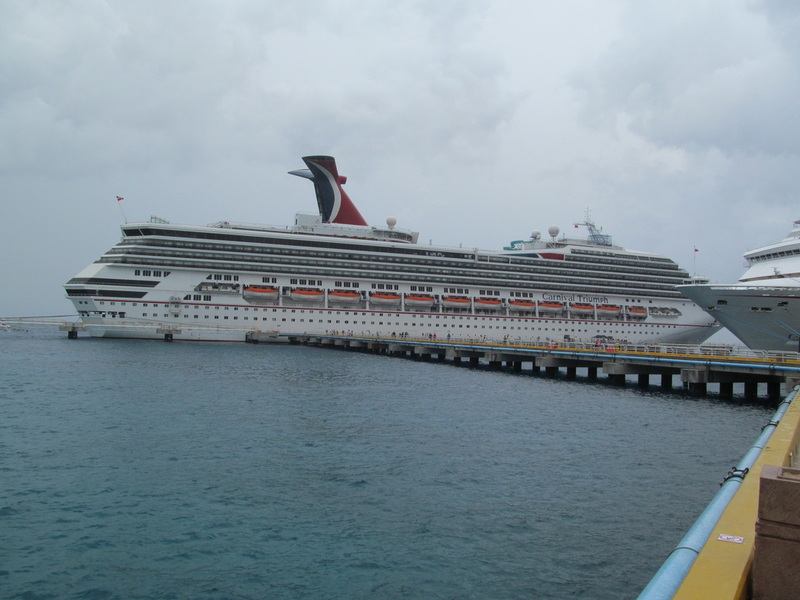 Continue To Day 4's Review! 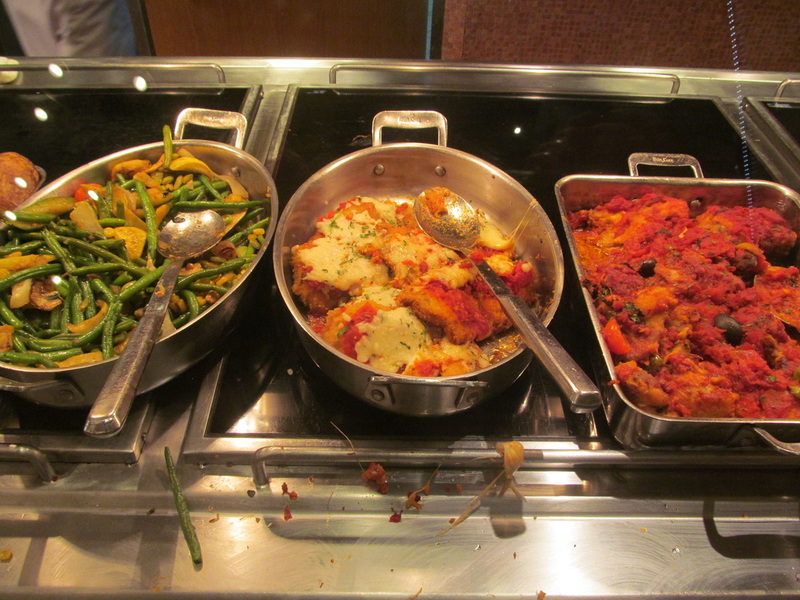 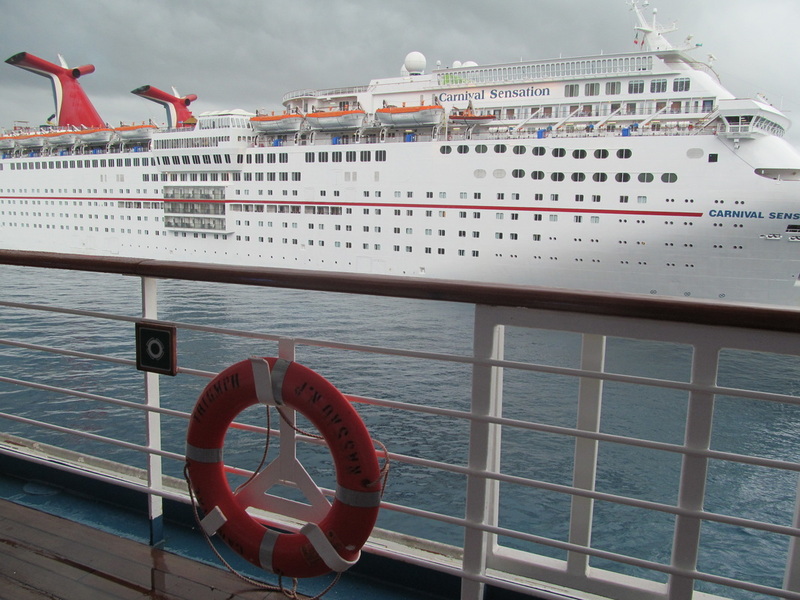 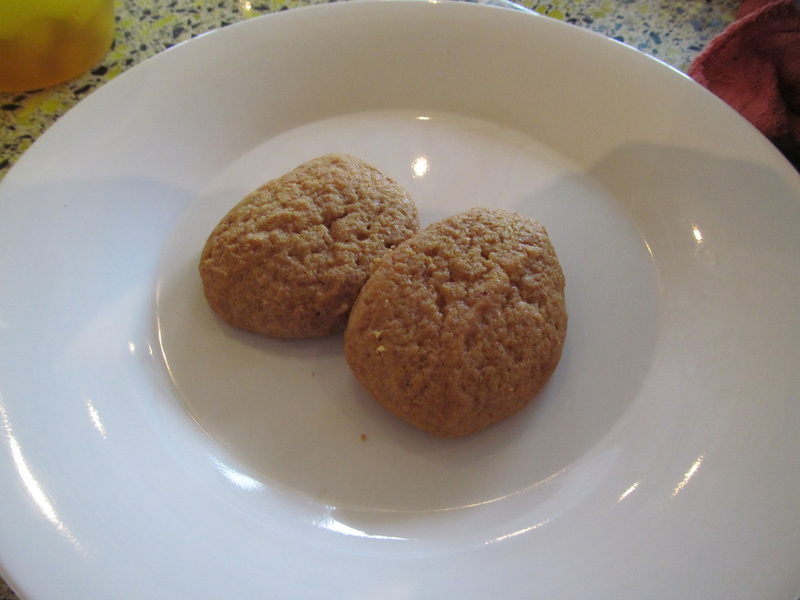 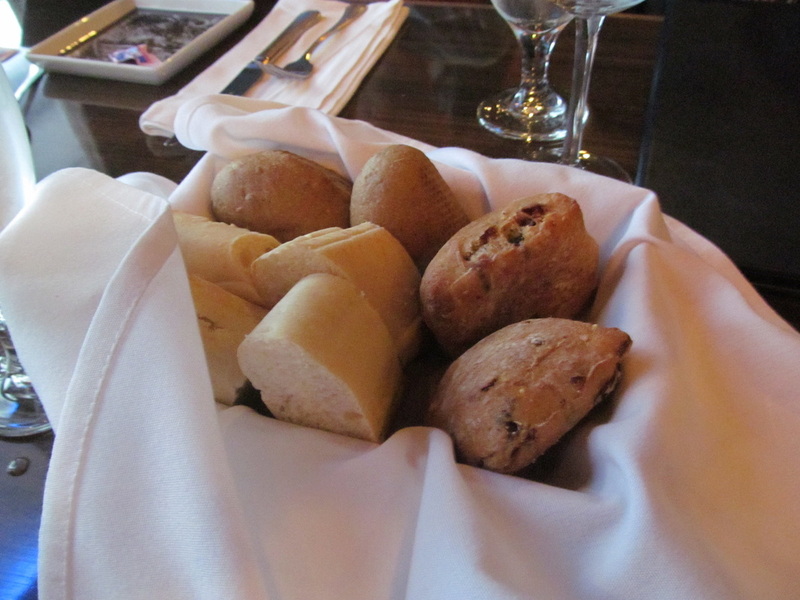 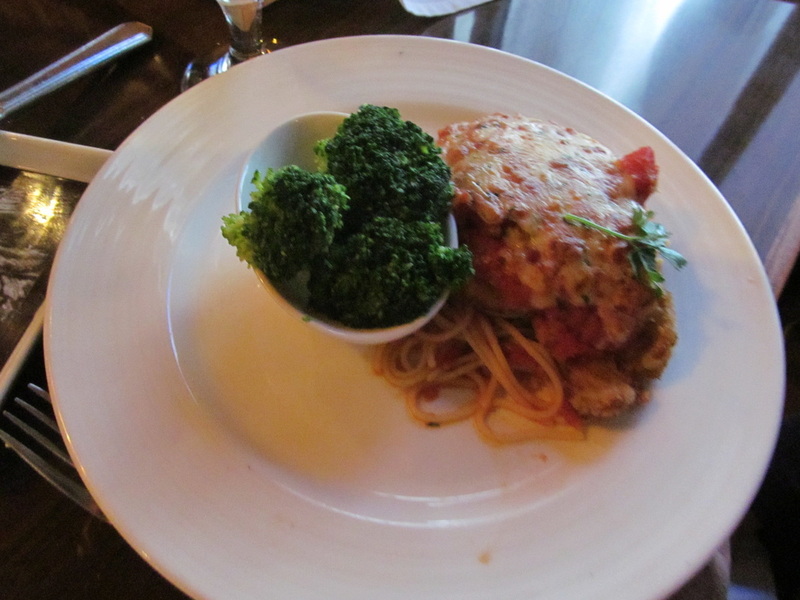 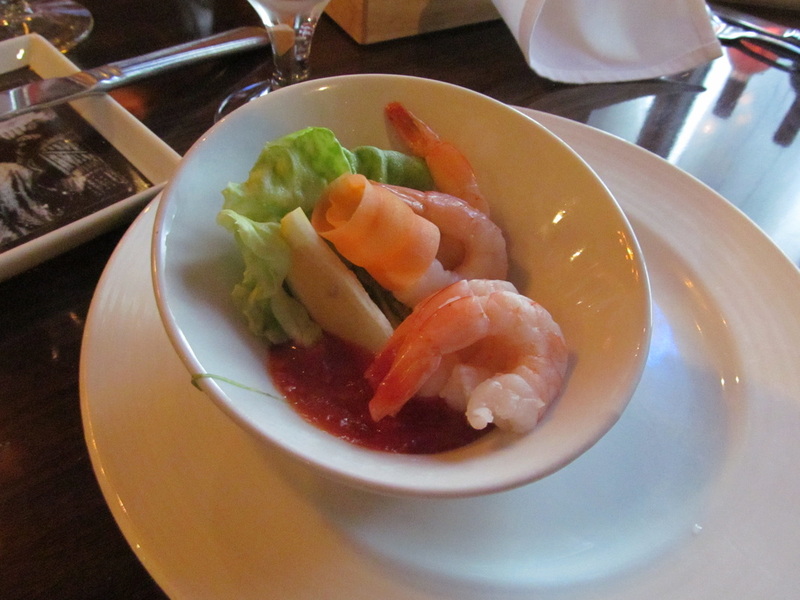 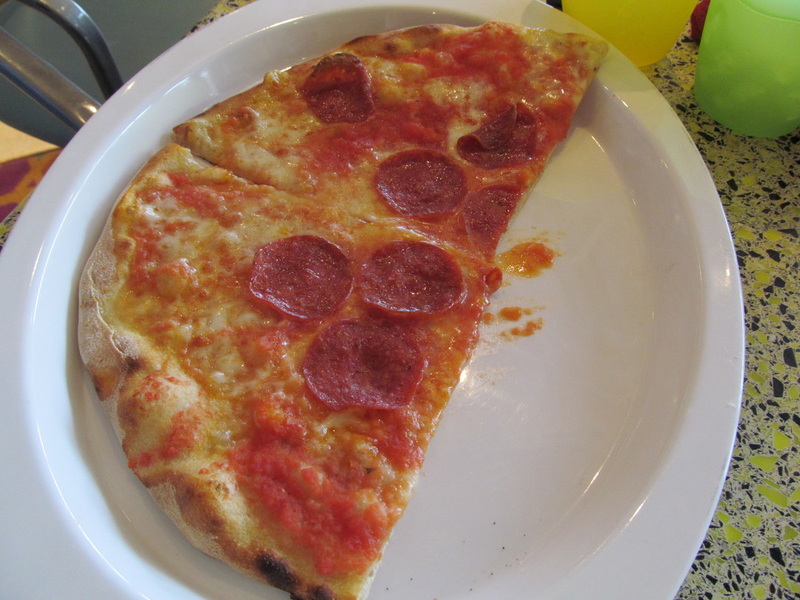 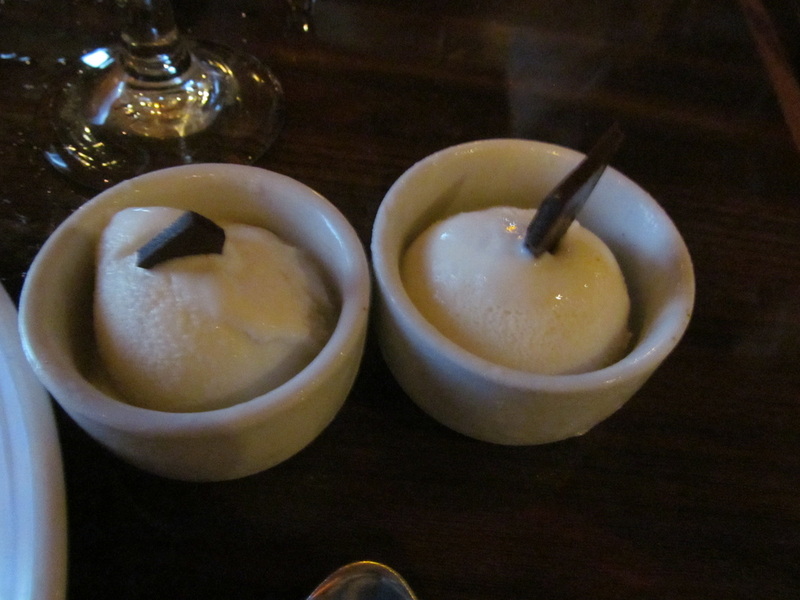 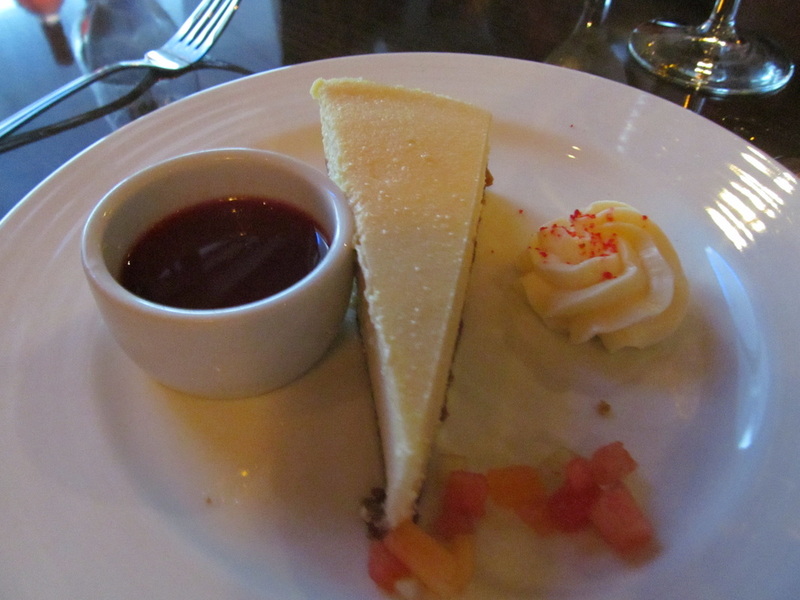 Click Here To Go To Day 4's Cruise Review!